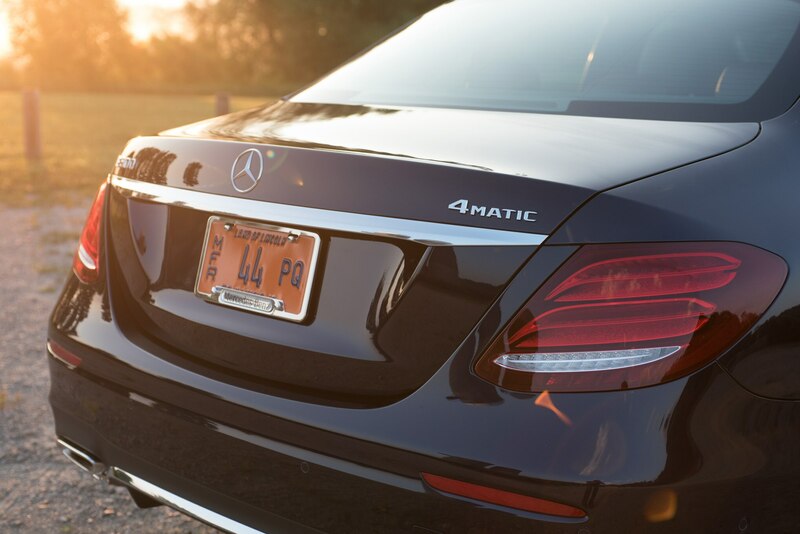 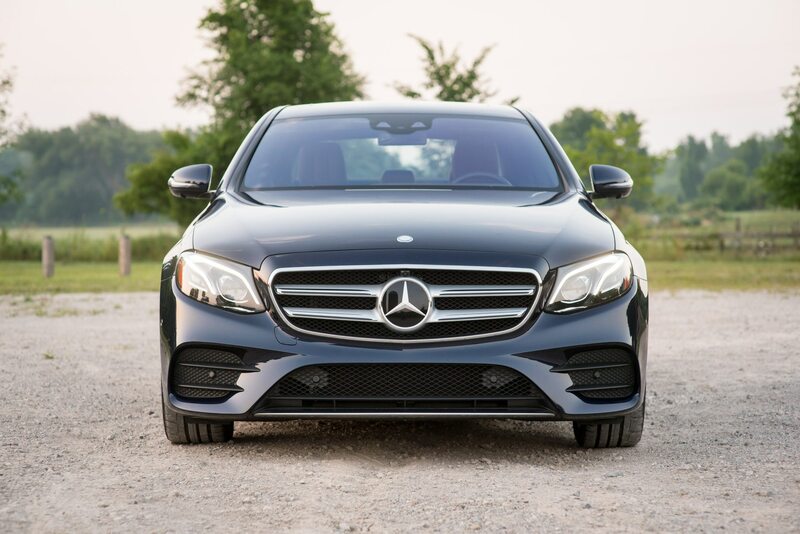 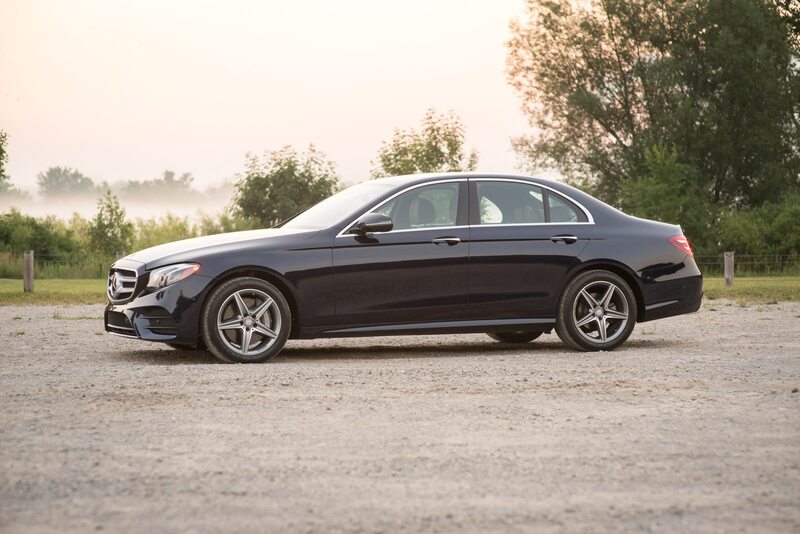 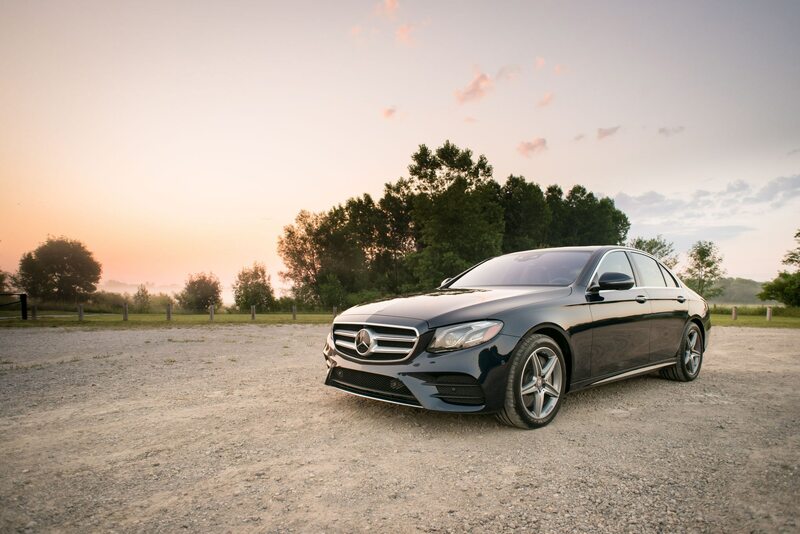 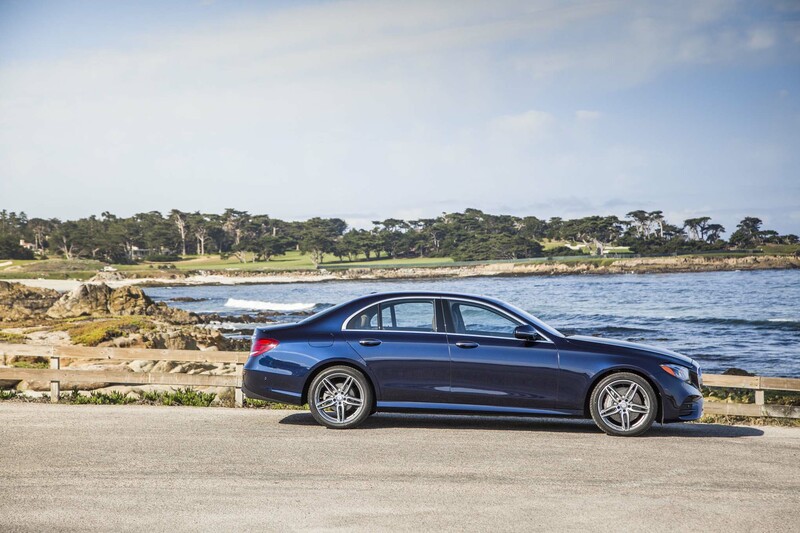 Our 30-day stint with the 2017 Mercedes-Benz E300 4Matic included commutes along broken city streets, family excursions into rural communities, and highway journeys across the great state of Michigan. 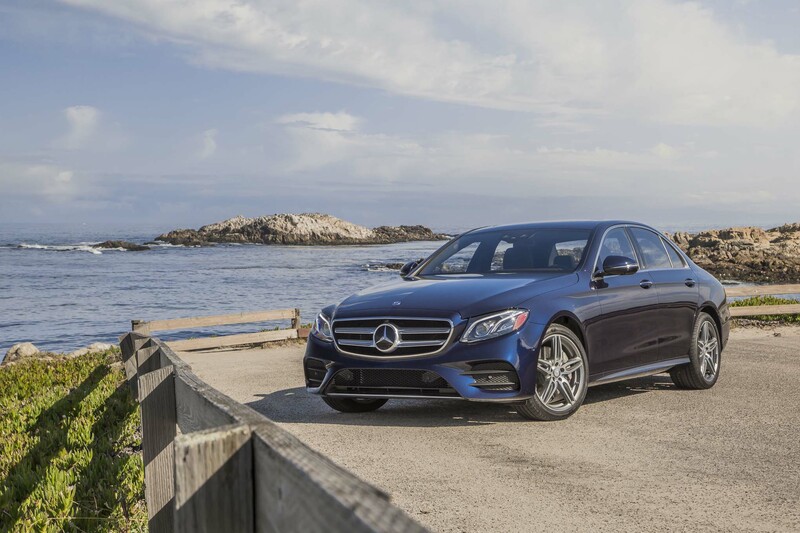 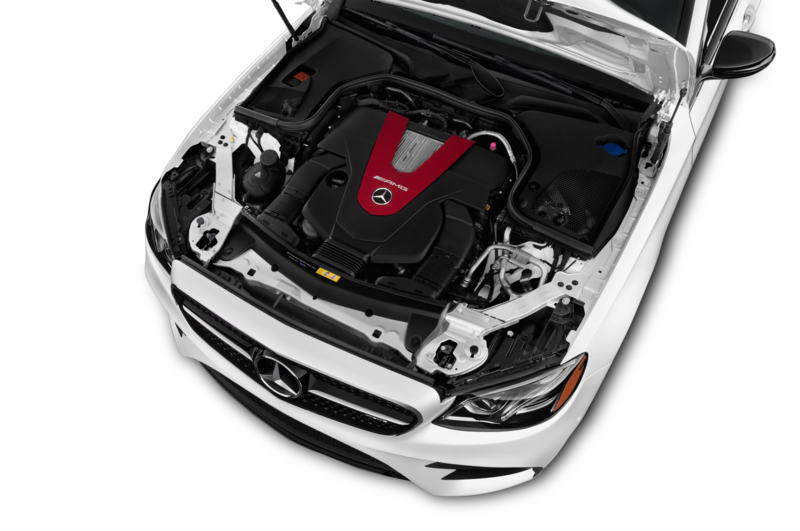 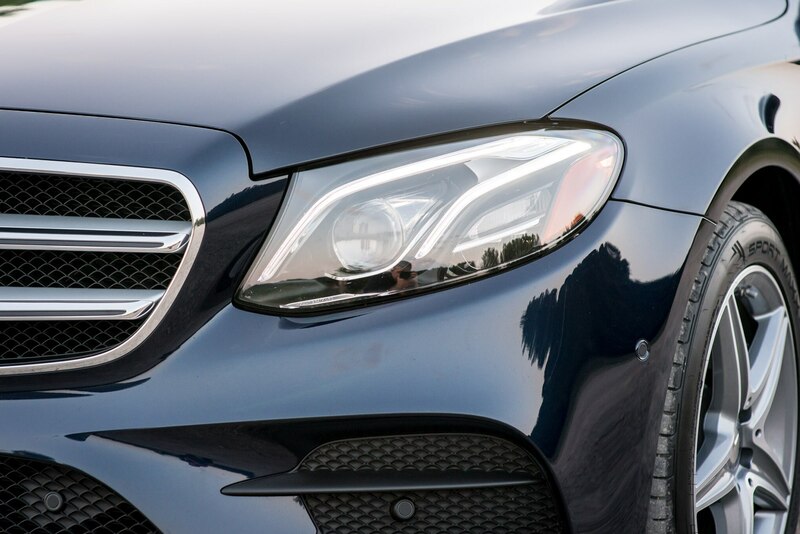 This extended stay was valuable, allowing us to properly dissect the technically-sophisticated, all-new midsize Mercedes and assess if a four-cylinder gasoline engine can actually work in an E-Class. 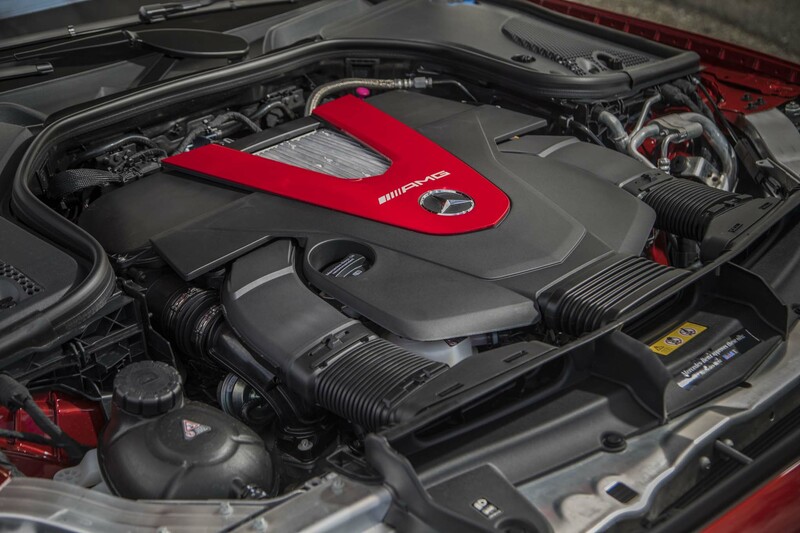 Let’s deal with the elephant in the room, the engine, straight away. 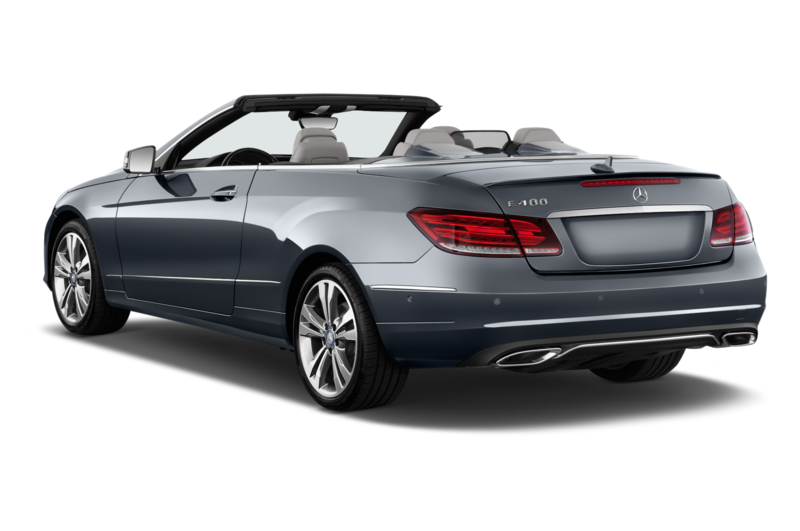 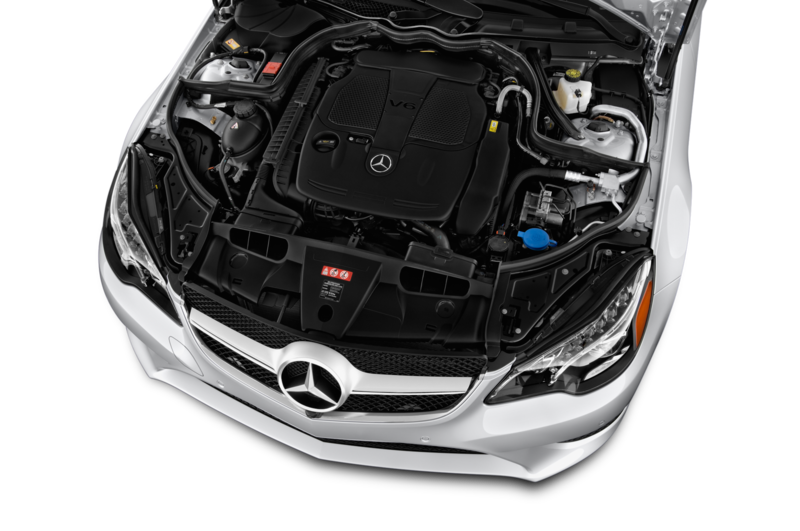 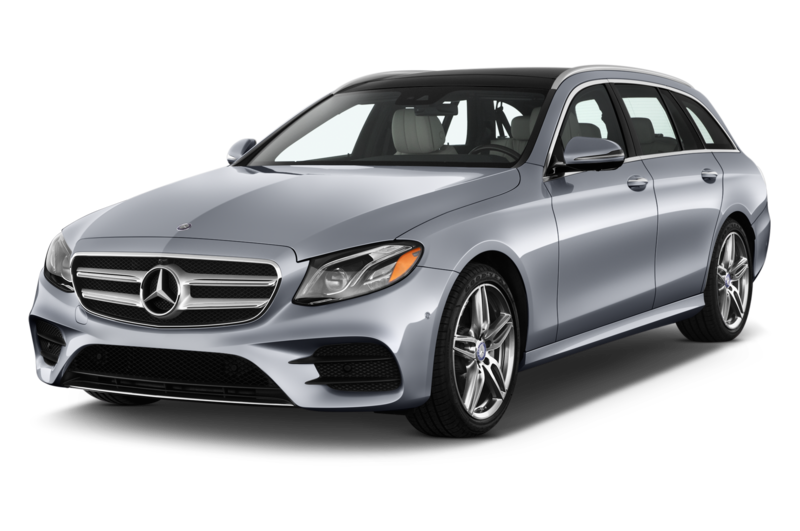 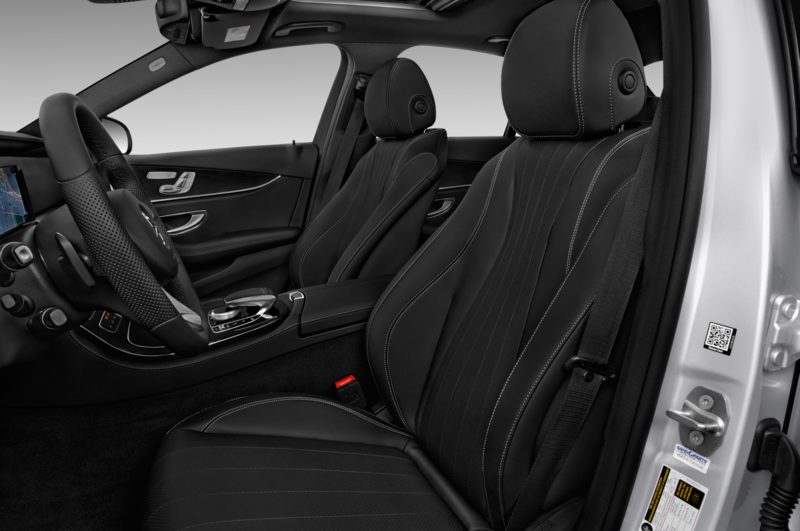 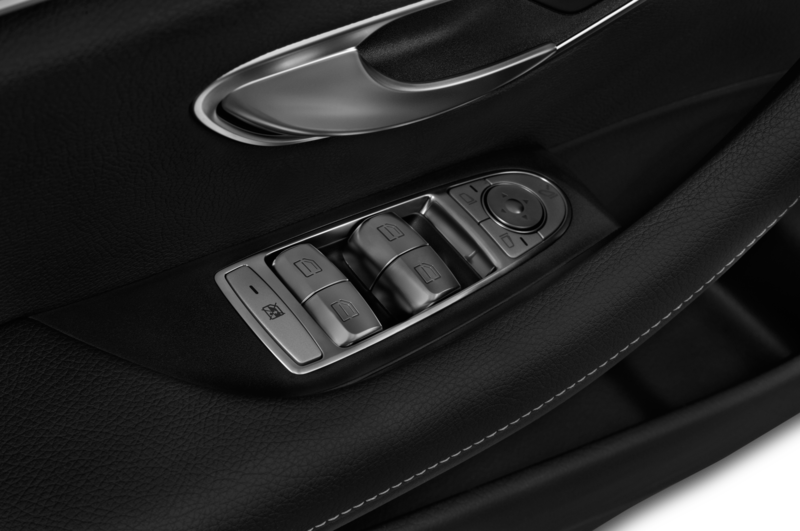 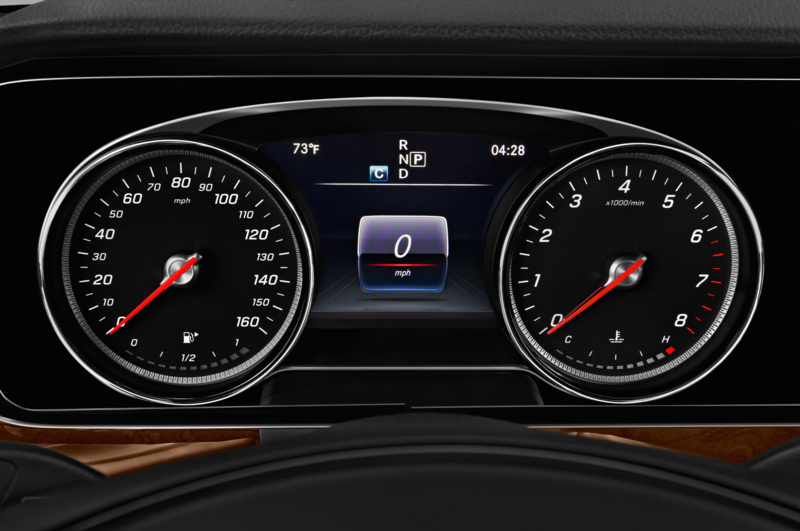 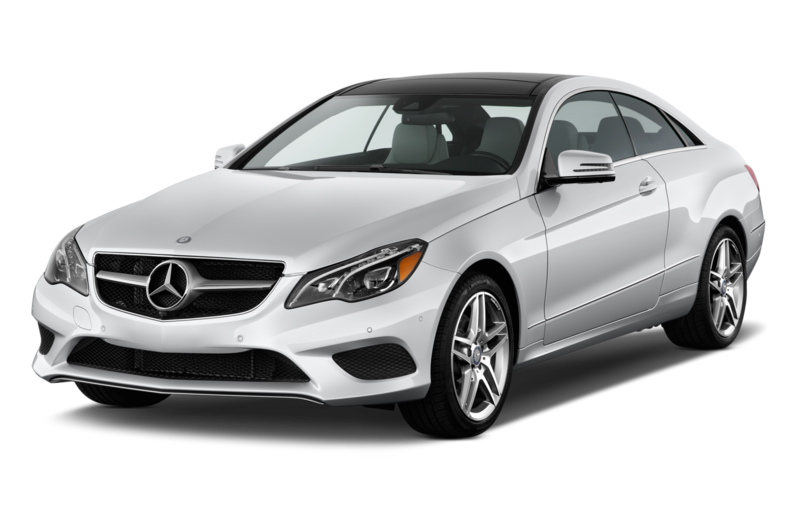 The new 2.0-liter turbocharged four-cylinder and 9-speed automatic combination in the E300 works well in normal driving. 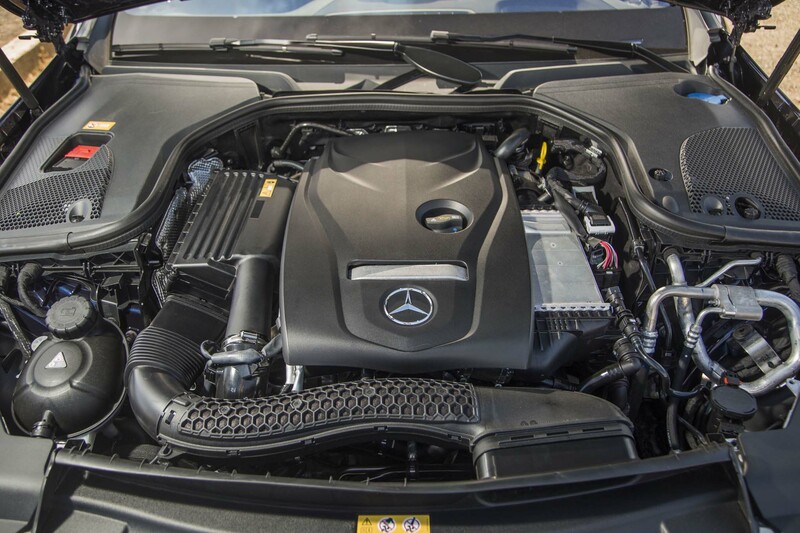 There’s only the occasional low-speed hesitation that annoys, when the engine is caught off boost and the transmission has chosen too tall of a ratio. 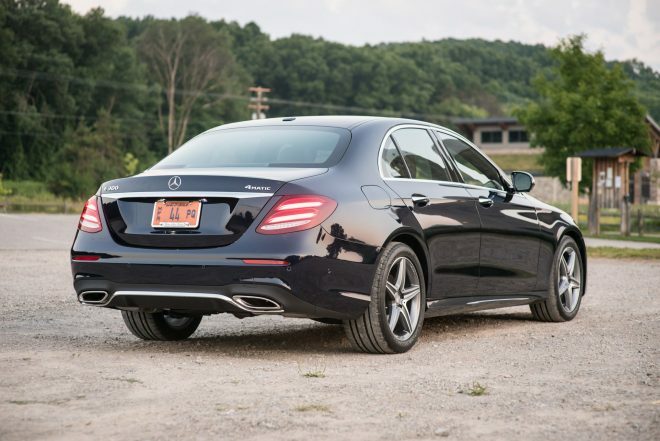 Pushing the Mercedes harder does reveal one other negative. 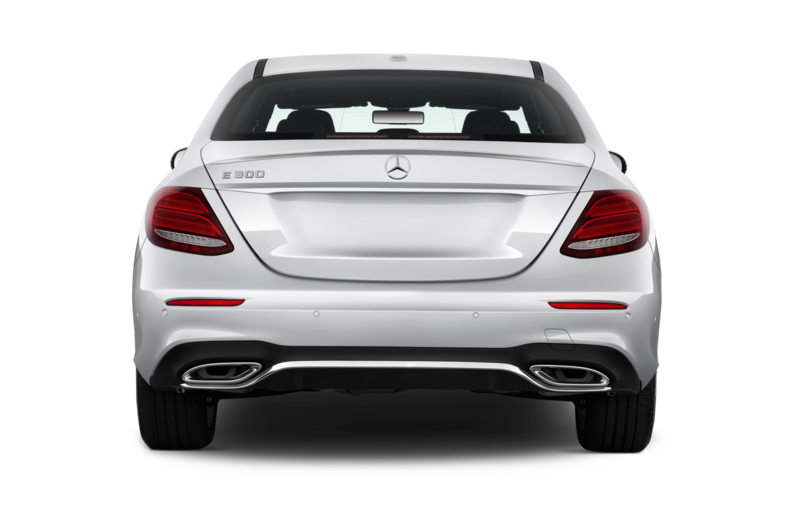 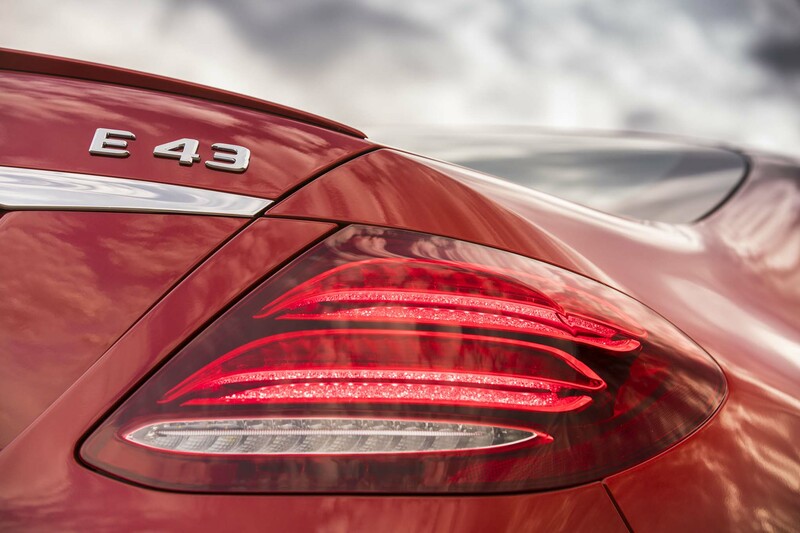 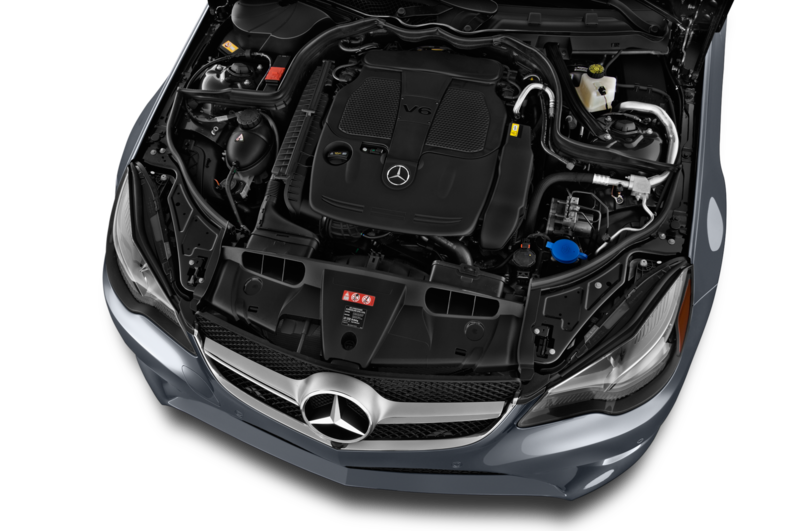 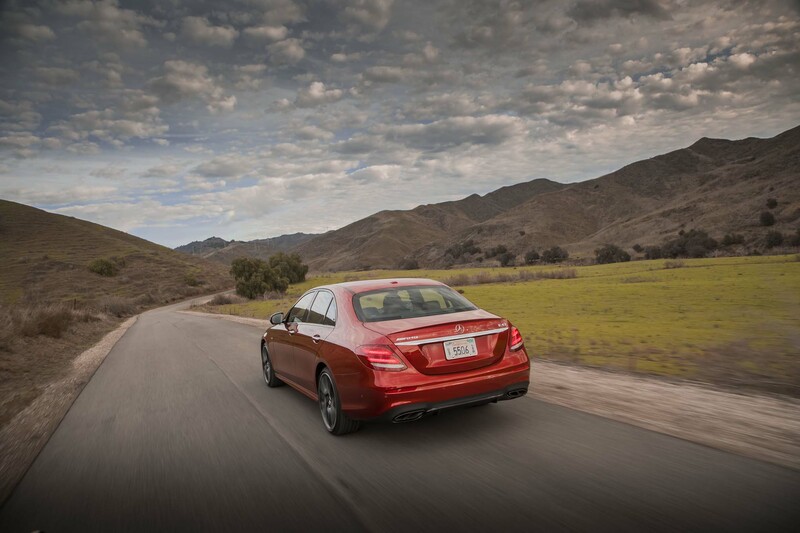 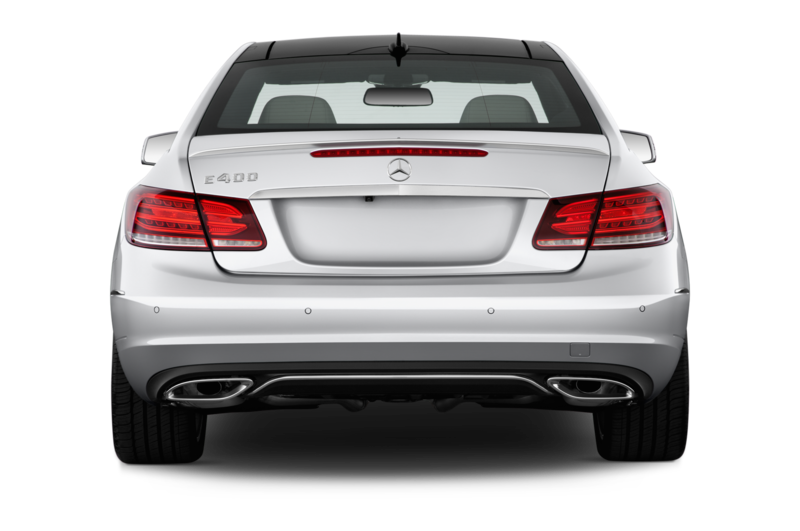 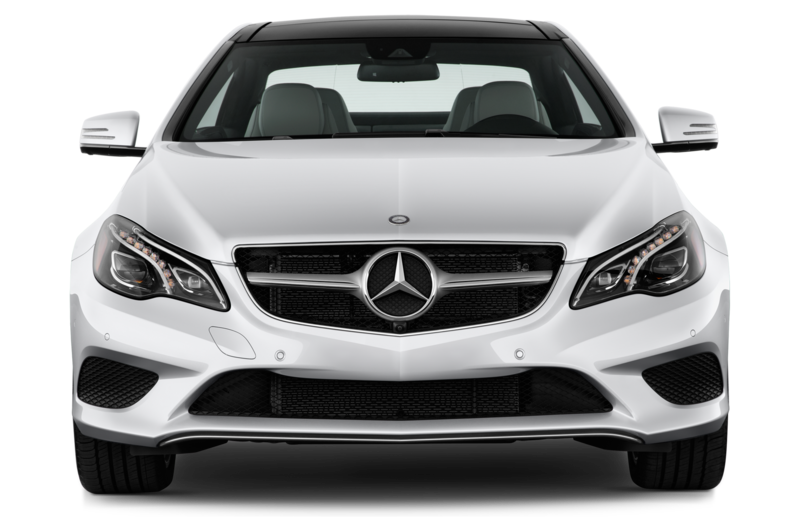 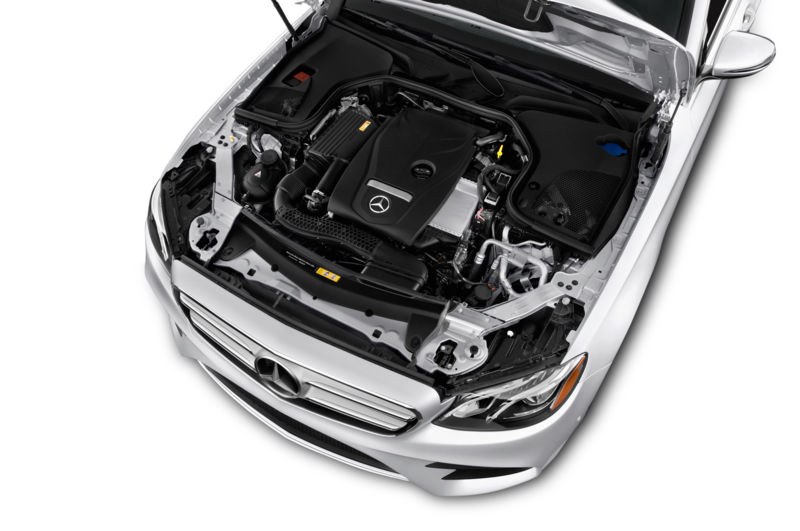 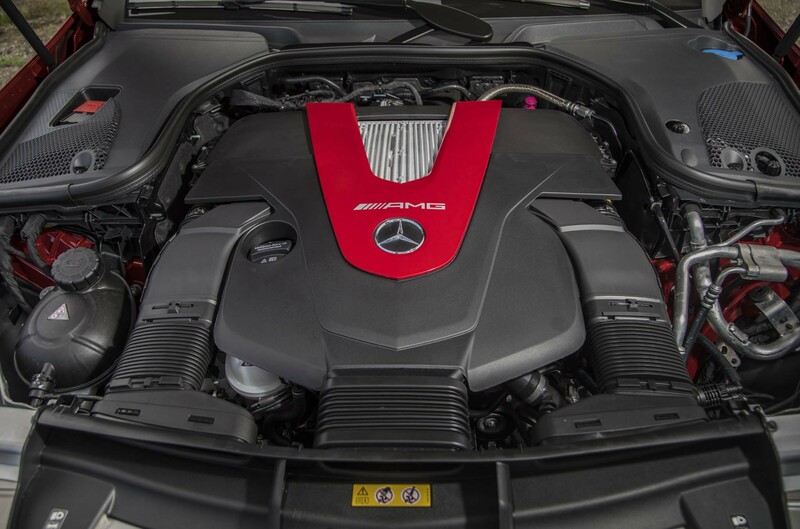 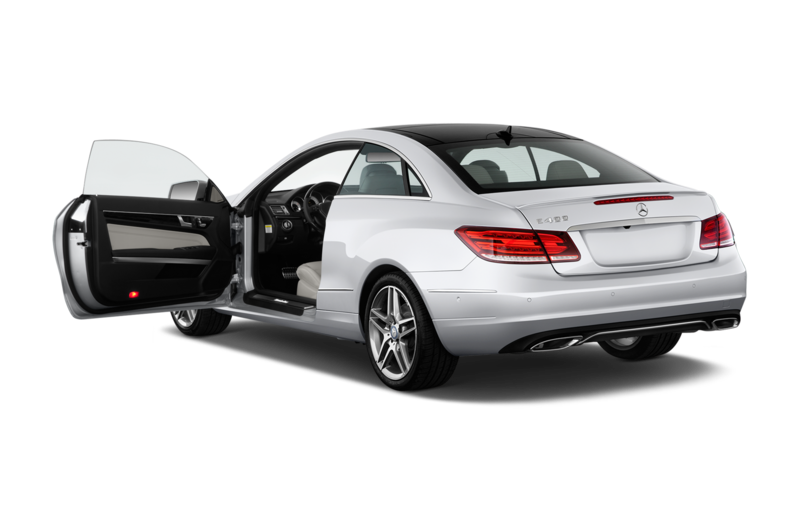 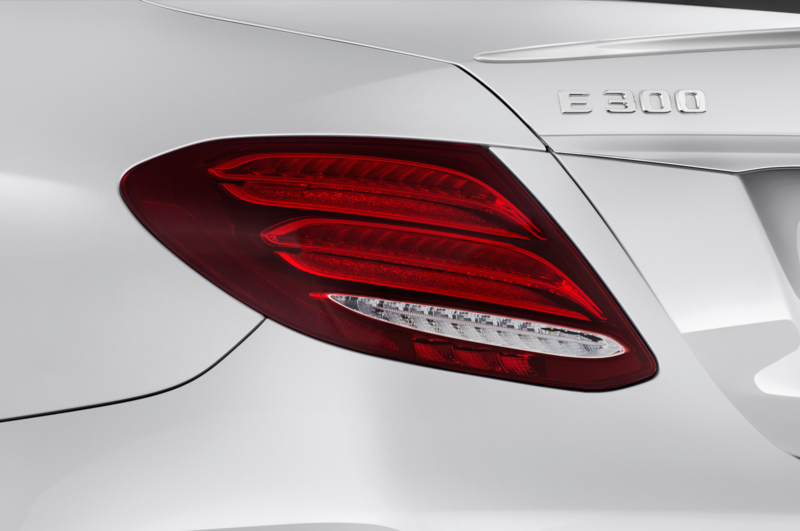 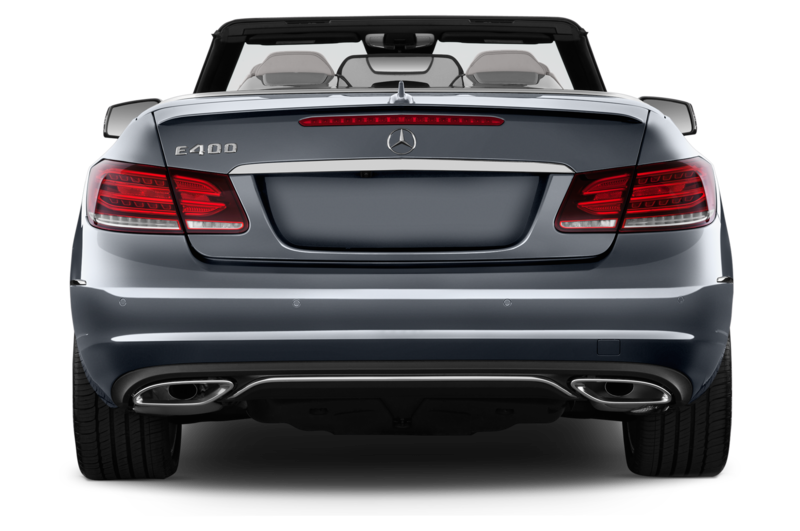 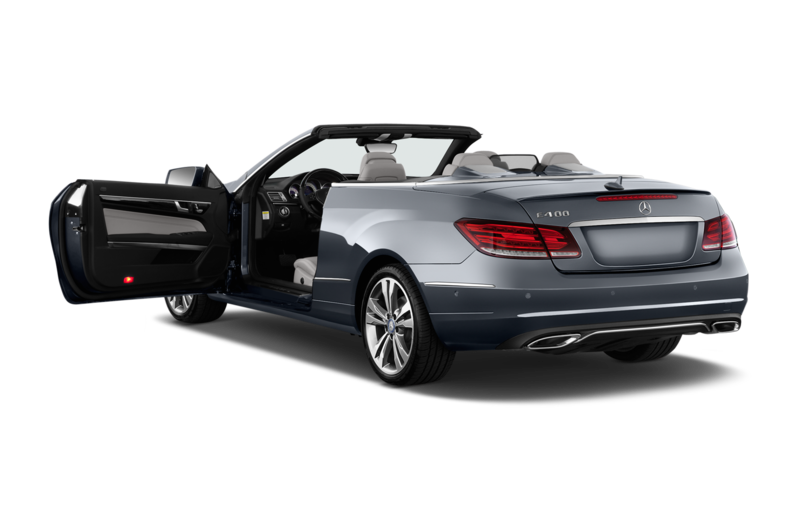 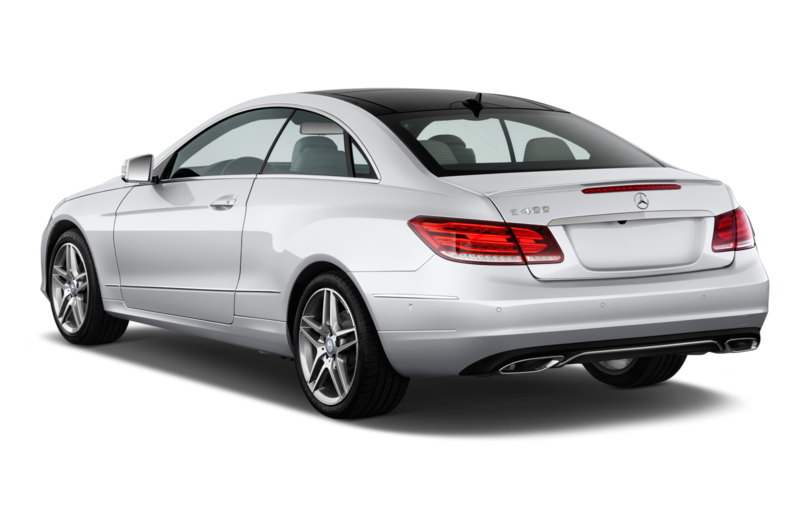 The old entry-level E-Class, the E350, delivered 302 hp from its naturally aspirated, 3.5-liter V-6. 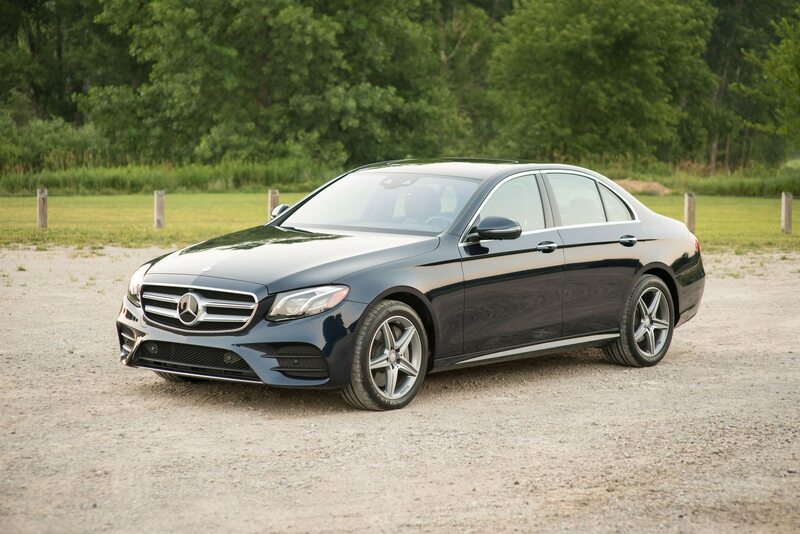 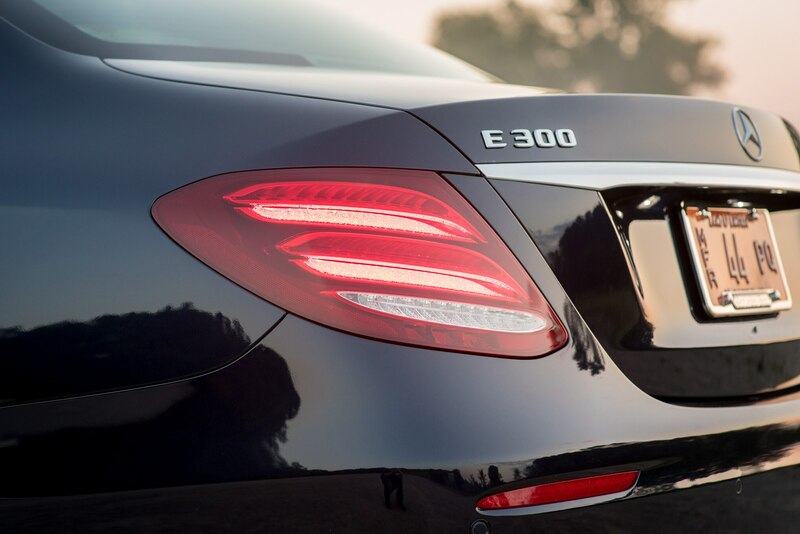 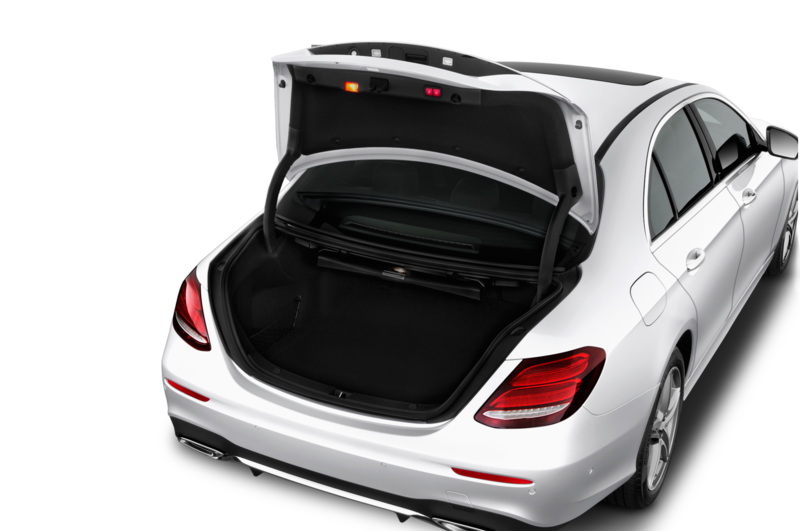 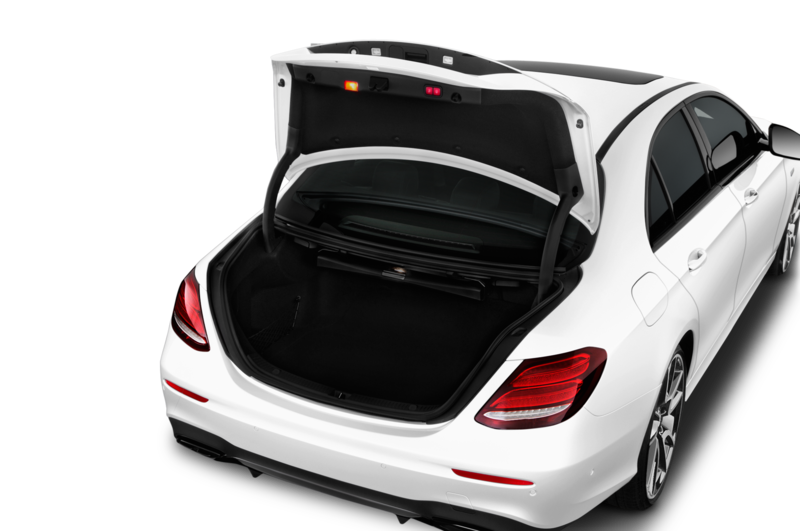 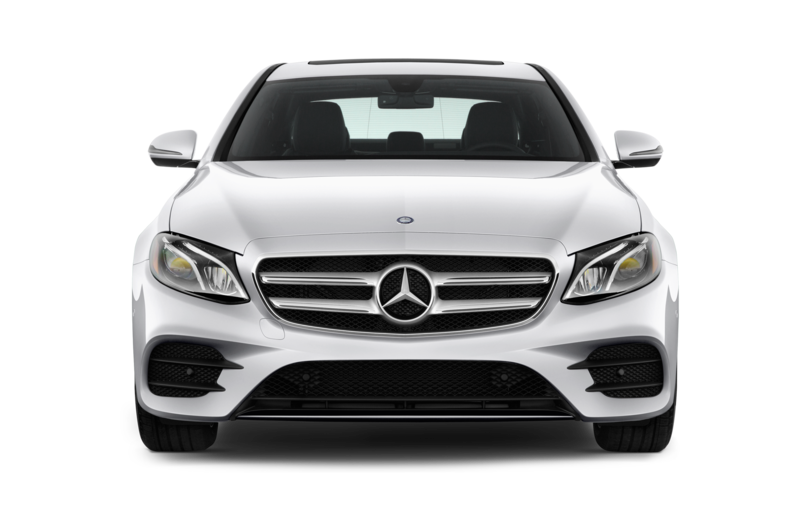 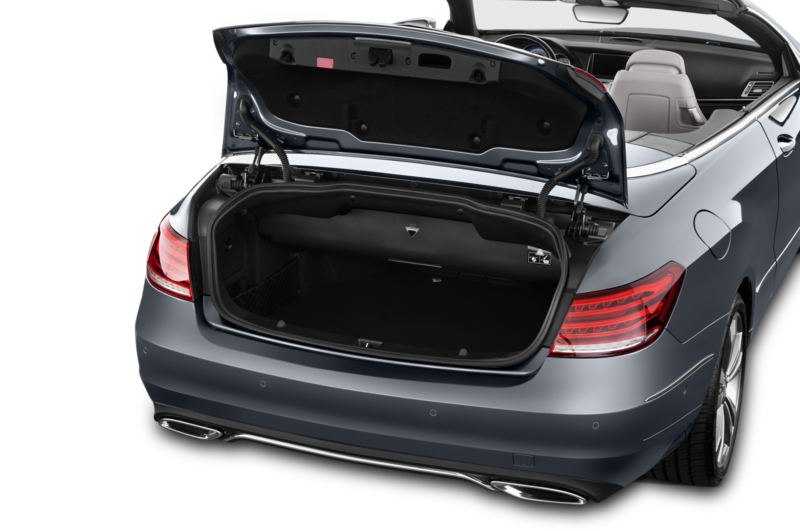 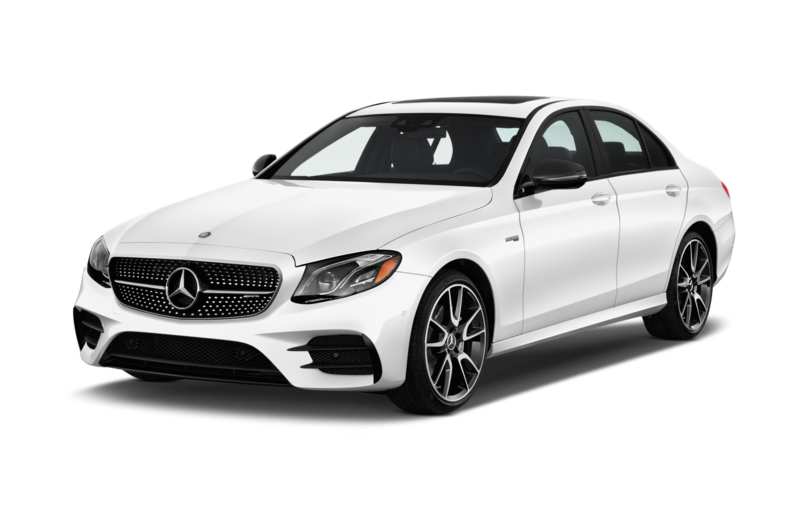 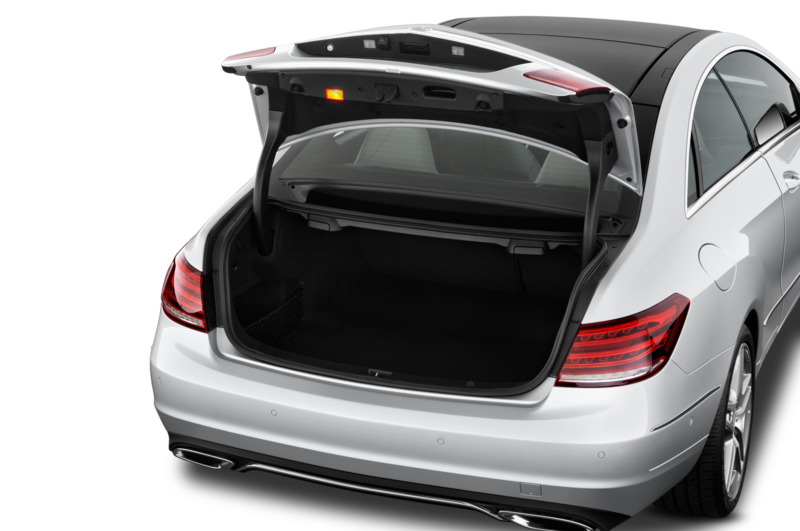 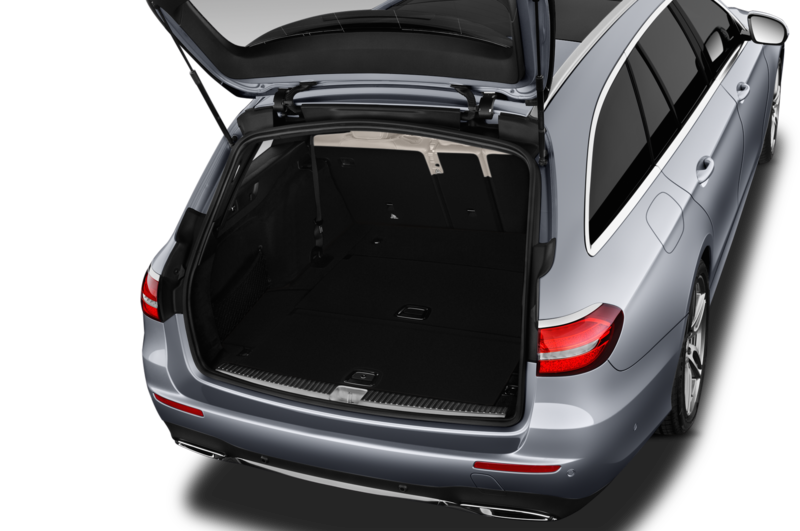 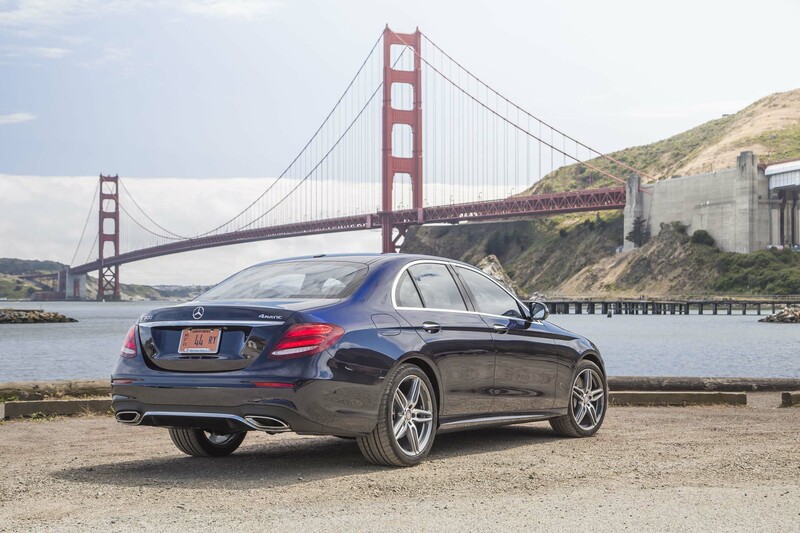 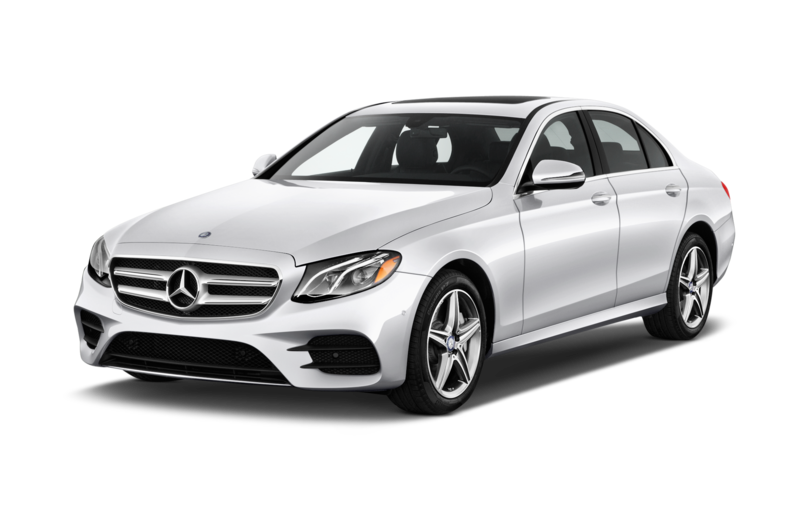 Two extra gears in the E300’s transmission can’t hide a loss of 61 horsepower or the slight drone of the four-cylinder engine during heavier throttle applications. 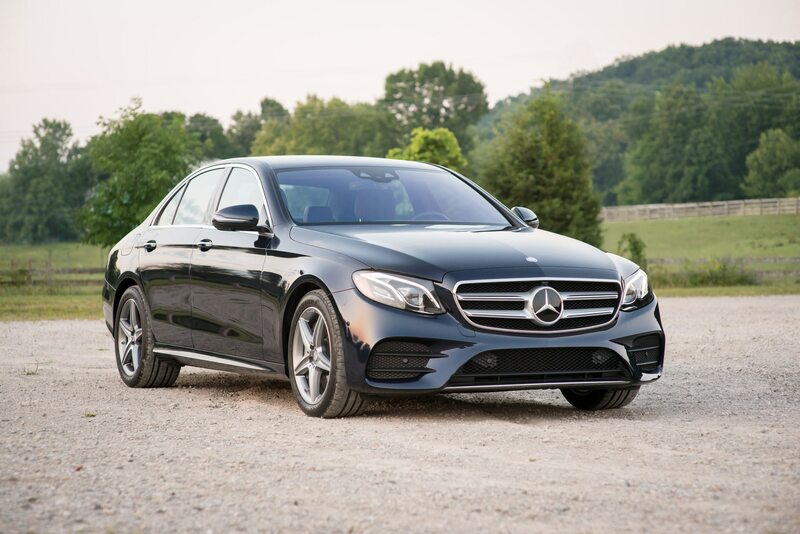 The relaxed nature of the E300 combined with impressive low-end torque means this won’t likely be an issue for less-sporting buyers in most driving condition, but we still wish Mercedes also offered a mid-range, luxury-focused E-Class sedan like the E400 in the States instead of jumping from the E300 straight to the upcoming 396-hp Mercedes-AMG E43. 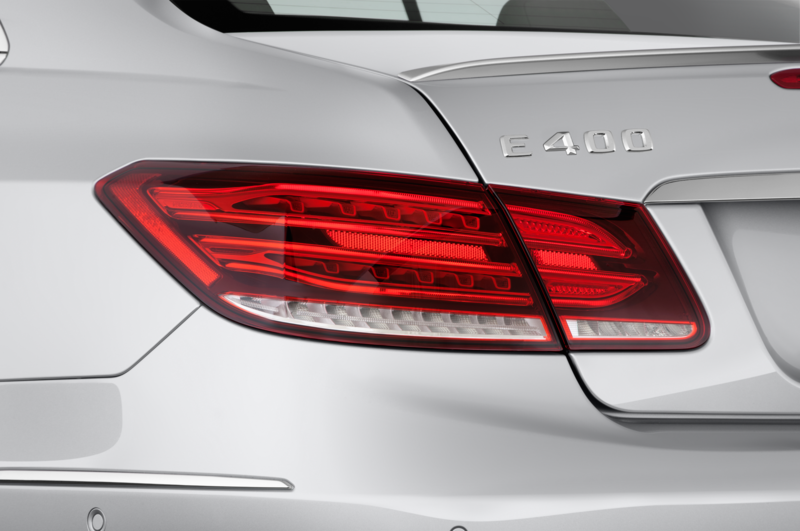 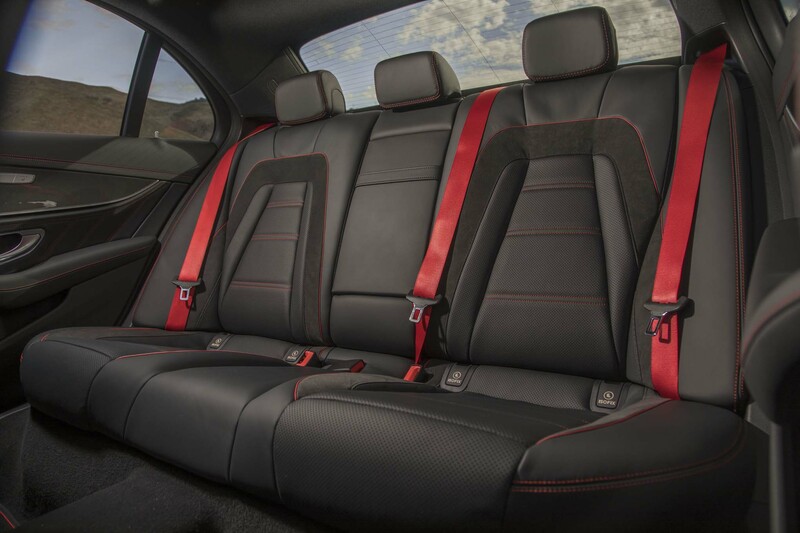 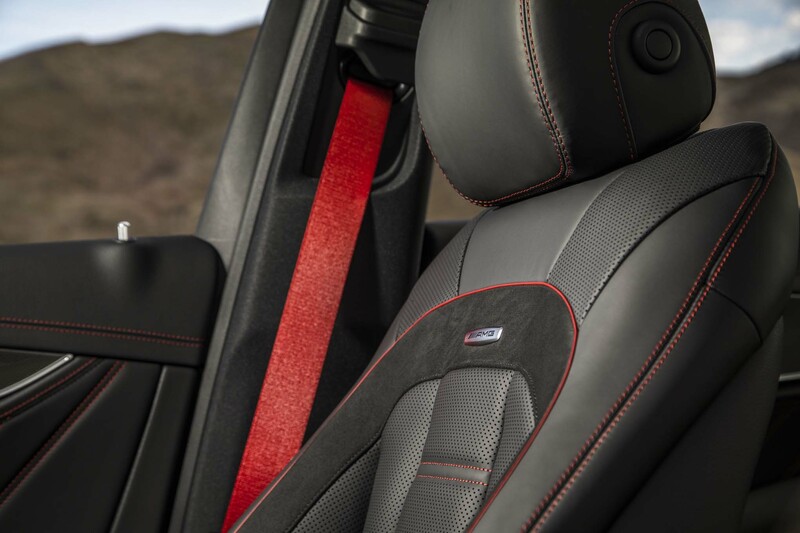 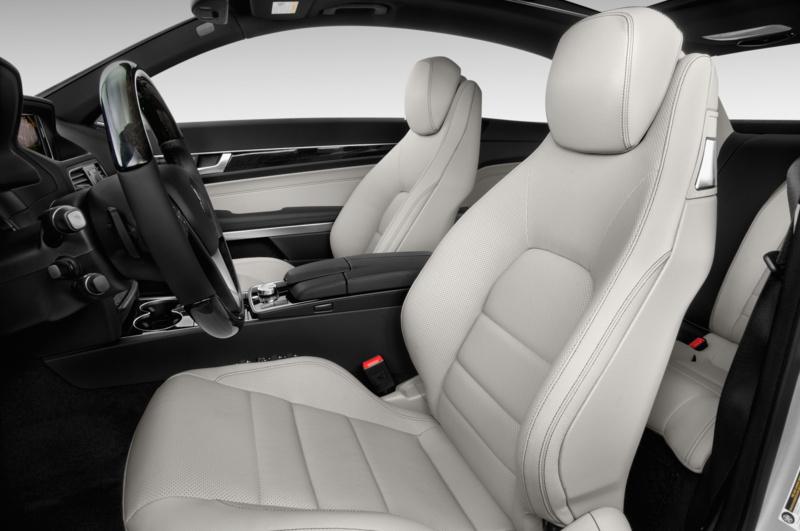 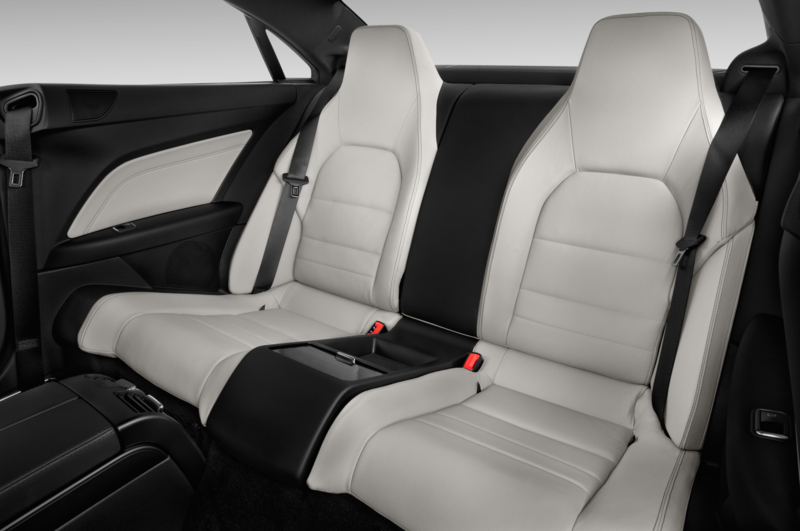 Audi has the A6 3.0T and BMW offers the 535i, but the E43 is a BMW 550i and Audi S6 competitor. 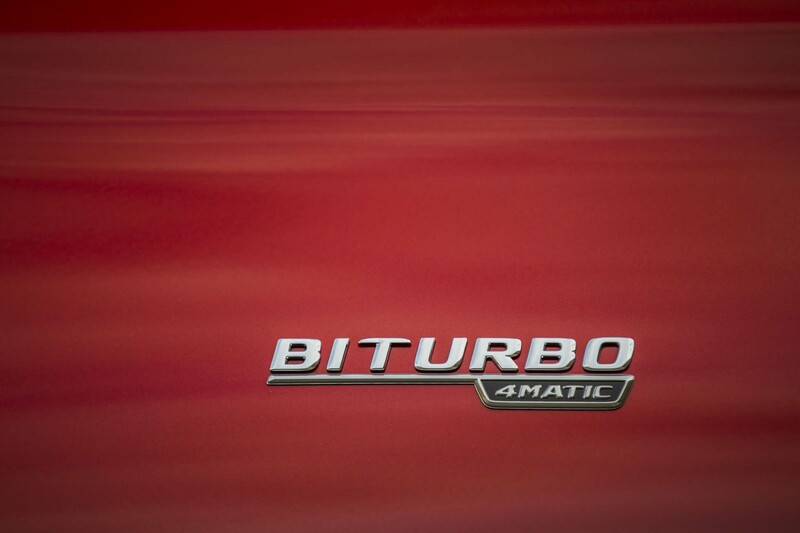 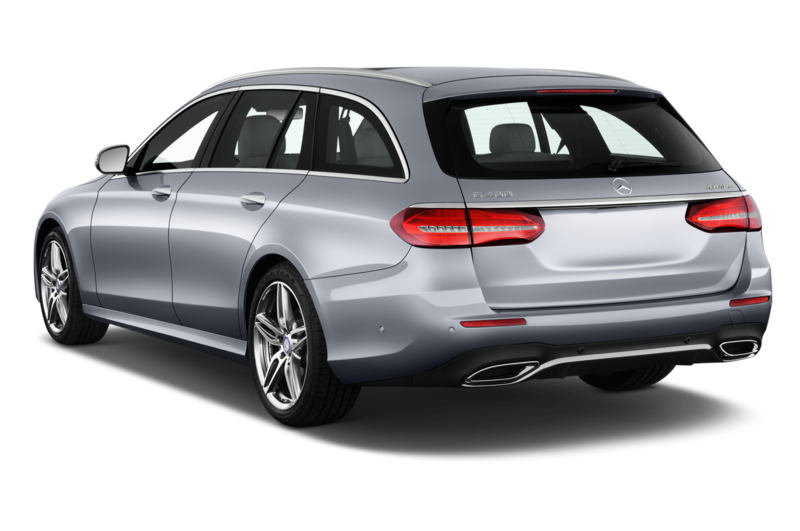 At least Mercedes will sell the 329-hp, turbocharged V-6 E400 4Matic wagon in the USA starting in early 2017. 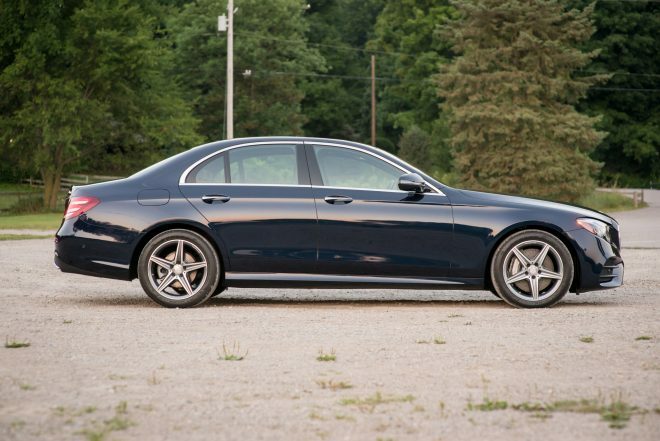 Chassis-wise, we’d need to directly compare the optional $1900 air suspension-equipped E300, like our test car, to a standard, steel-sprung car before making a final call on the recommended setup. 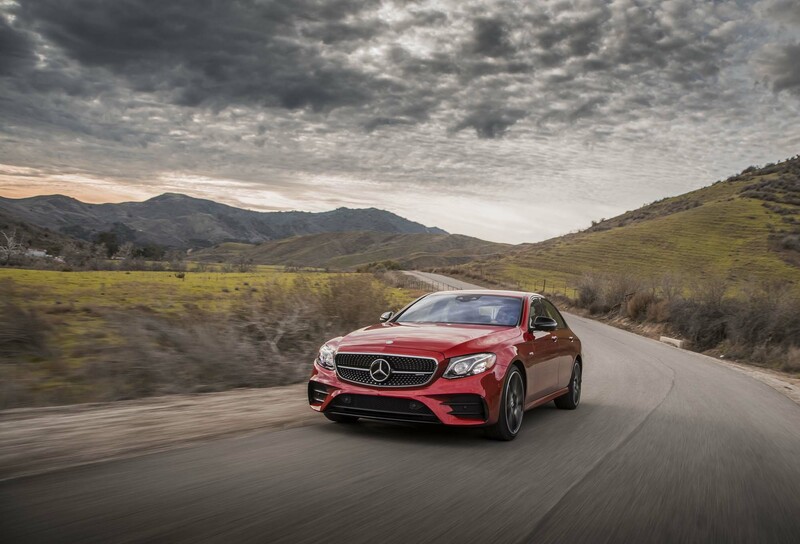 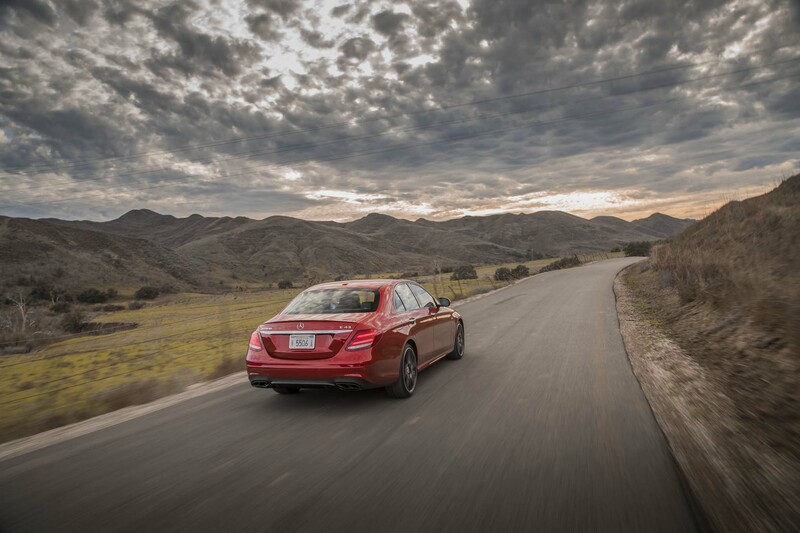 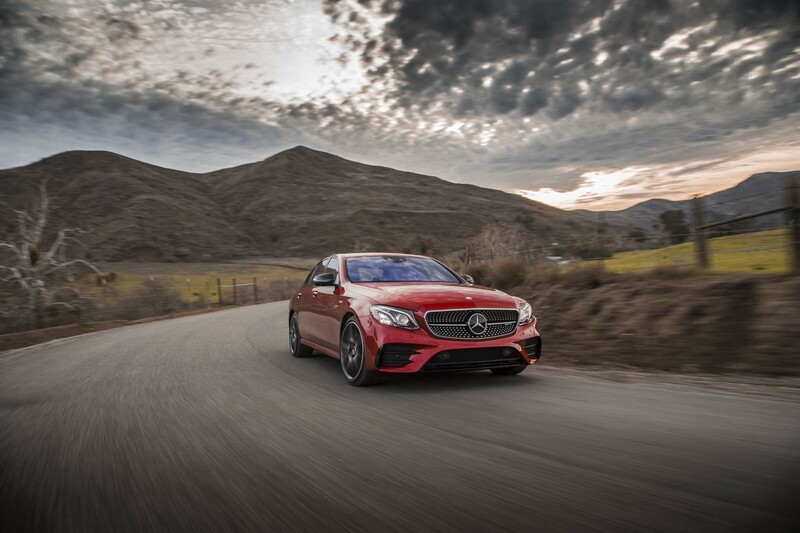 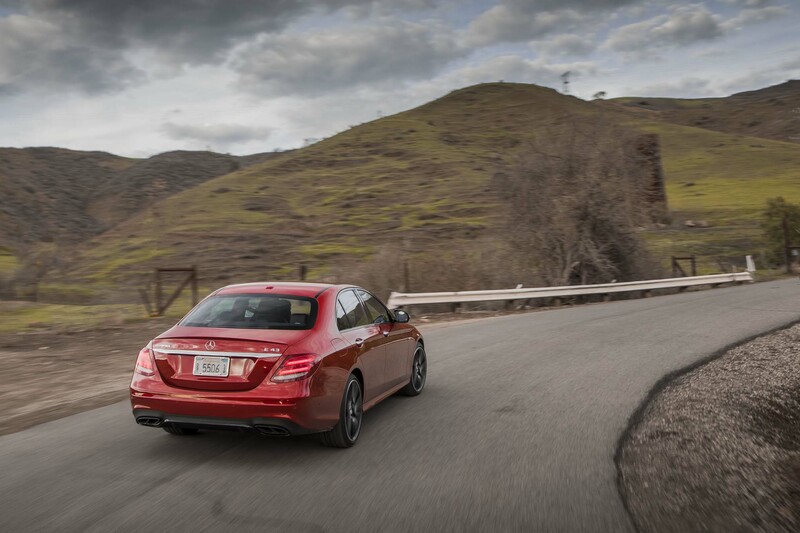 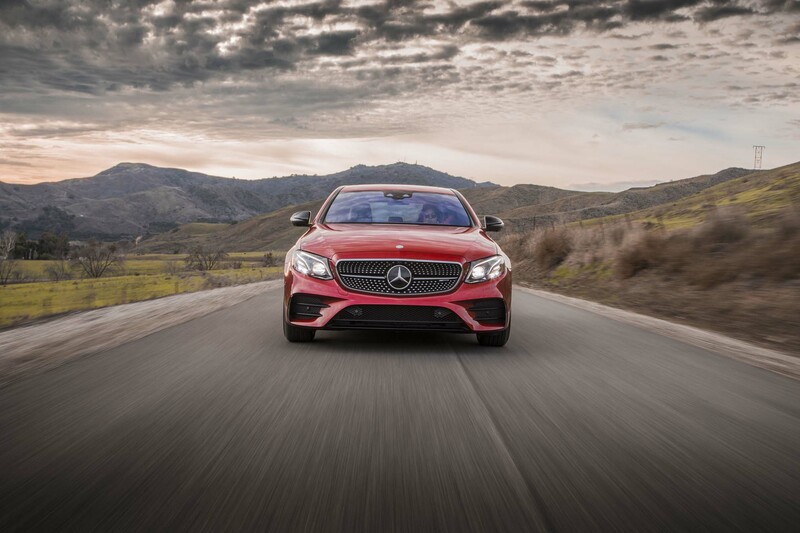 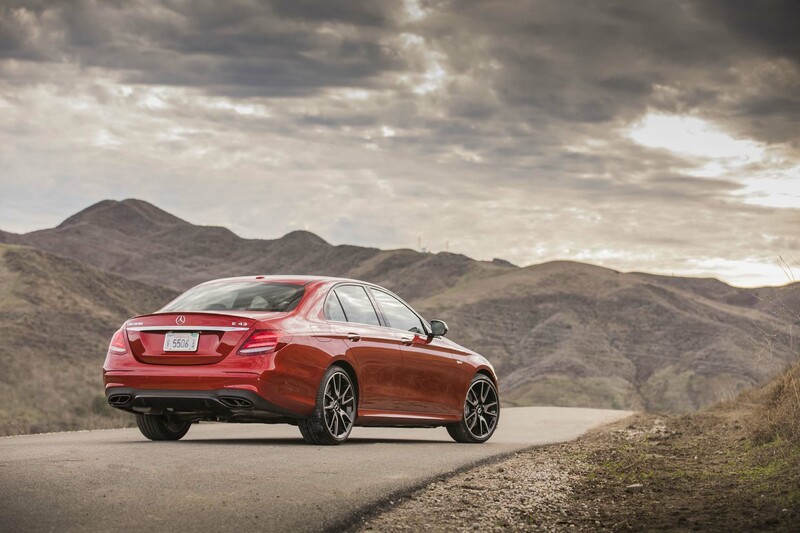 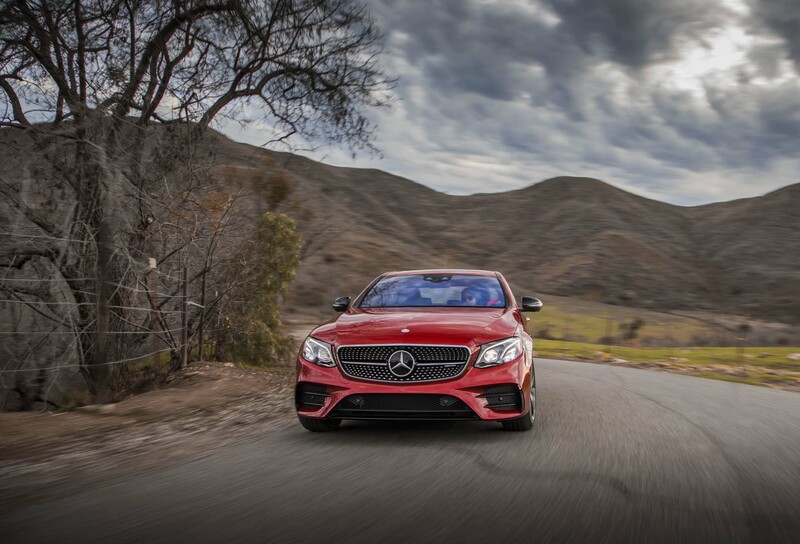 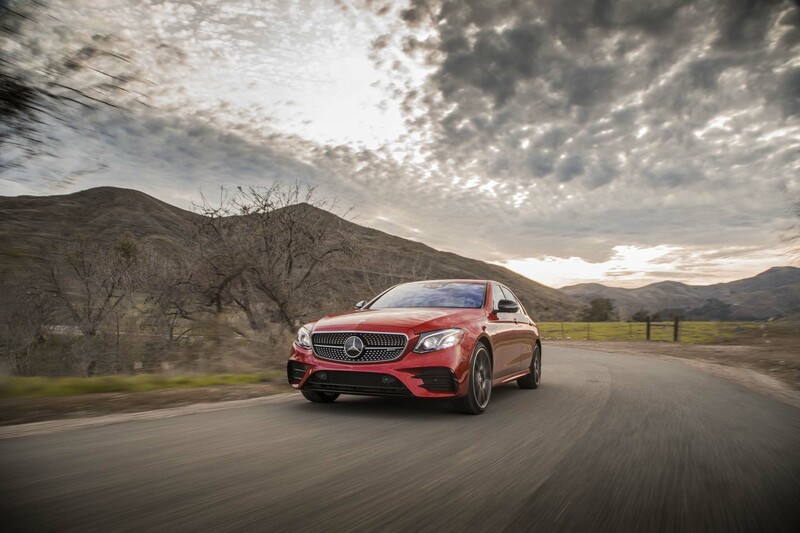 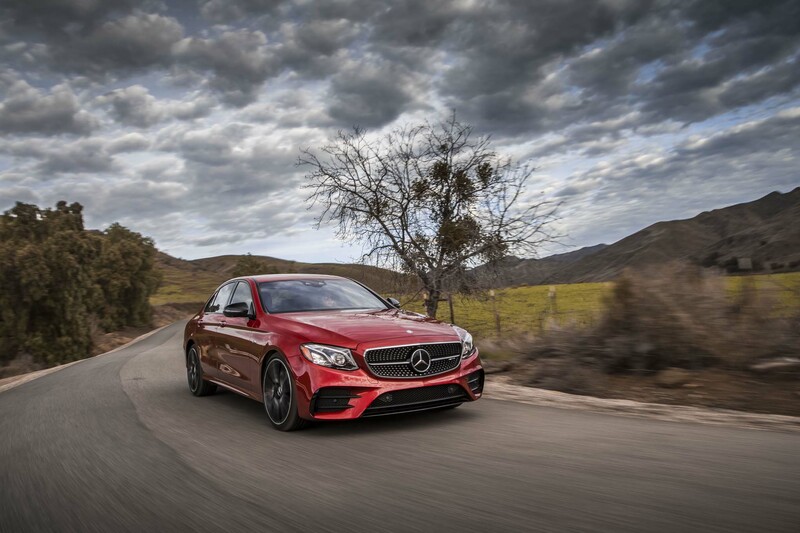 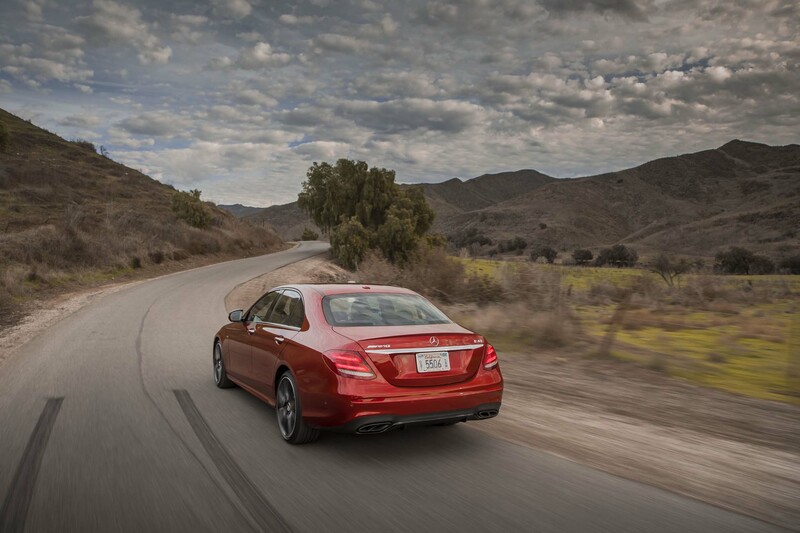 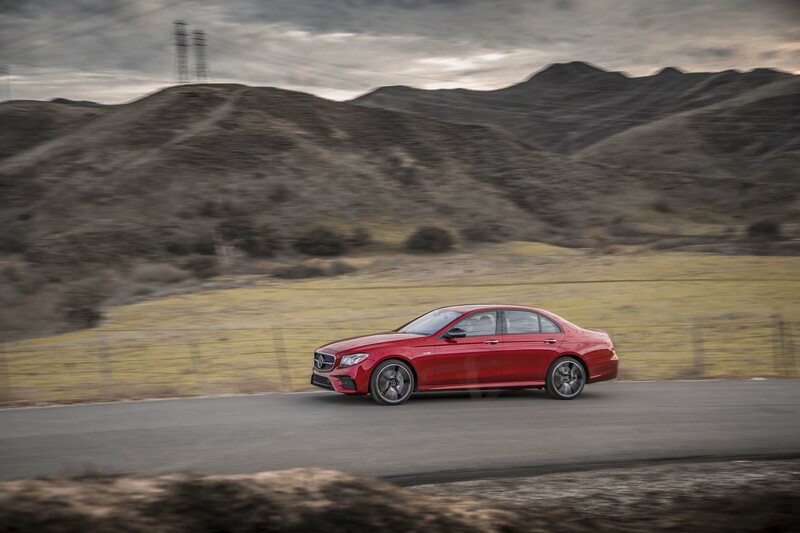 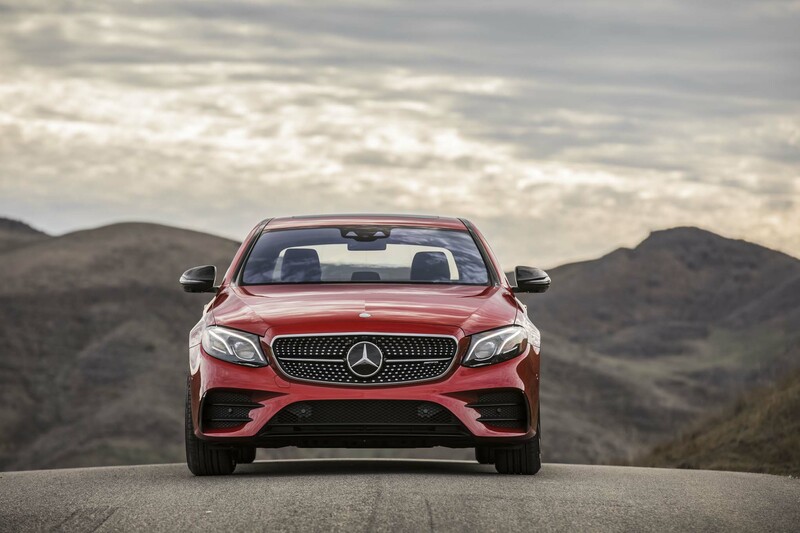 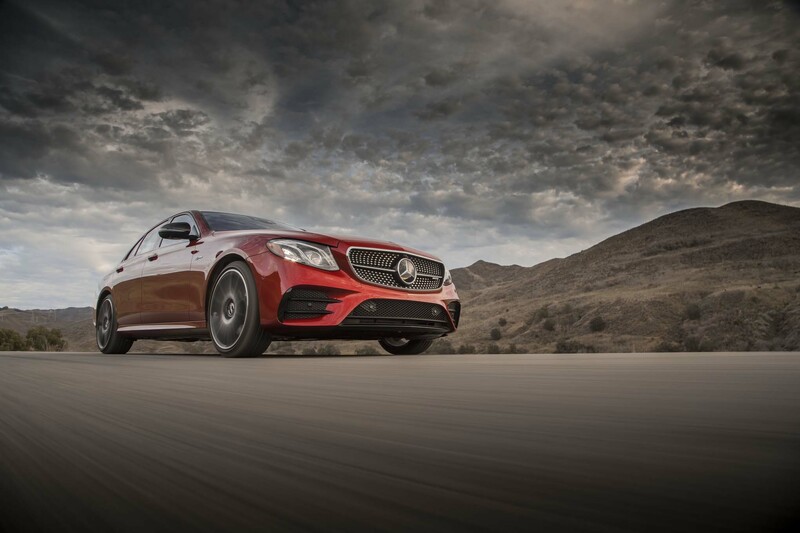 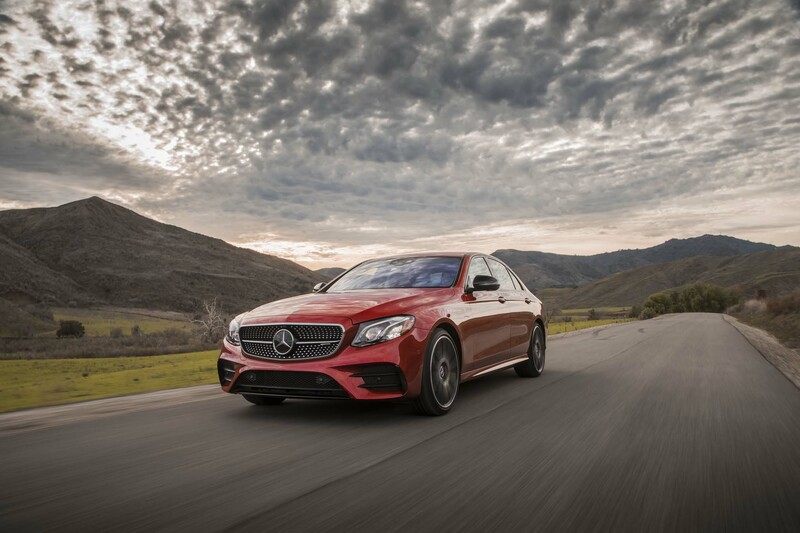 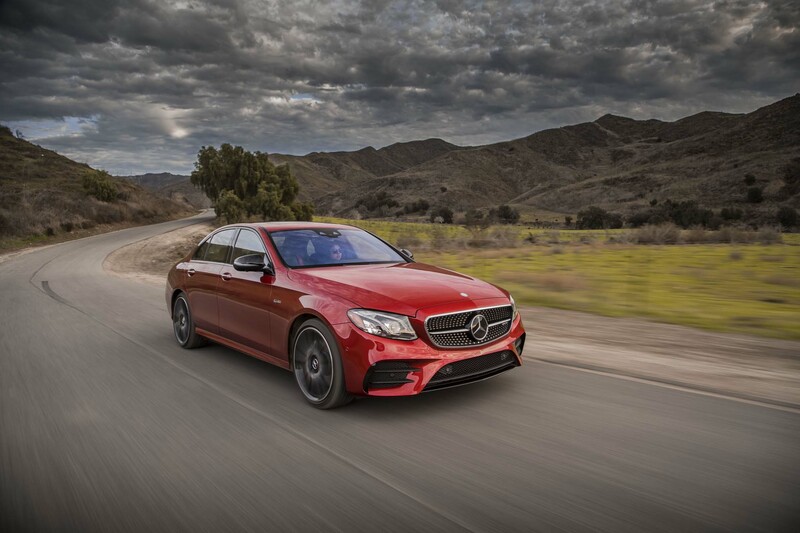 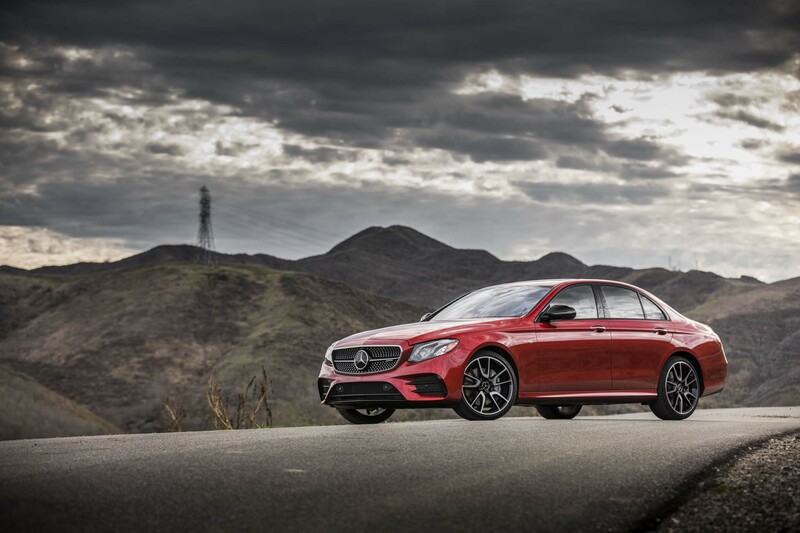 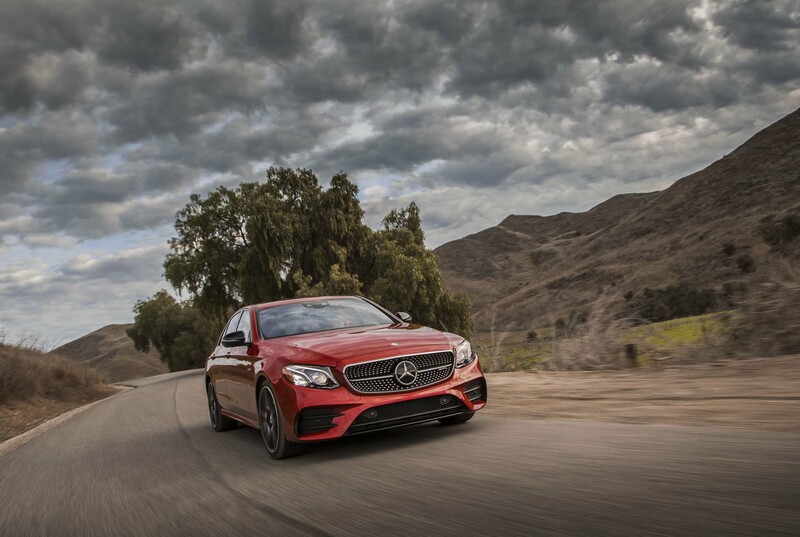 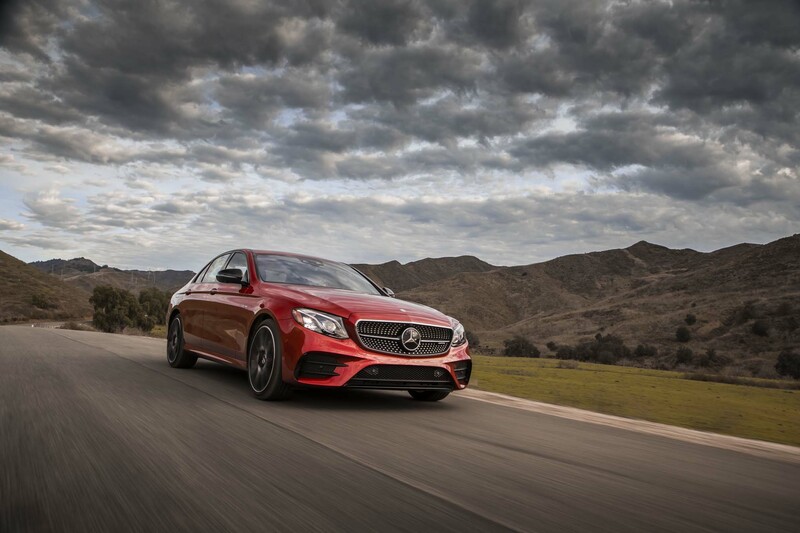 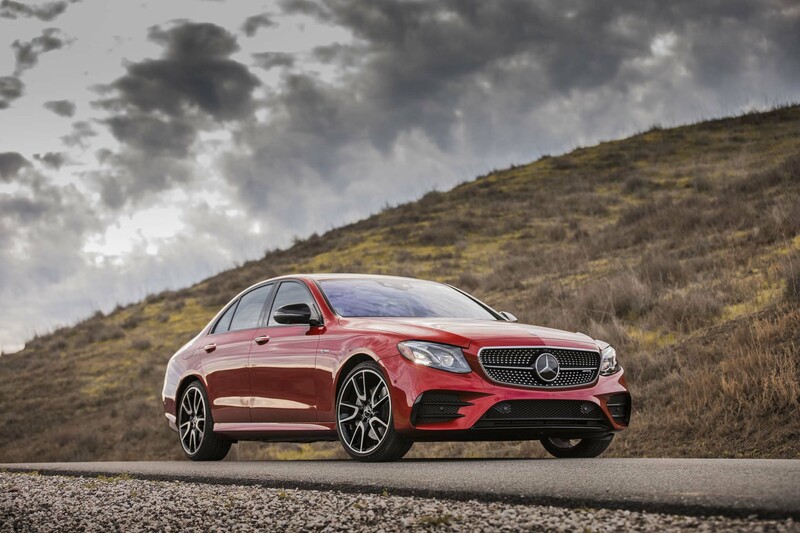 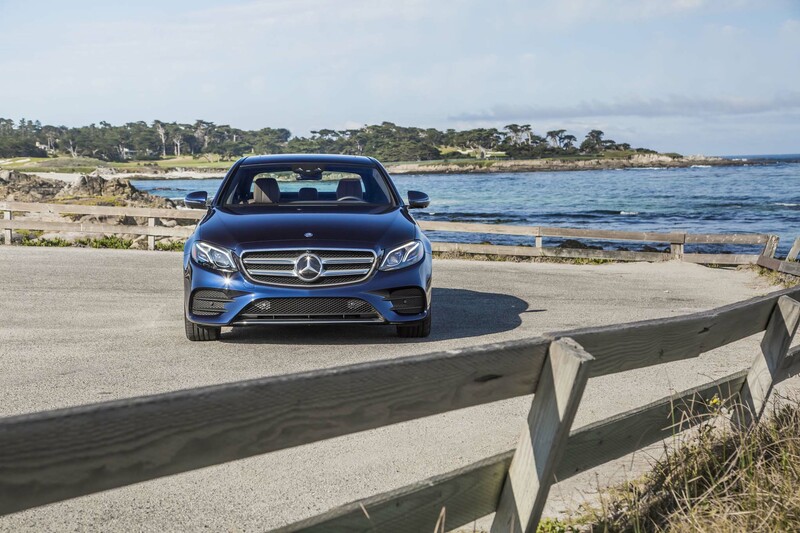 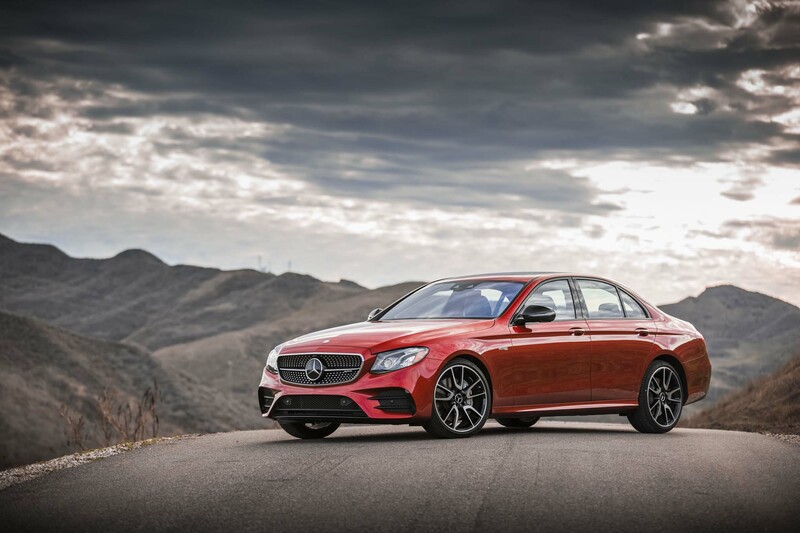 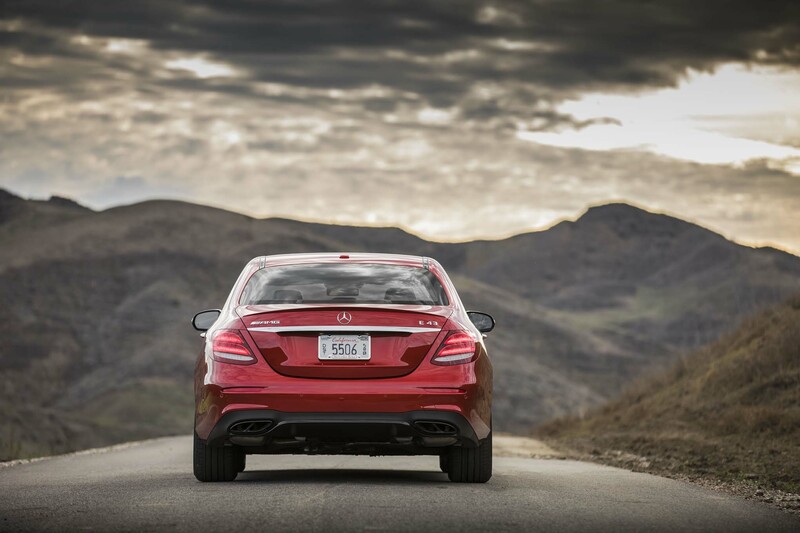 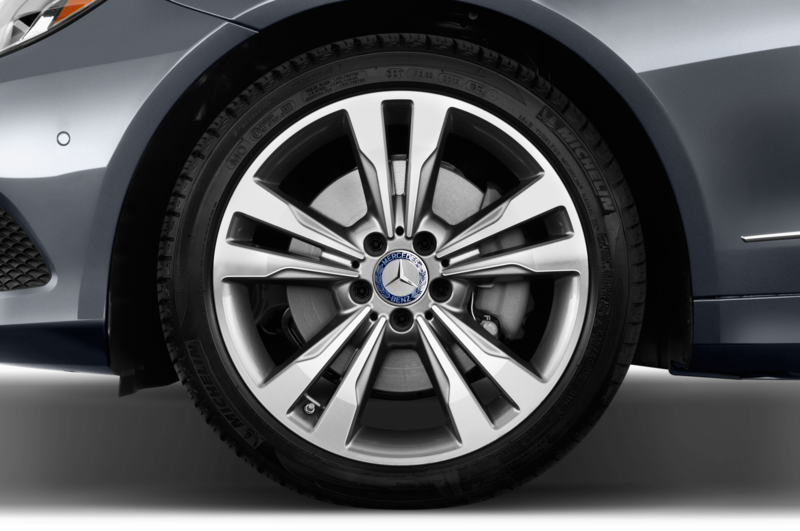 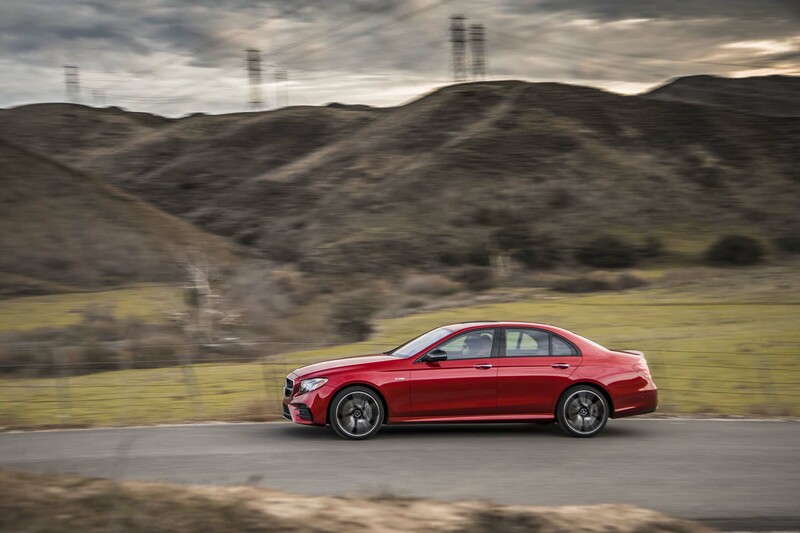 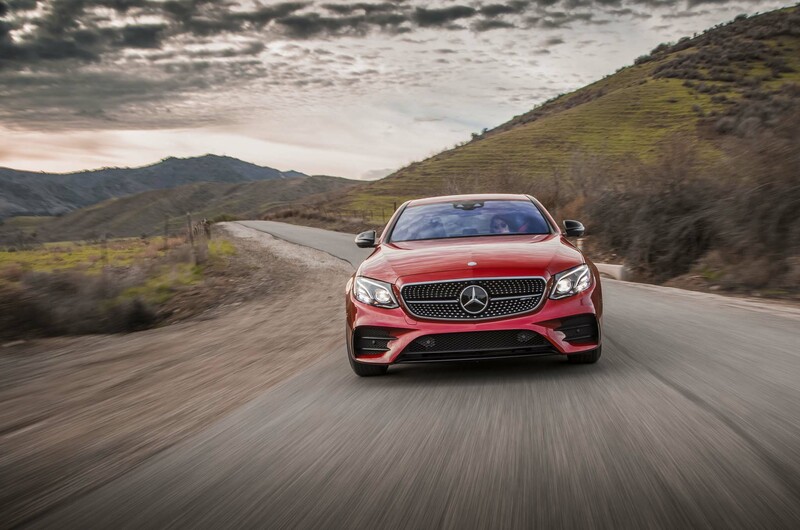 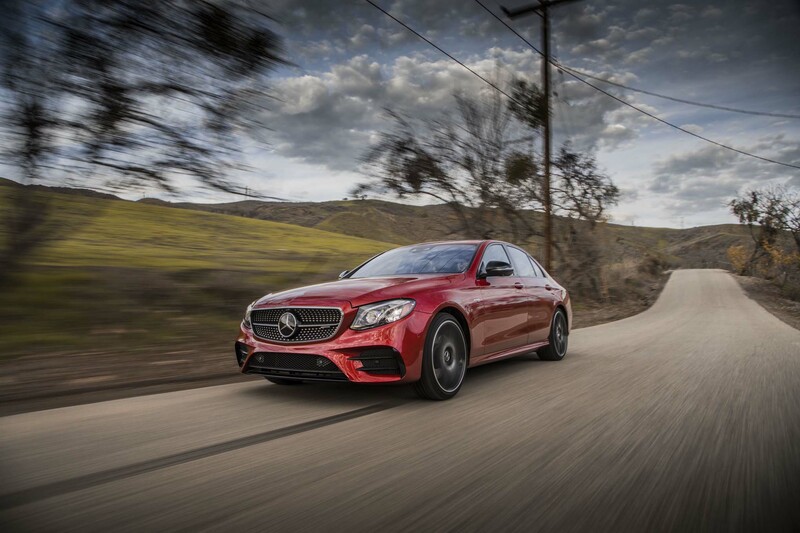 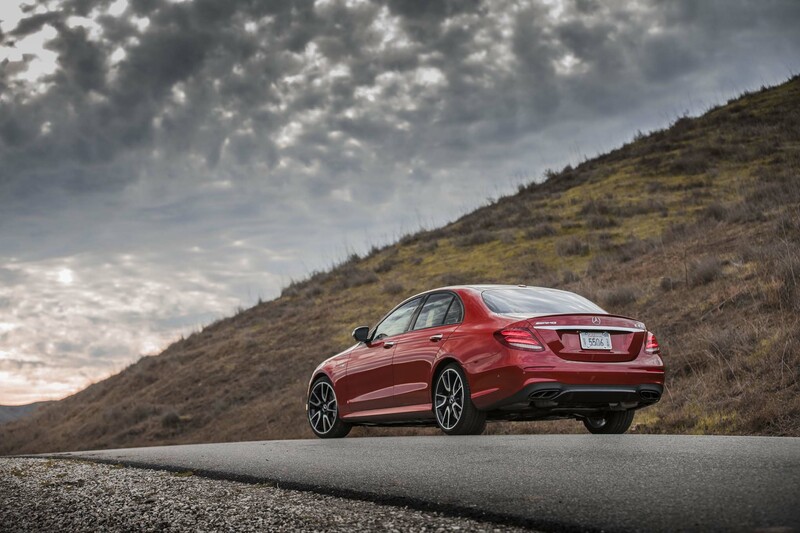 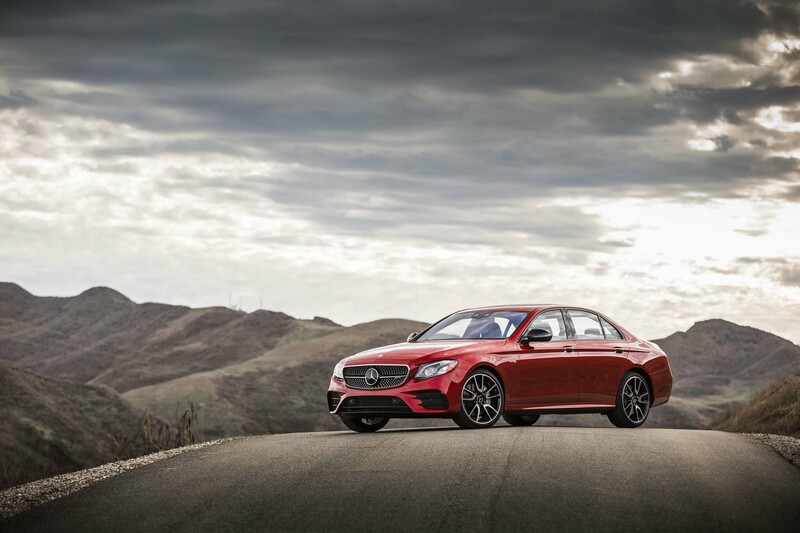 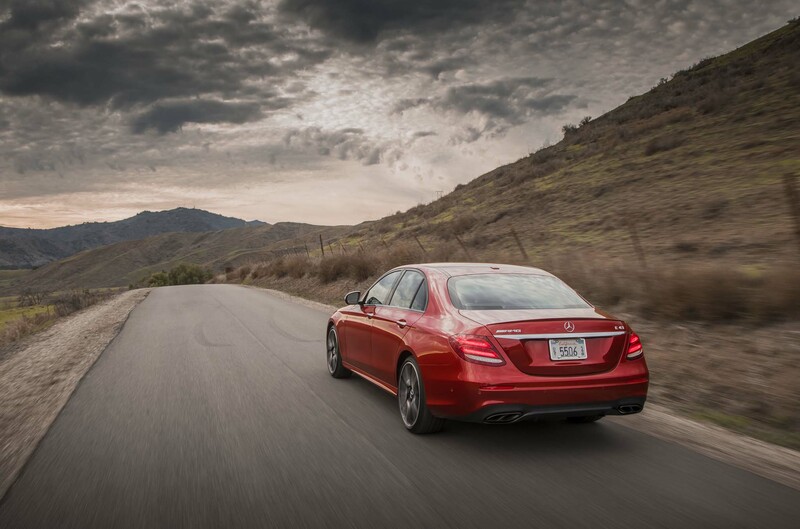 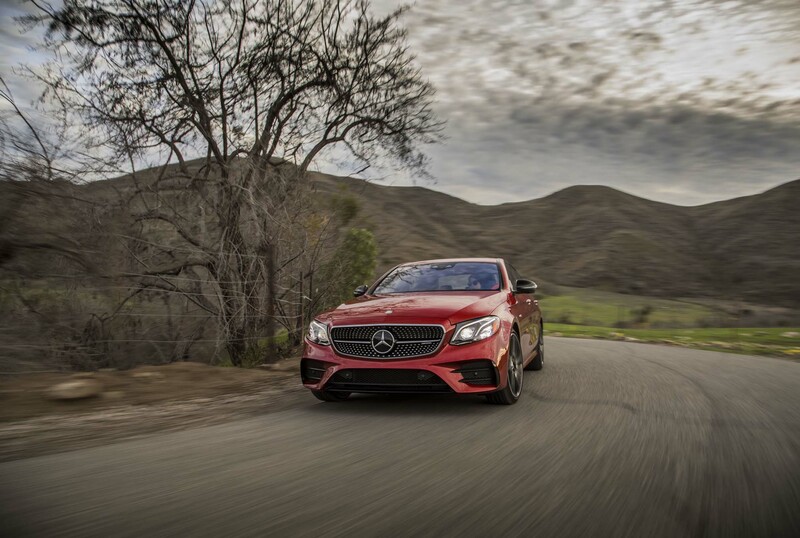 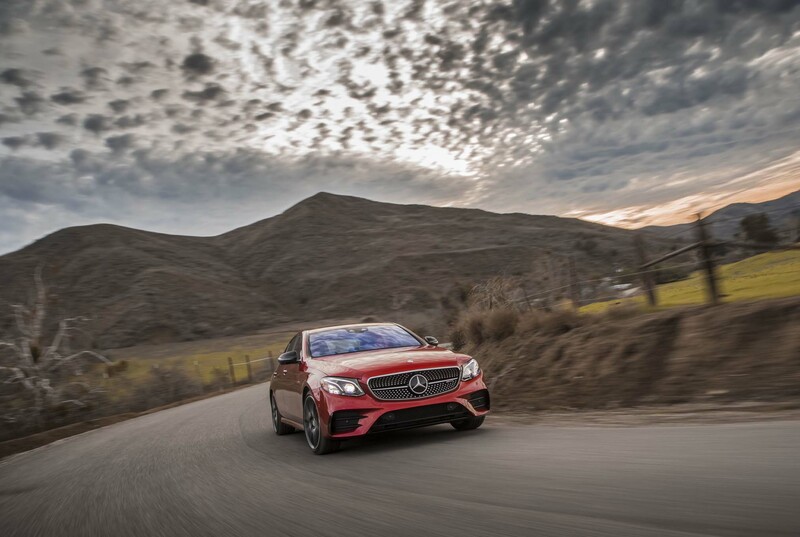 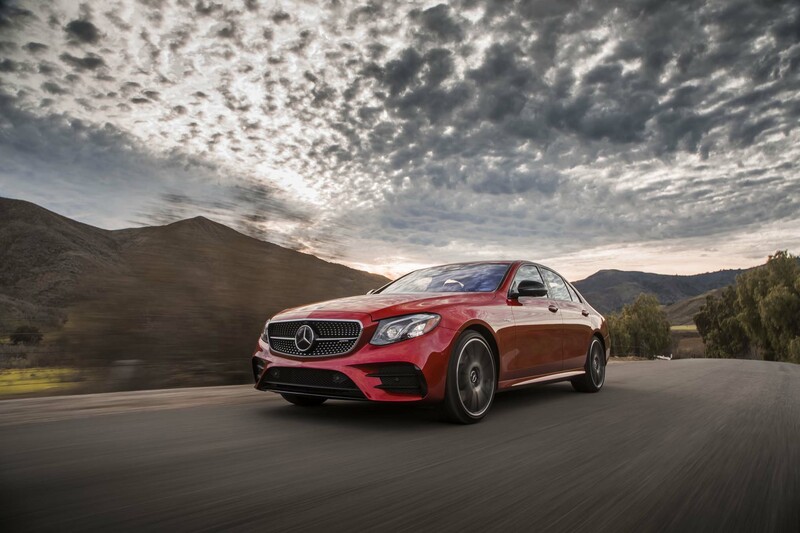 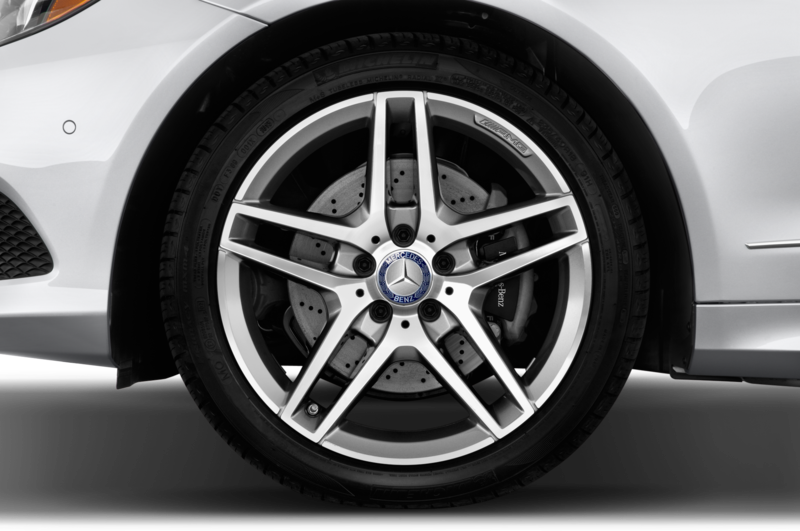 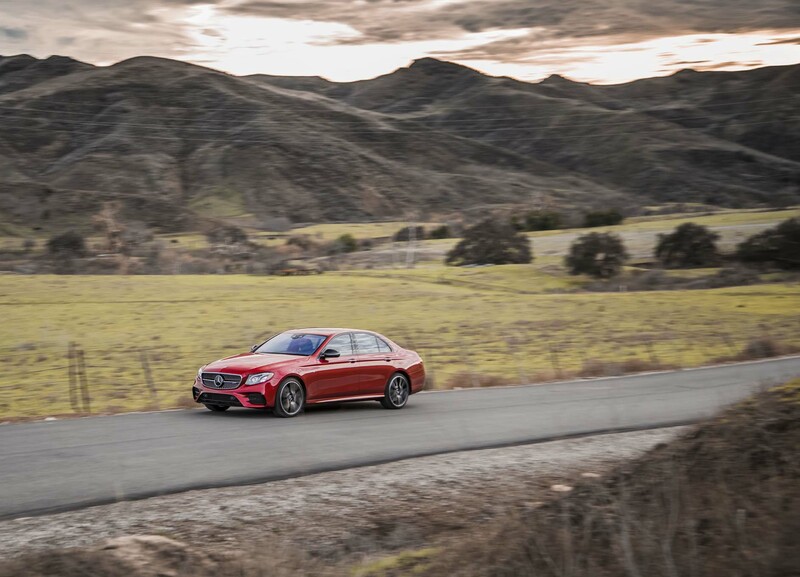 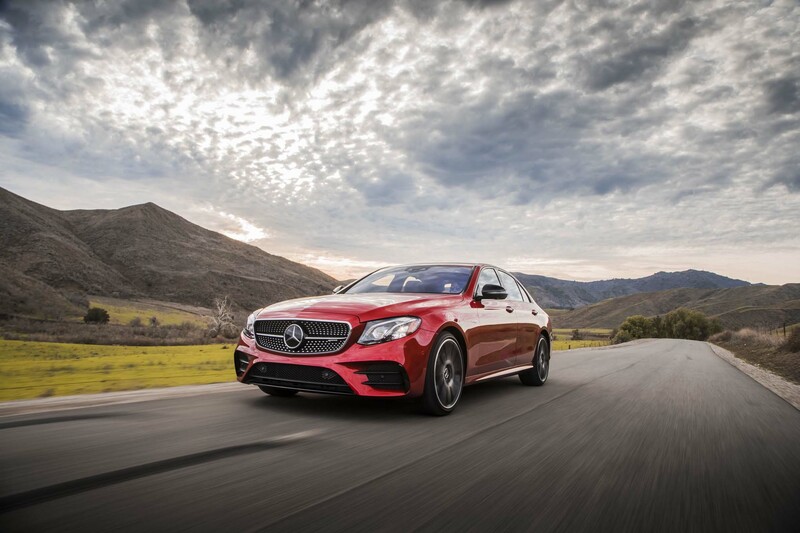 Our 18-inch-wheel-equipped E-Class offered impressive isolation and body control over rough roads, especially at lower speeds. 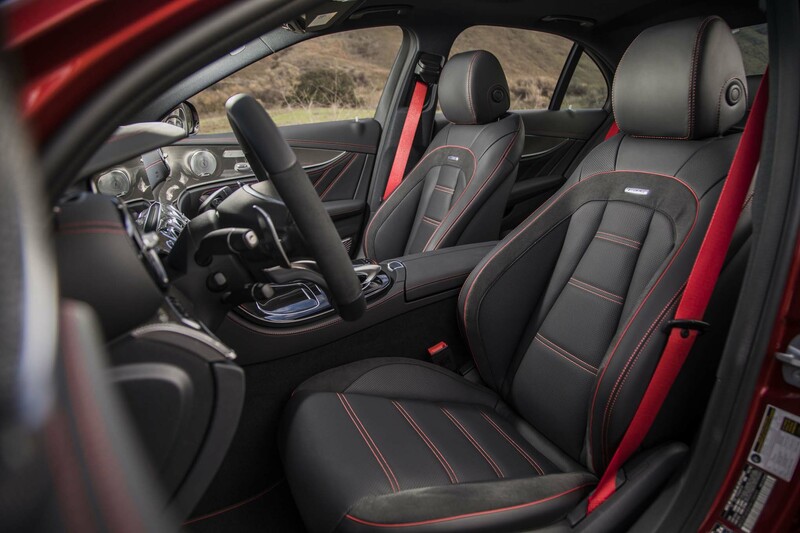 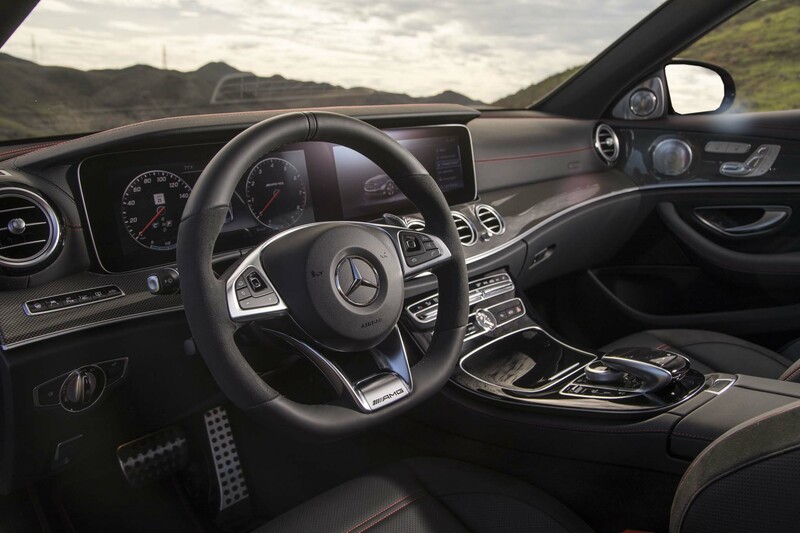 Higher speeds bring along a bit too much of a floaty, pillow-like feel. 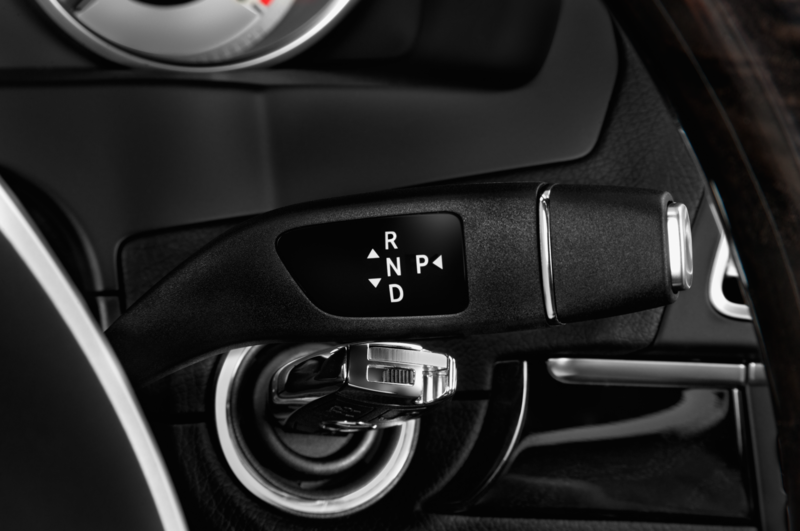 Stiffening up the suspension to one of the two sportier settings via the various drive modes helps, but we’d prefer a dedicated suspension button for quick adjustments. Overall, chassis grip is impressive and the E-Class will dance quite impressively when pushed on the back roads. 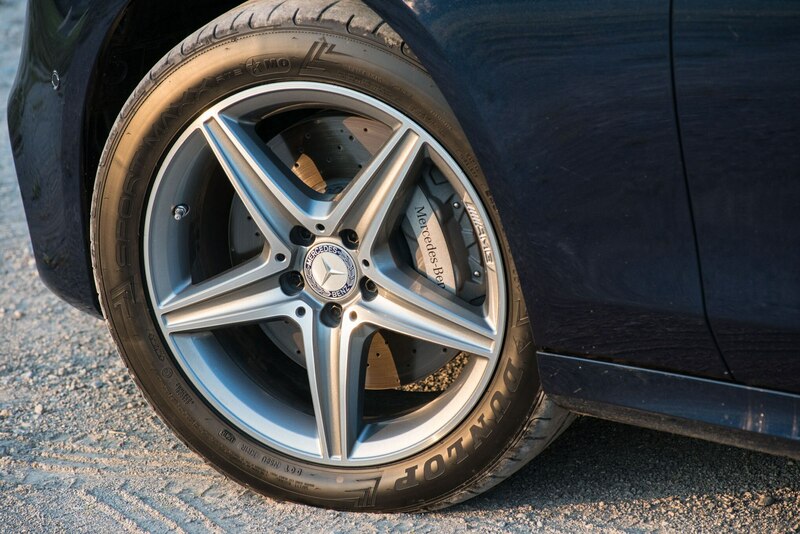 but as we noted in the intro story, our test car carried Euro-spec performance tires. 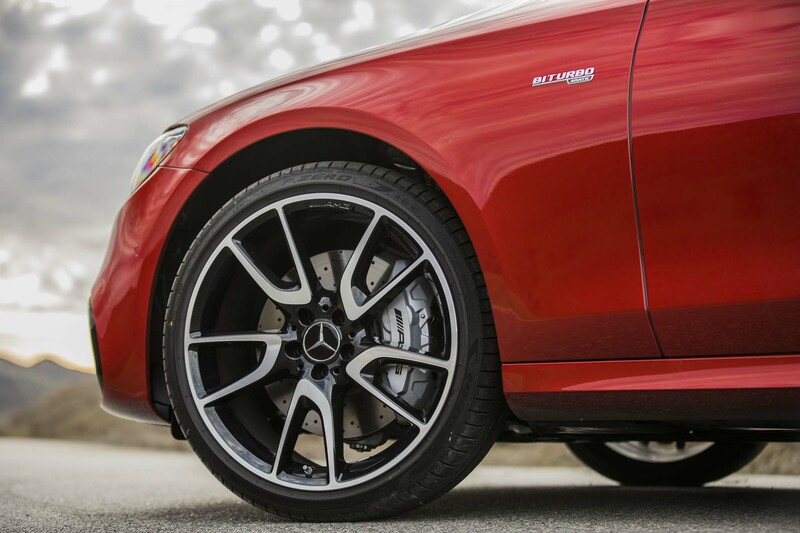 We’ll see how the standard run-flat, all-season tires fitted to all U.S. E300 models alter the chassis feel and performance. 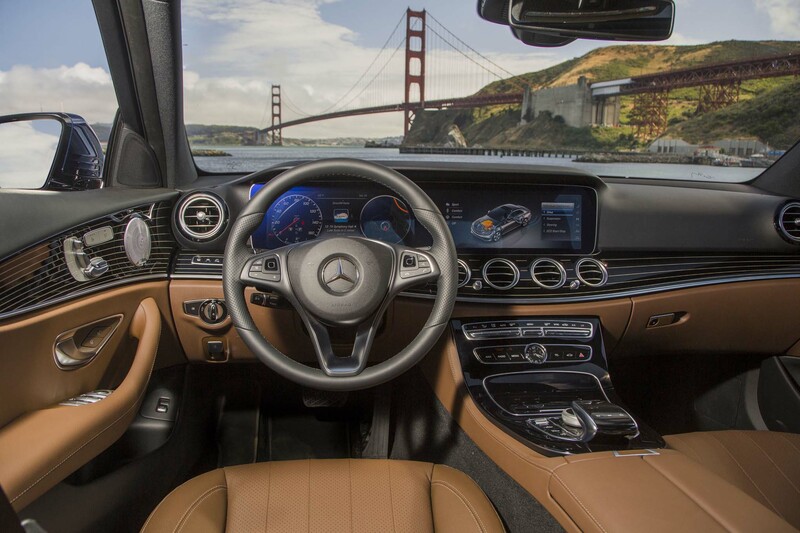 Then we come to the advanced technology in the new E-Class—most importantly the optional semi-autonomous Driver Assistance Package Plus. 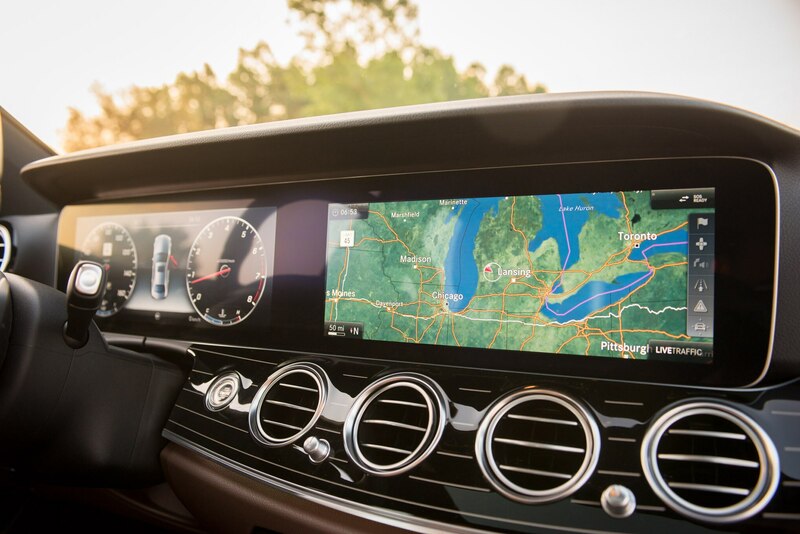 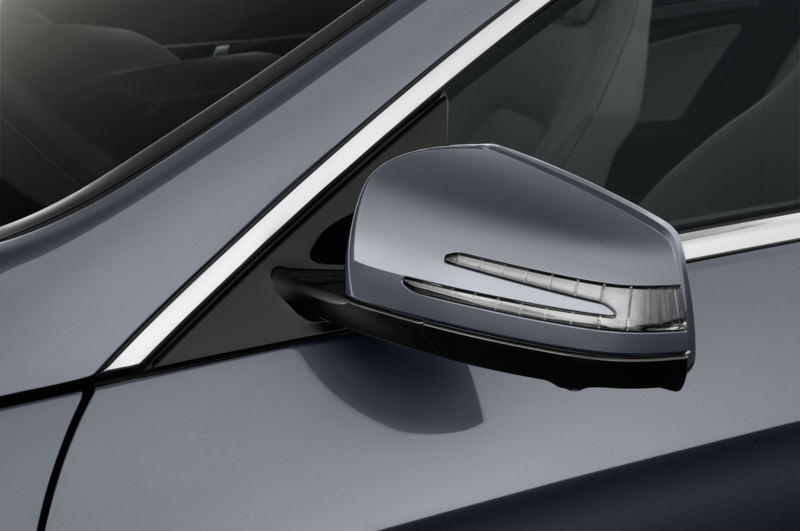 Bundled into the $10,400 Premium 3 package, this radar cruise control on steroids allows extended no-hands driving by adding the ability to follow the path of the car in front instead of just relying on road markings to automatically steer the car. 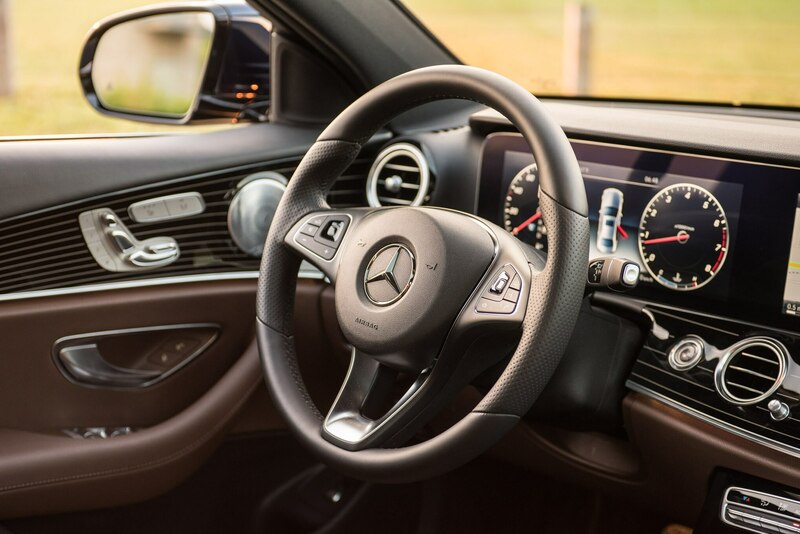 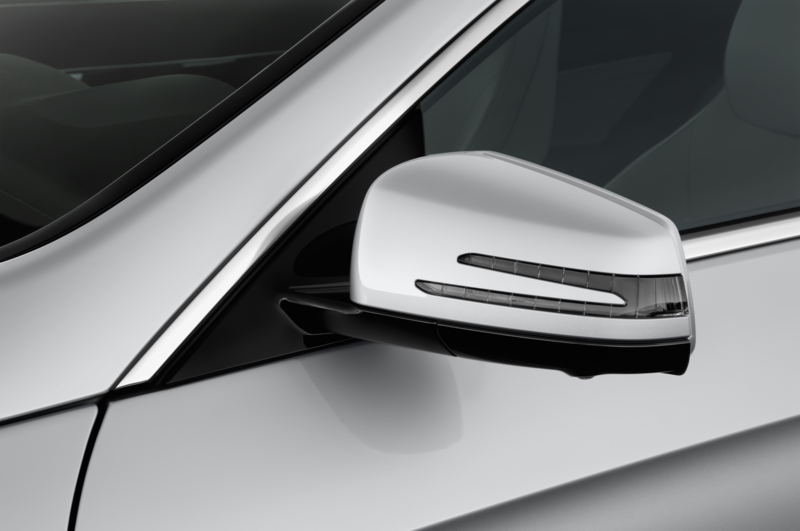 Additionally, the E300 is able to change lanes without manual steering input when the driver activates a turn signal and the blind spot assist system confirms there isn’t a vehicle in the adjacent lane. 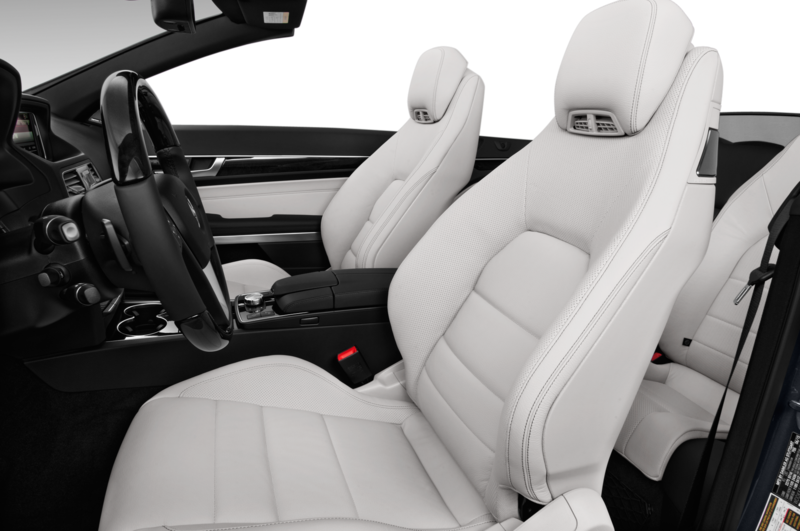 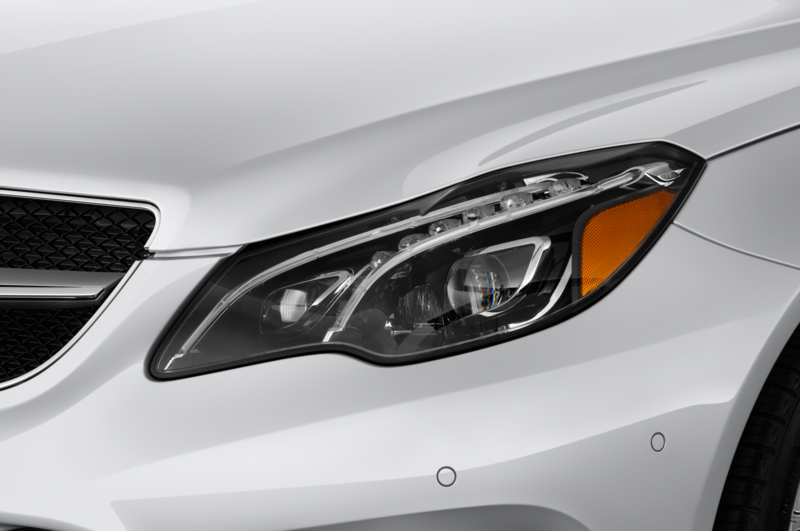 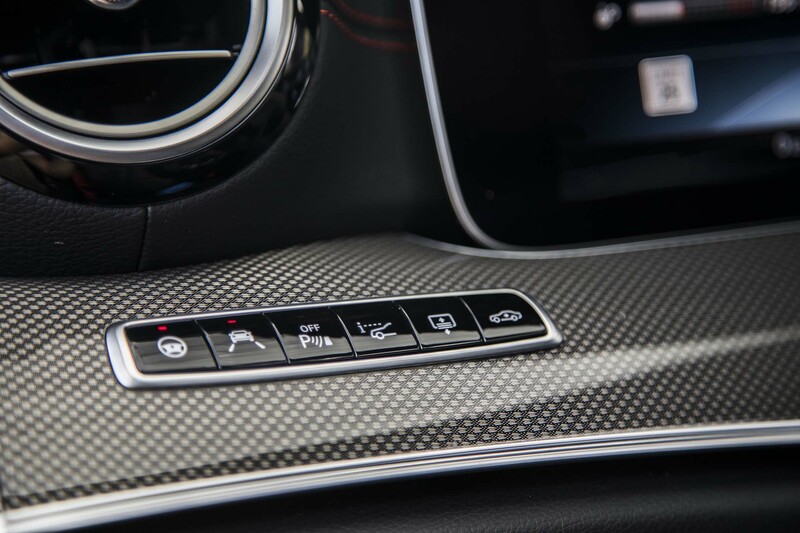 The overall system works quite well but it’s important to view it more as a group of features designed to help the driver from a safety and fatigue aspect versus proper autonomy. Like the systems presently offered by other car companies, you still very much need to pay attention and be aware of your surroundings. 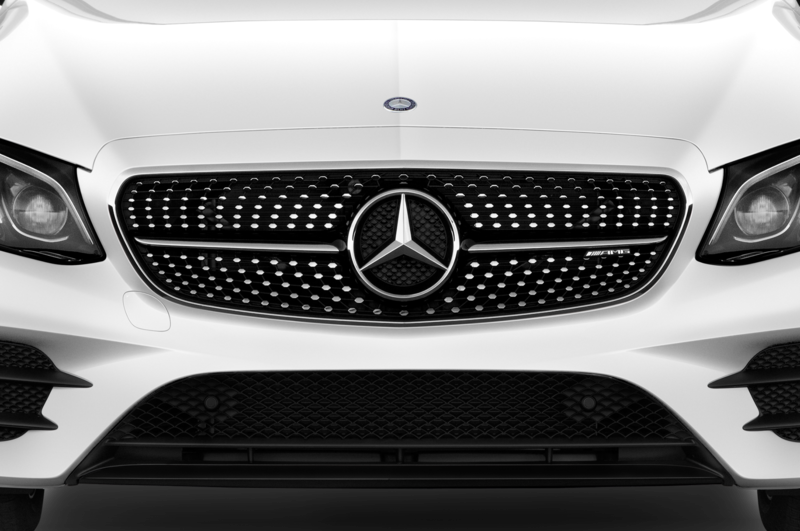 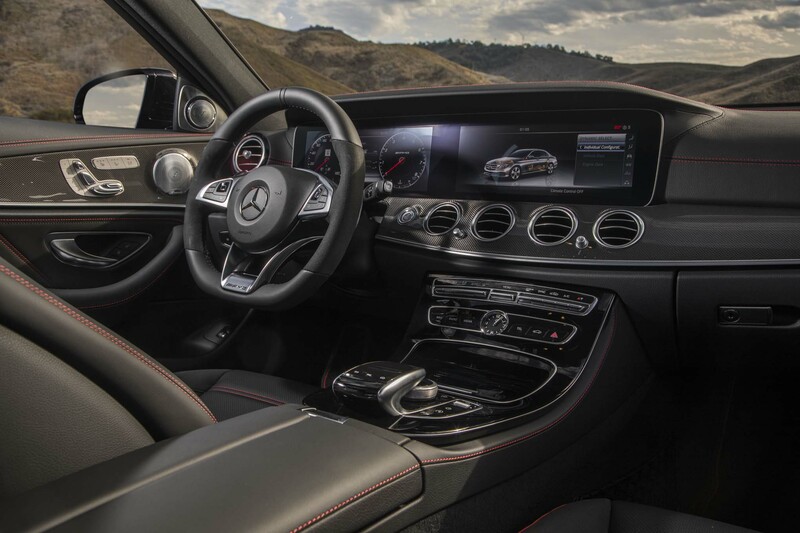 The new Mercedes setup is another small step towards full autonomy, but we have a long way to go. 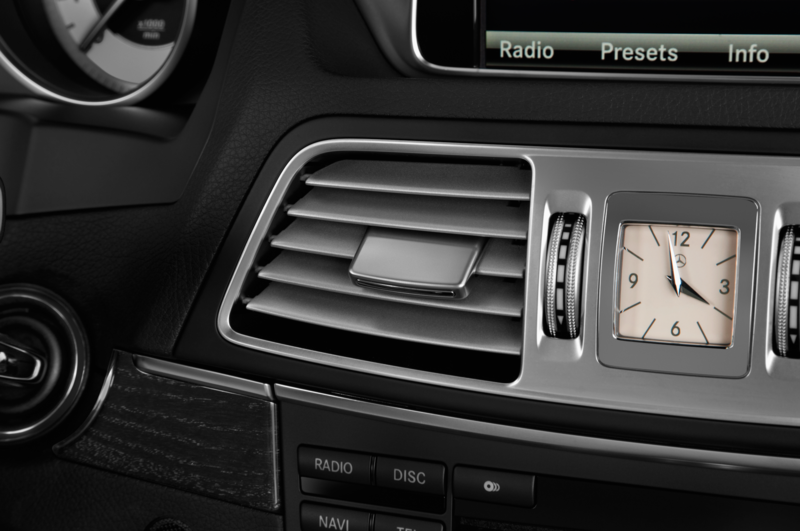 Fiddling around with this technology is done within a lovely and cosseting cabin. 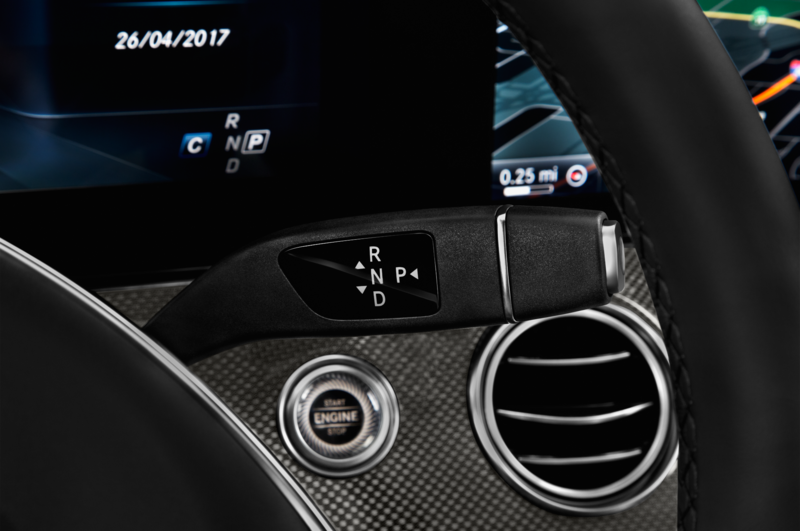 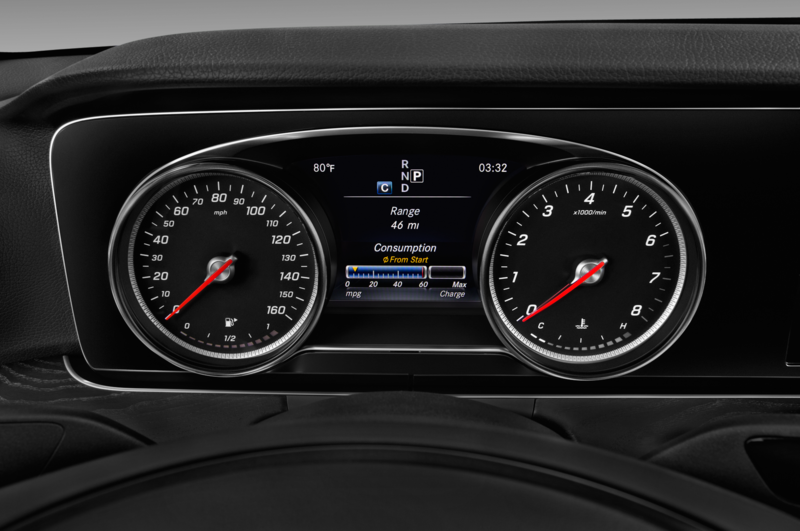 Our minor complaints about Mercedes burying too many functions into the infotainment screen versus fitting dedicated buttons didn’t change by month’s end. 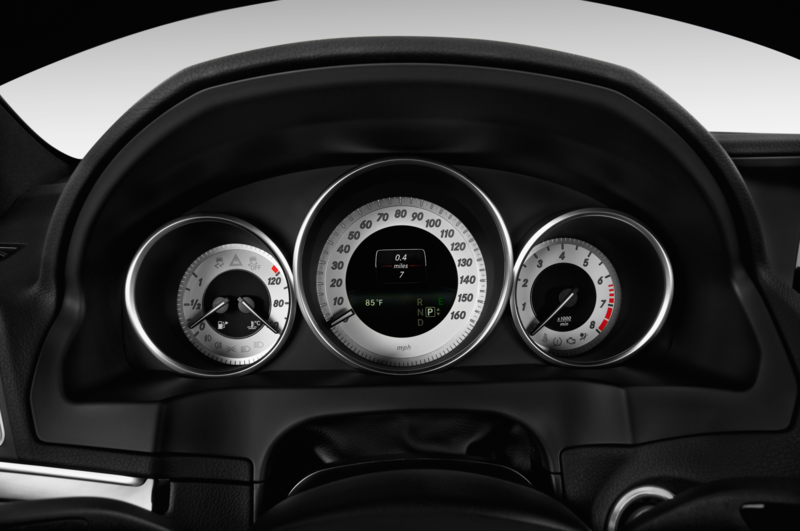 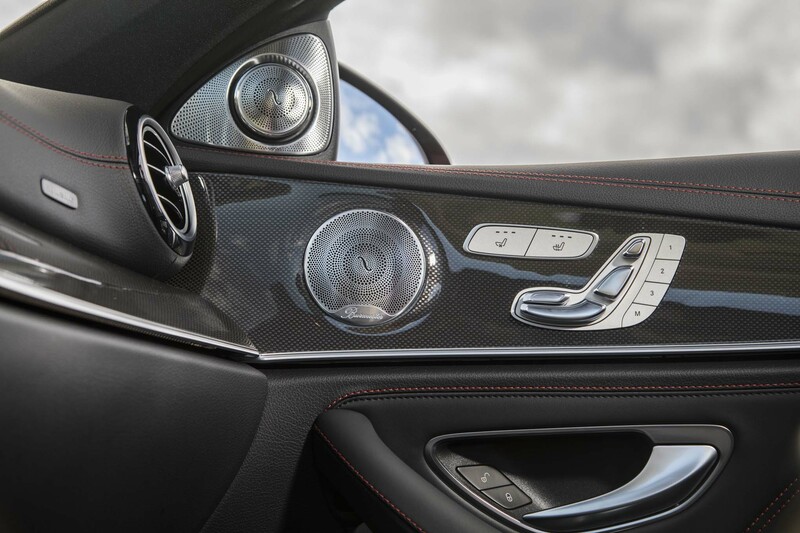 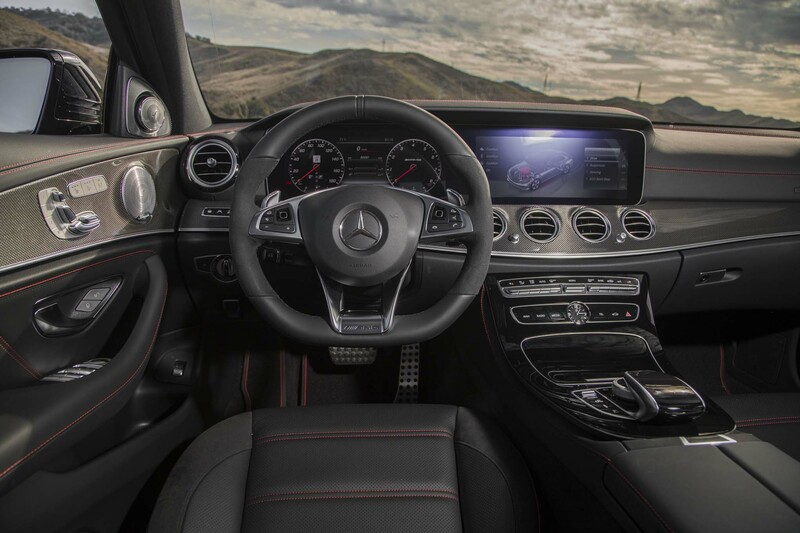 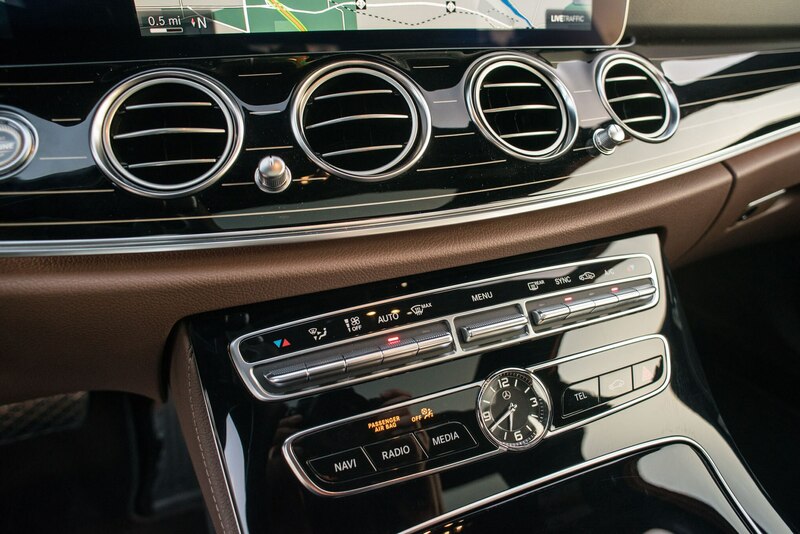 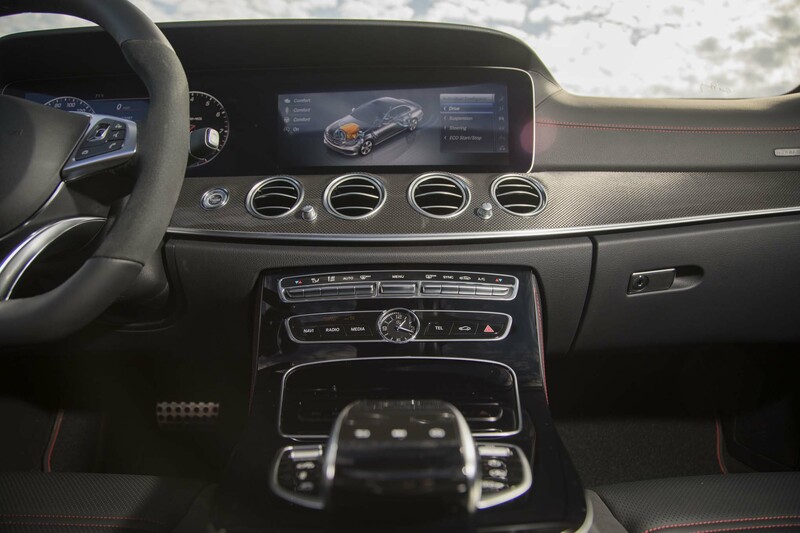 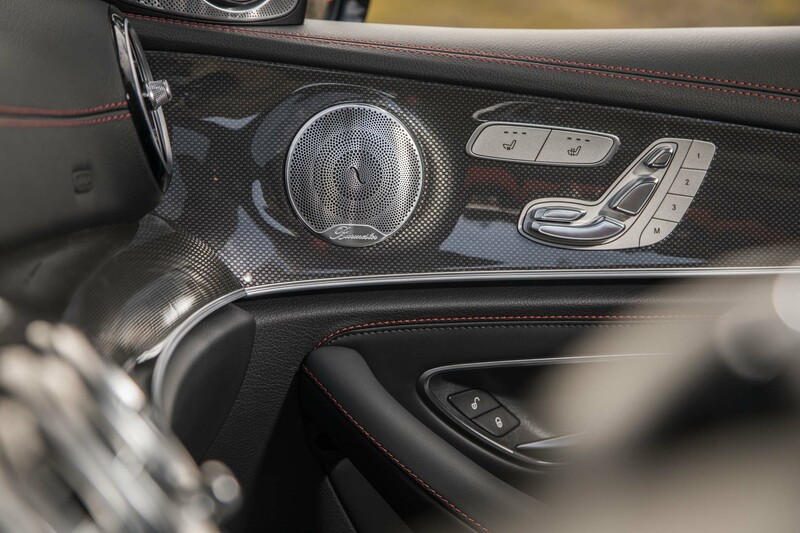 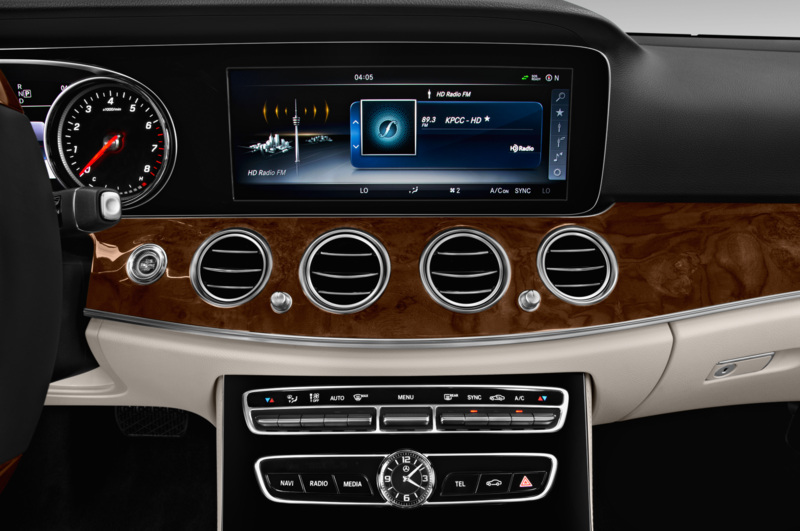 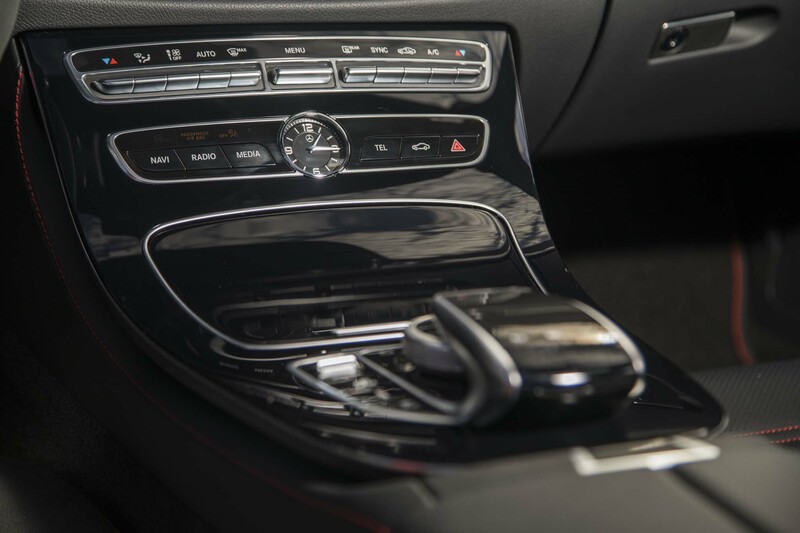 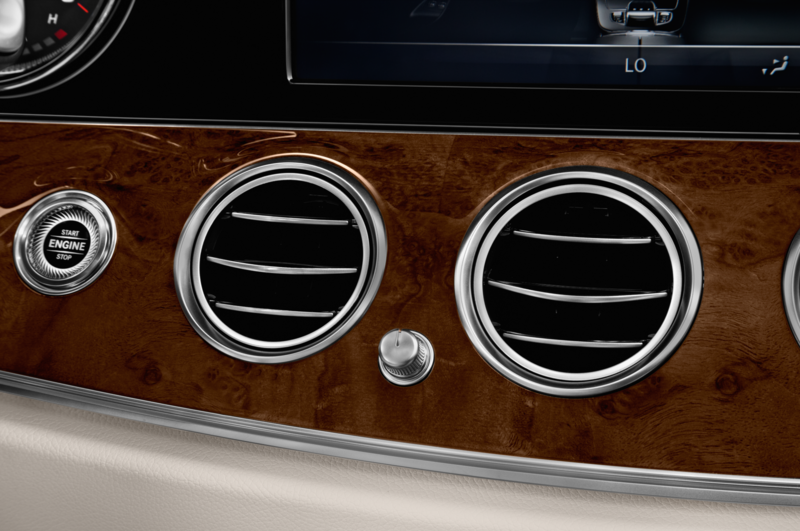 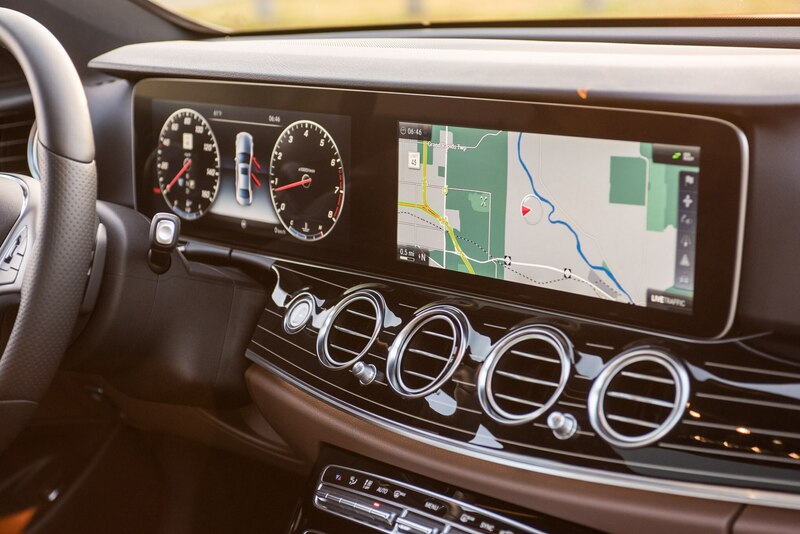 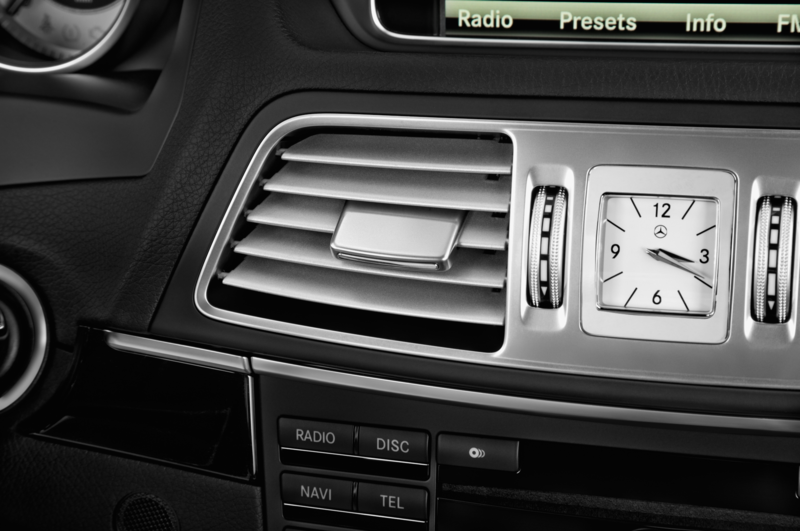 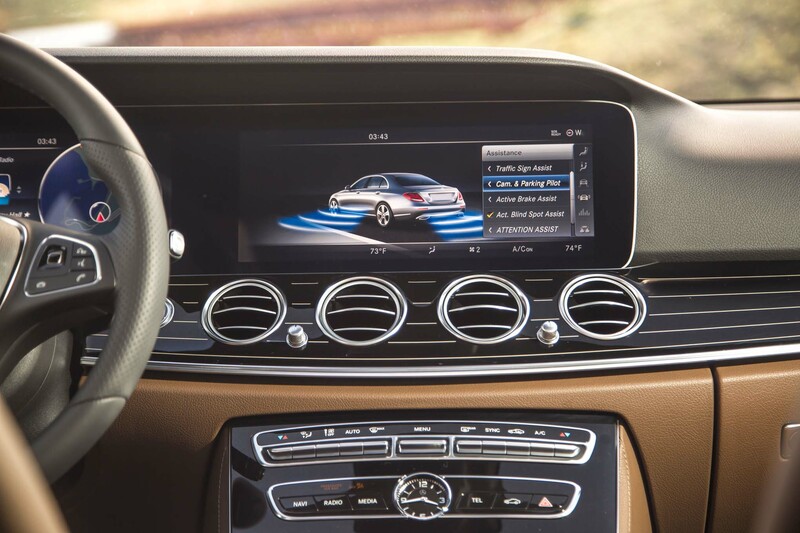 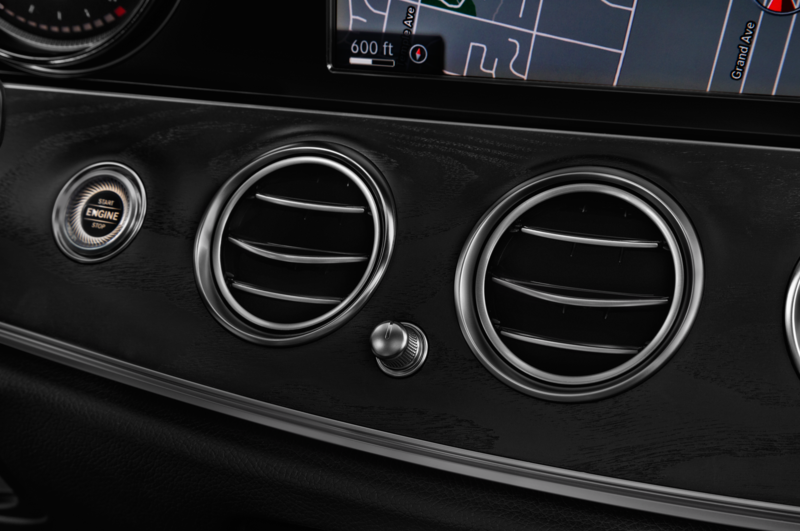 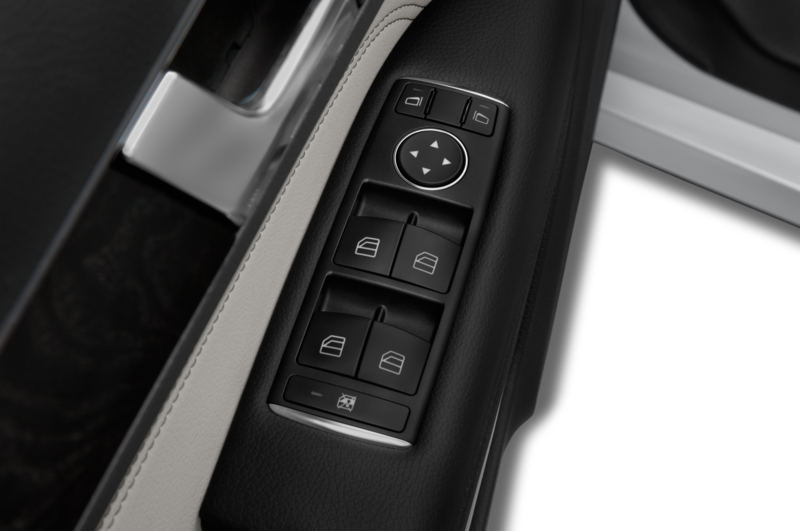 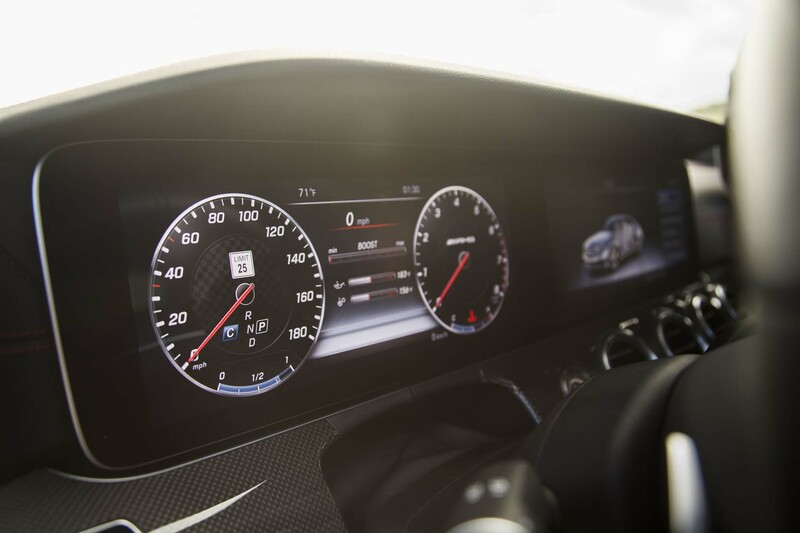 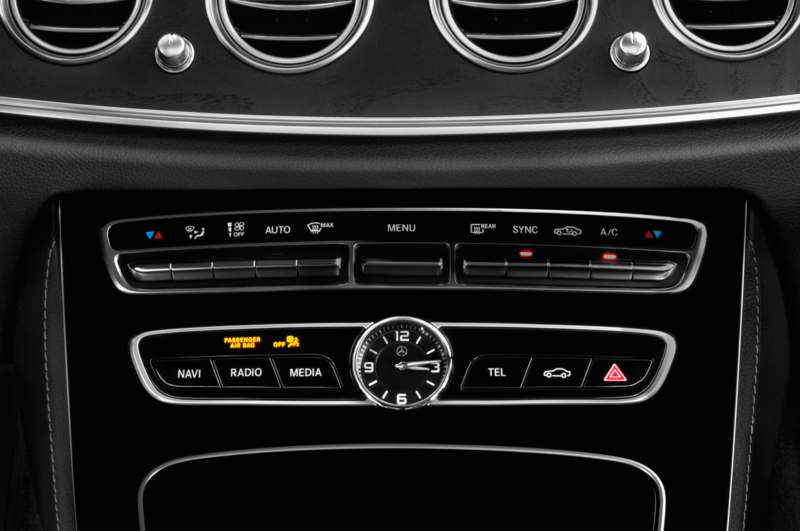 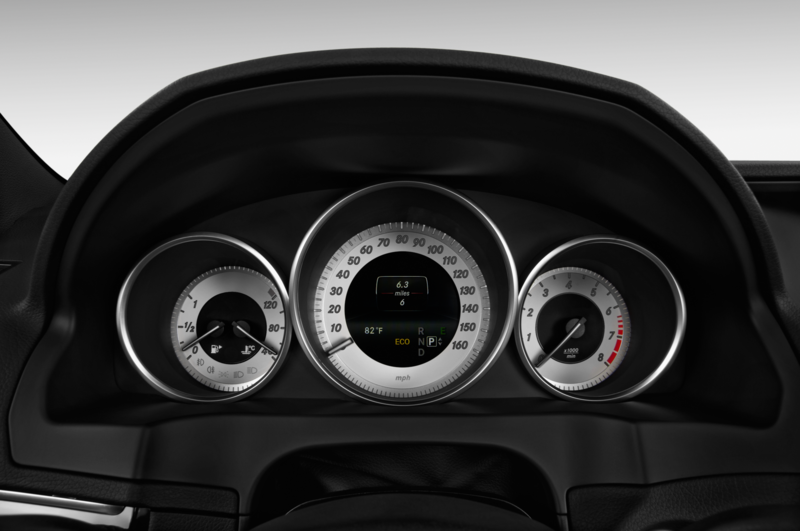 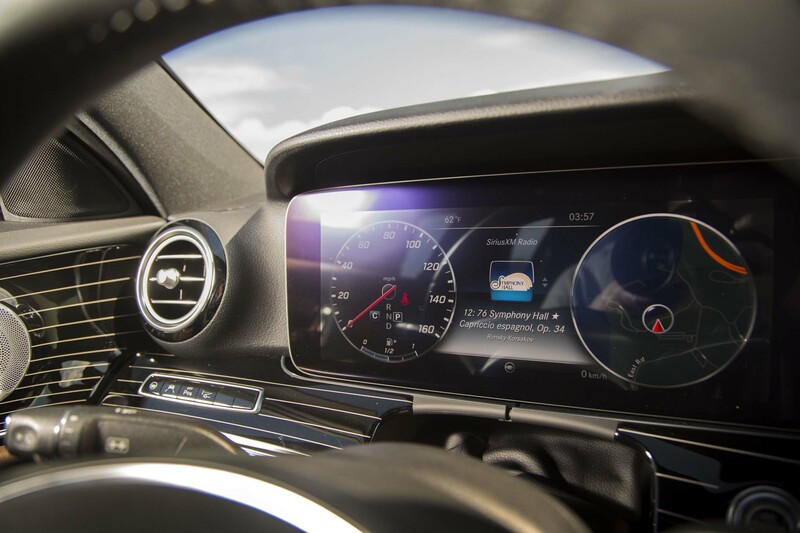 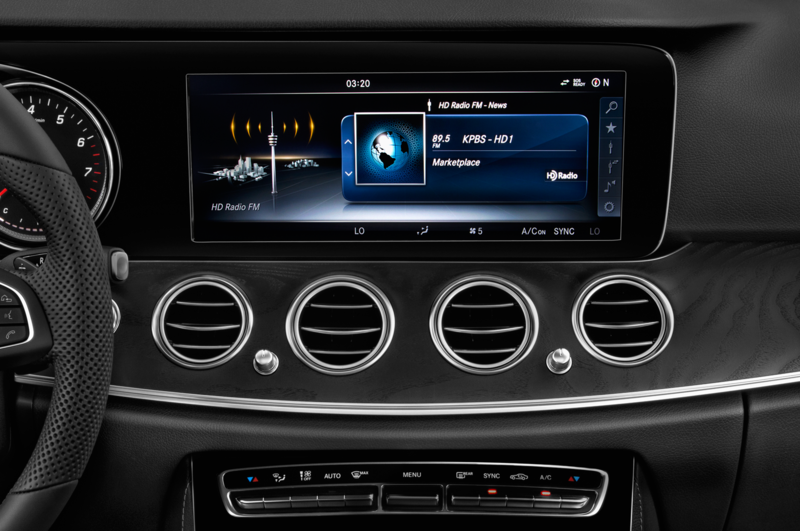 Sure, we figured out how to get to most of the features somewhat effectively but we still would prefer choosing the next music track or picking a radio preset via a button versus a multi-step process using one of the three systems fitted by Mercedes for controlling the infotainment screen. 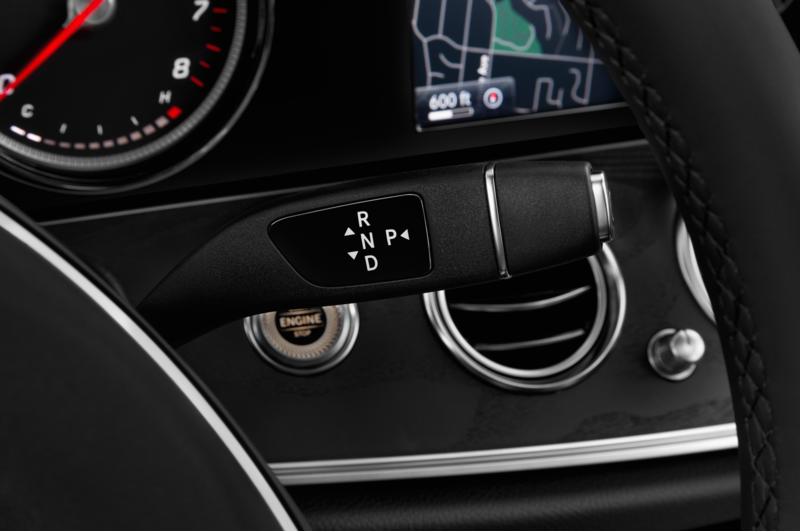 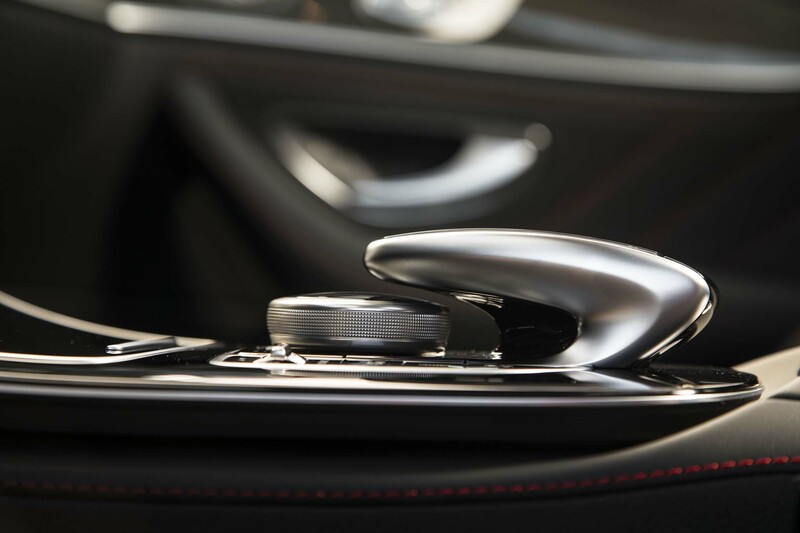 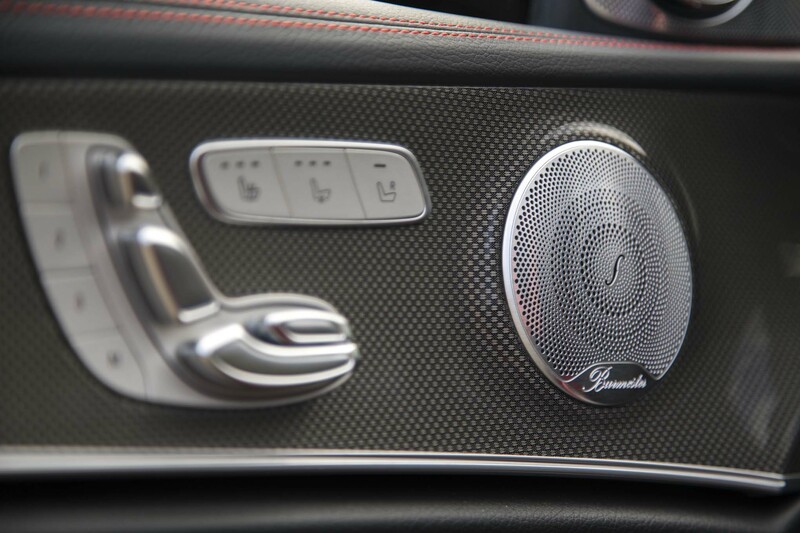 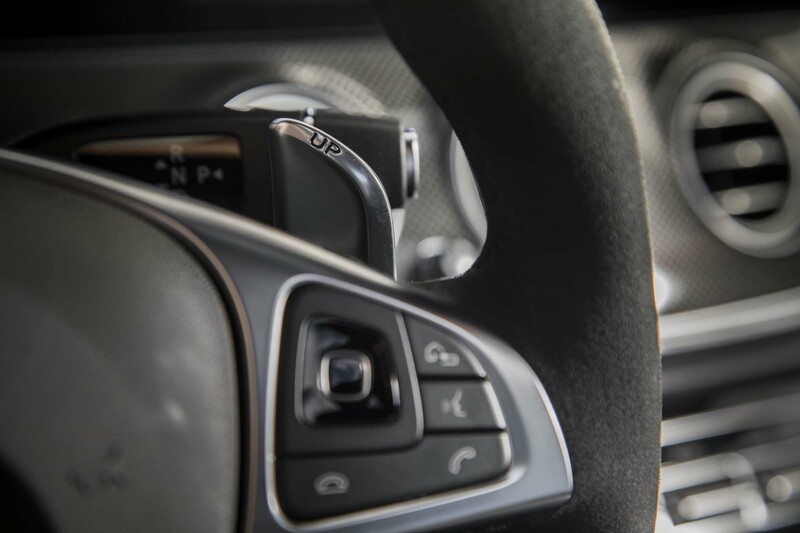 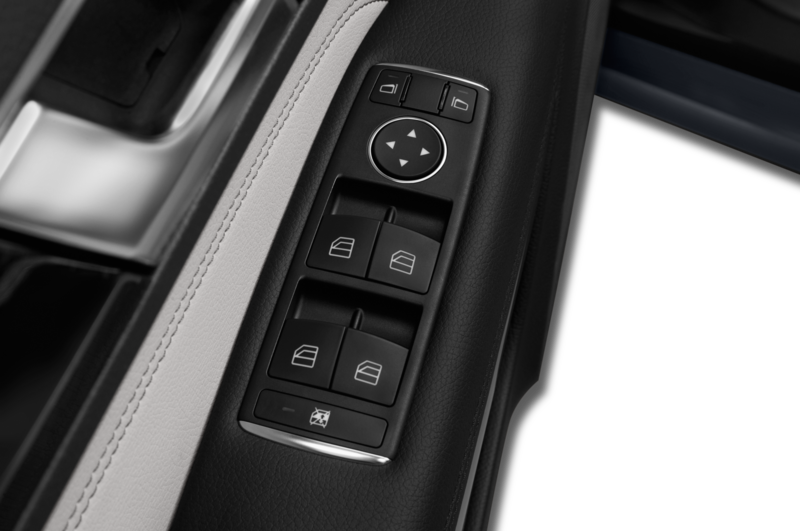 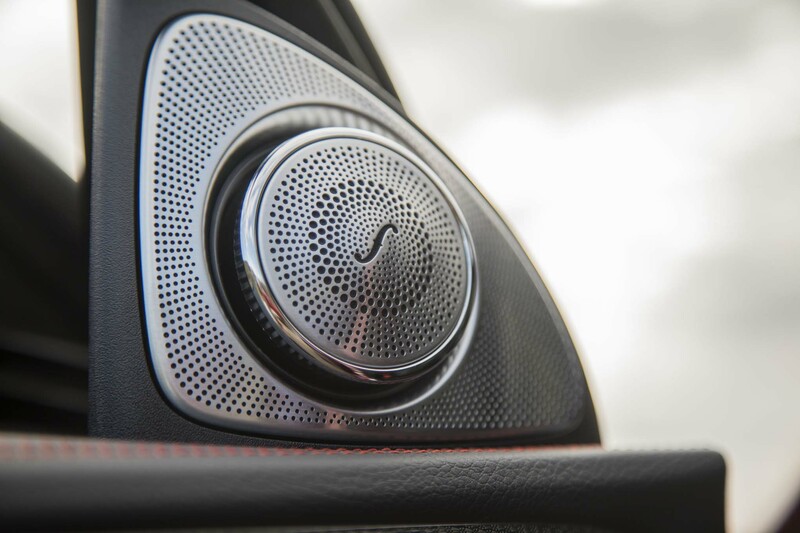 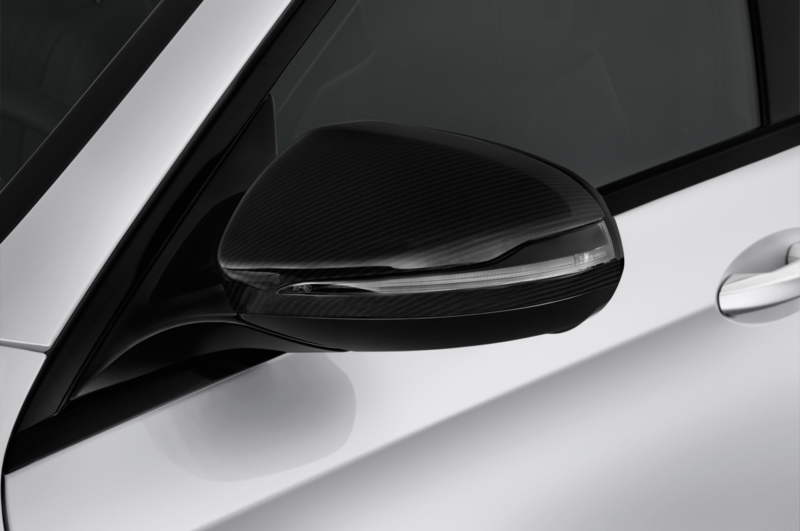 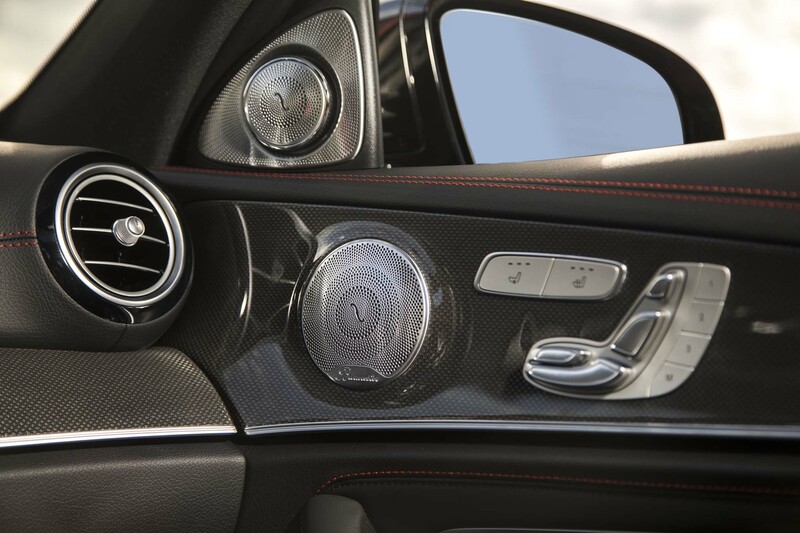 Speaking of, we found ourselves using the traditional rotary controller the majority of the time, but the centrally mounted touchpad and thumb controllers on the steering wheel both have their place and certain users may prefer their function. 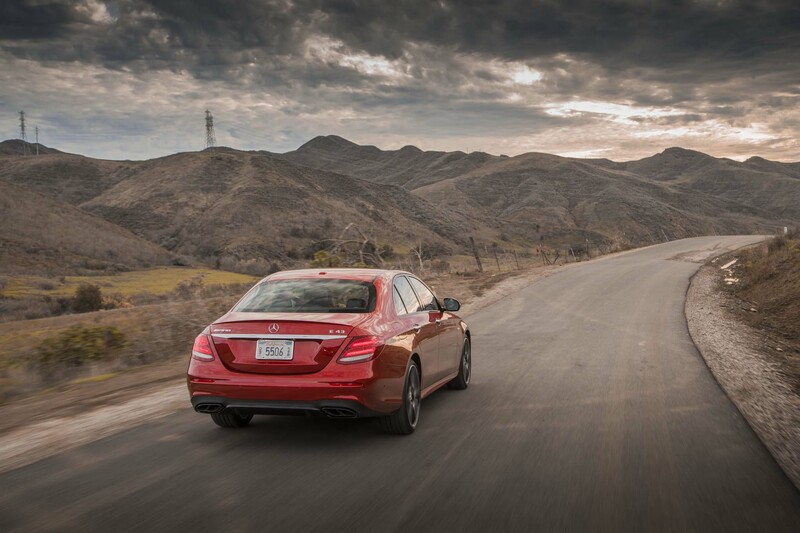 It’s nice to have choices. 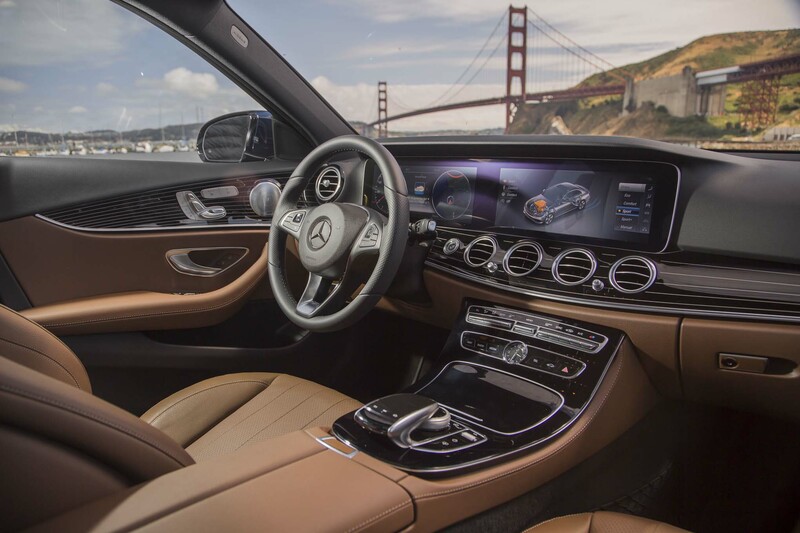 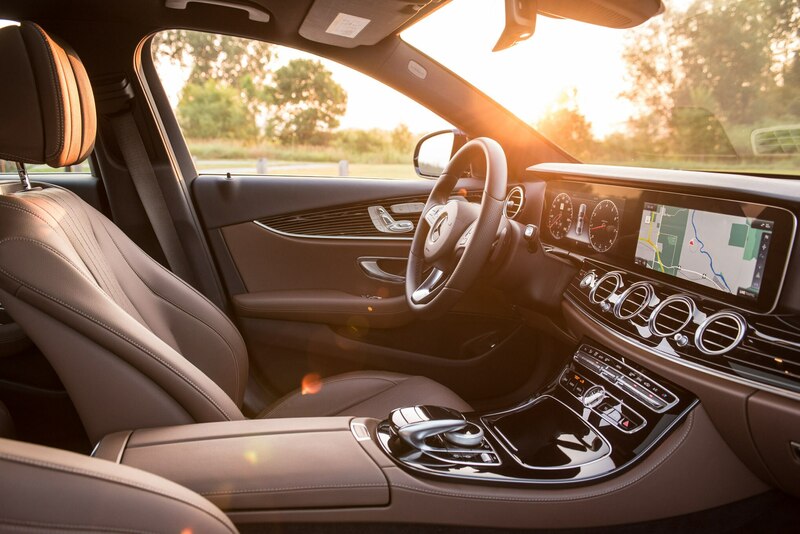 Overall, we love the quality and aesthetic design of the interior in new E-Class but we wish it wasn’t such a stylistically-led progression compared to the extremely functional layout in the old car. 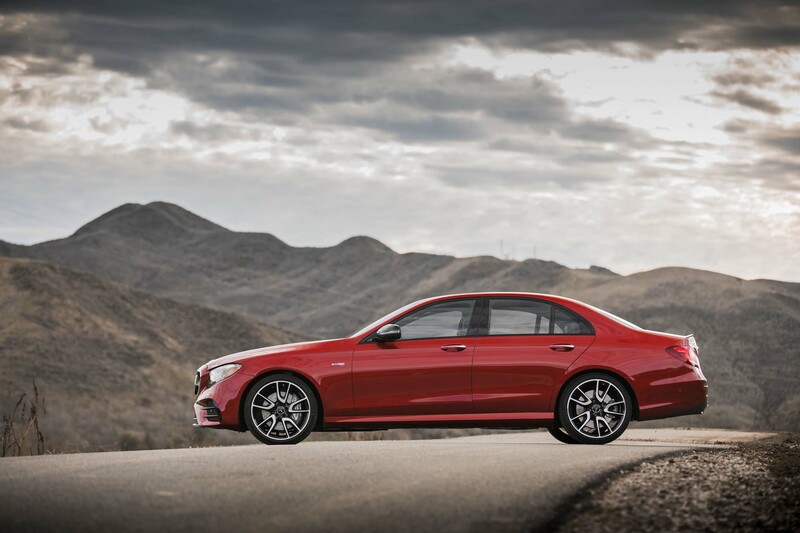 It’s clearly apparent after a month with the new E-Class that the BMW 5-Series and, to a lesser degree, the Audi A6, are both the sportier options in the class. 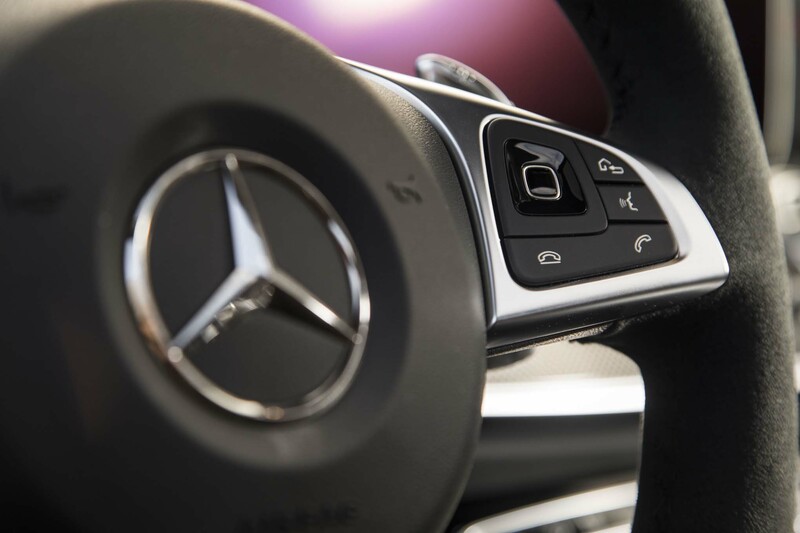 That’s nothing new and should surprise few. 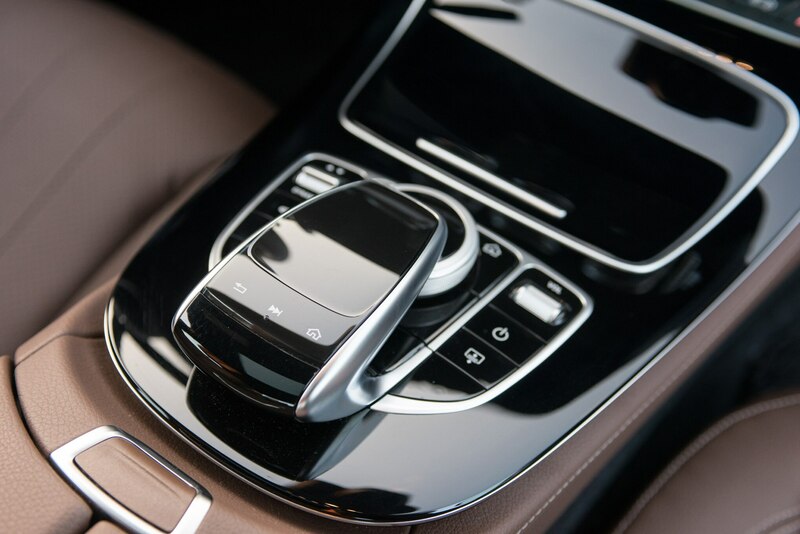 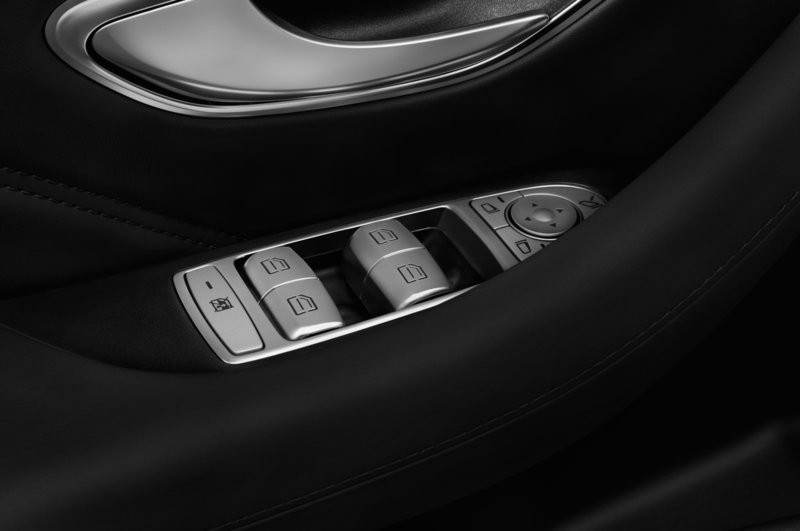 Mercedes’ traditional lazy throttle pedal remains in the E300, as does the more relaxed transmission calibration. 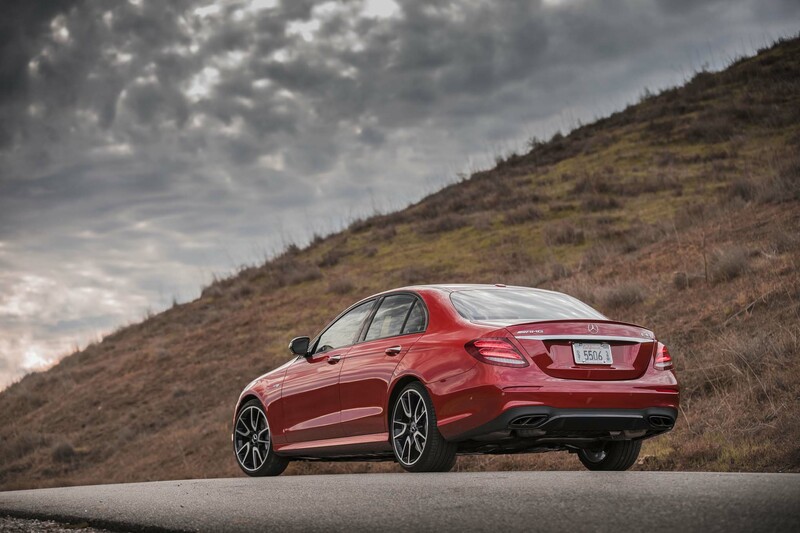 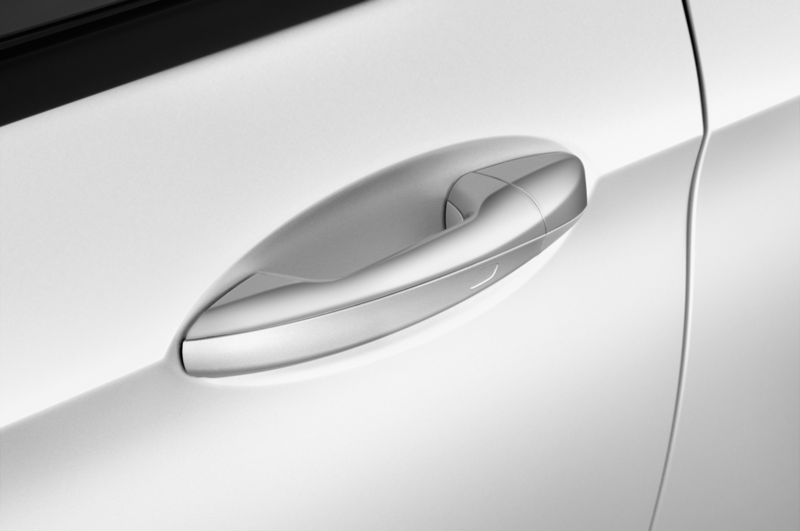 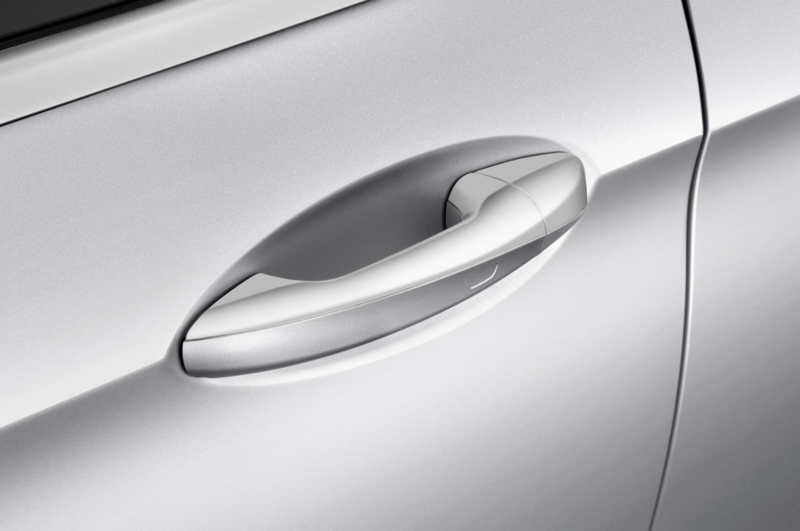 These aren’t negatives, per se, as they fit the long-standing character of the E-Class—a character that we quite appreciate. 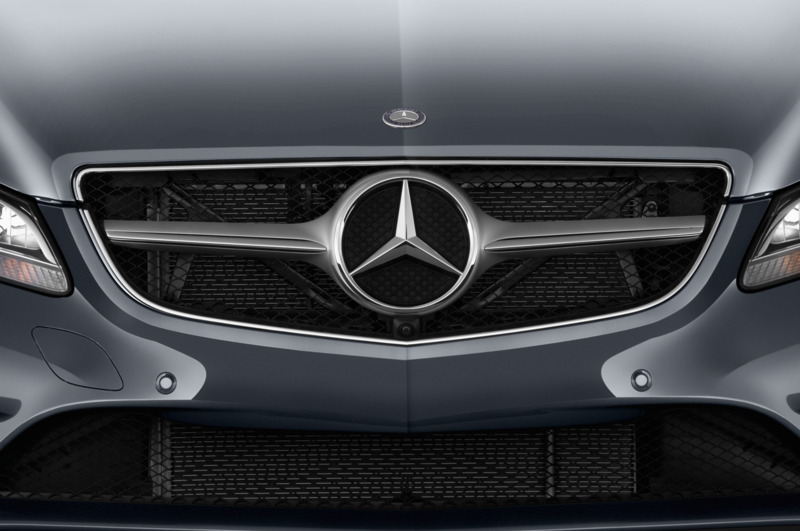 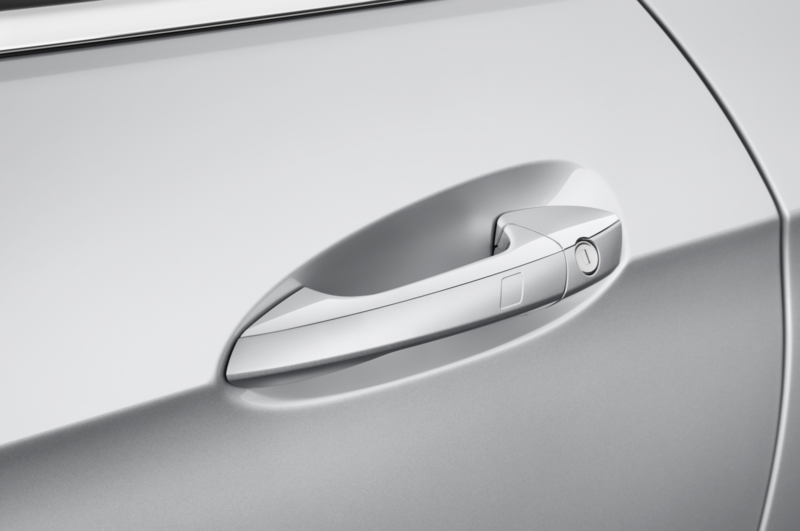 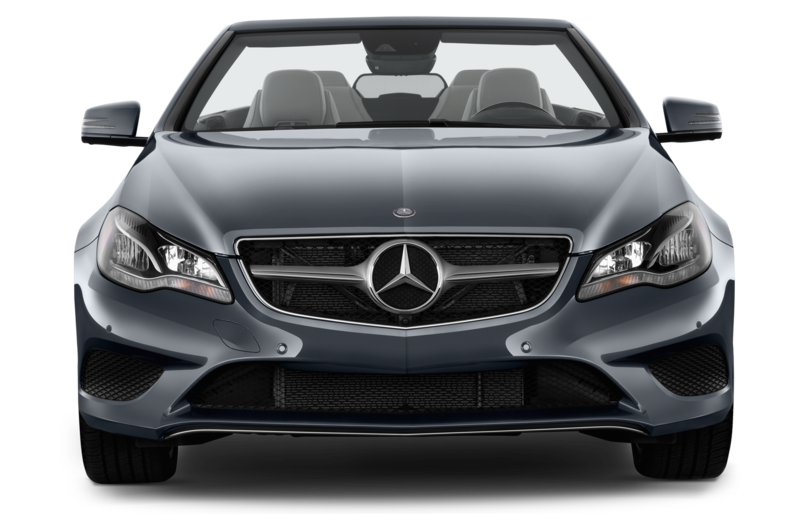 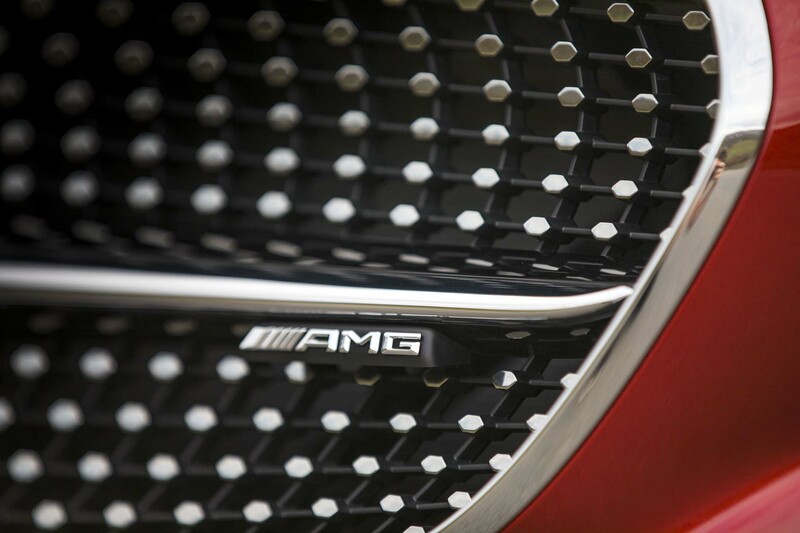 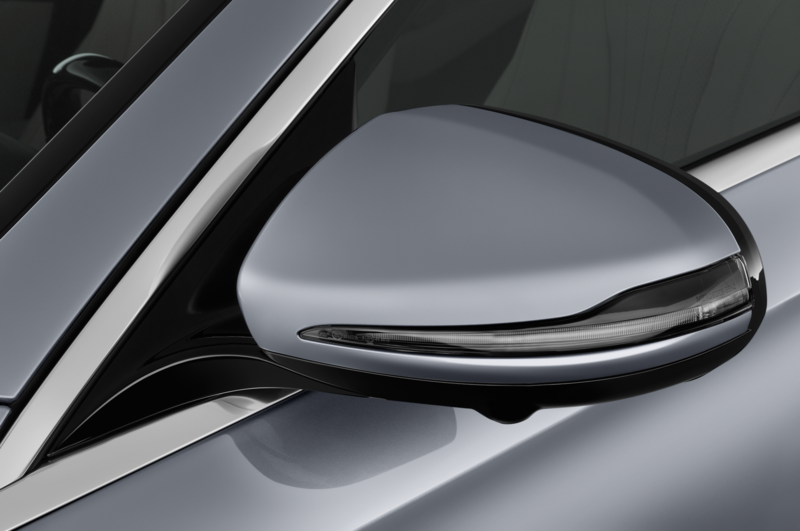 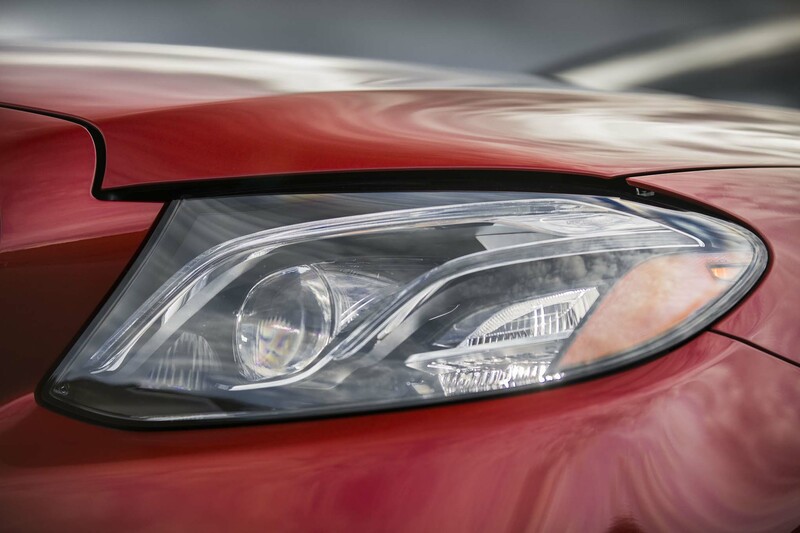 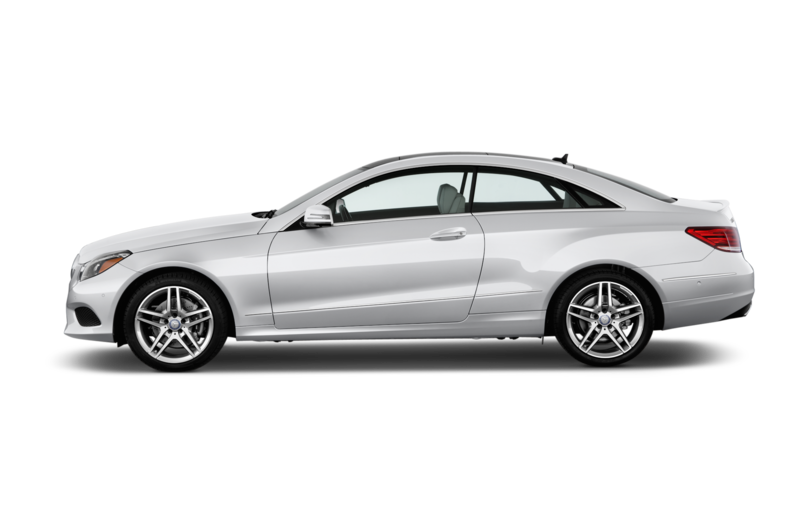 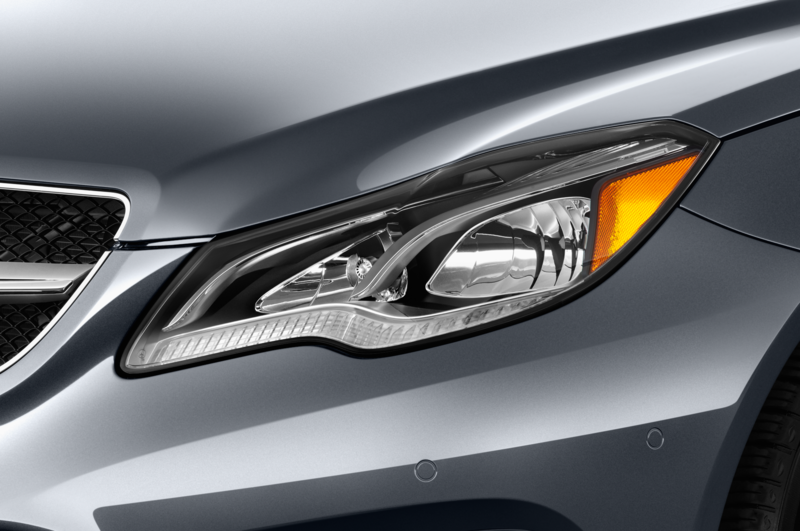 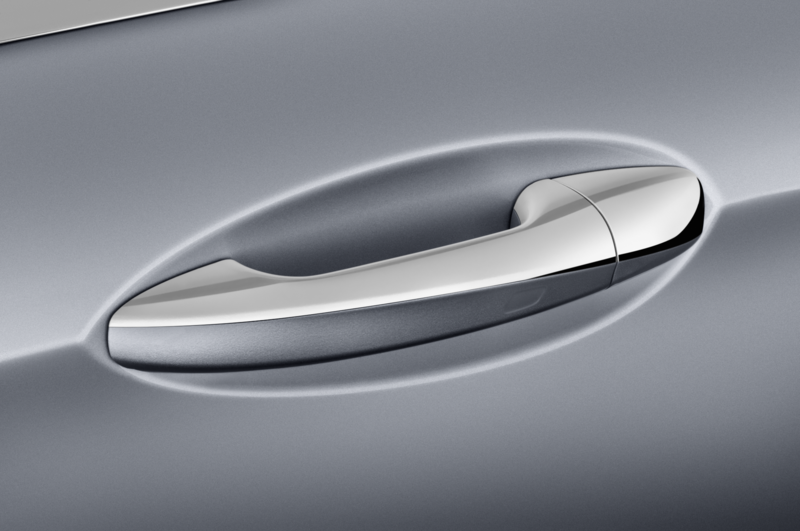 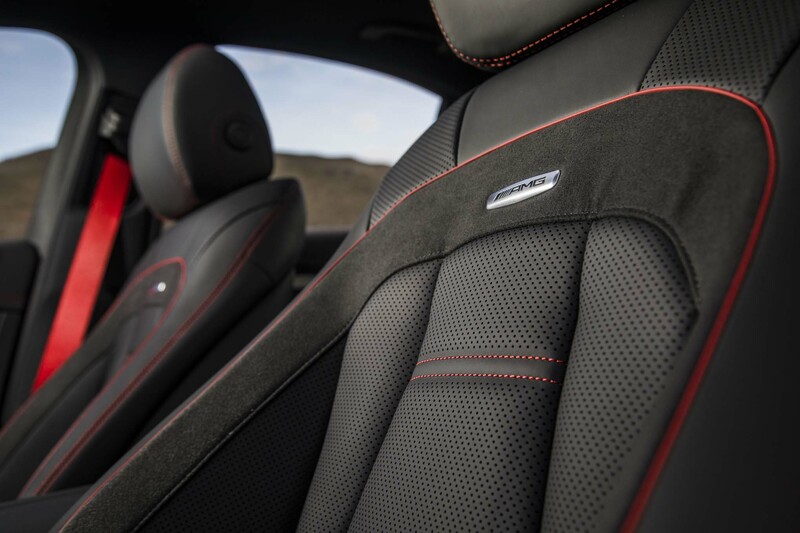 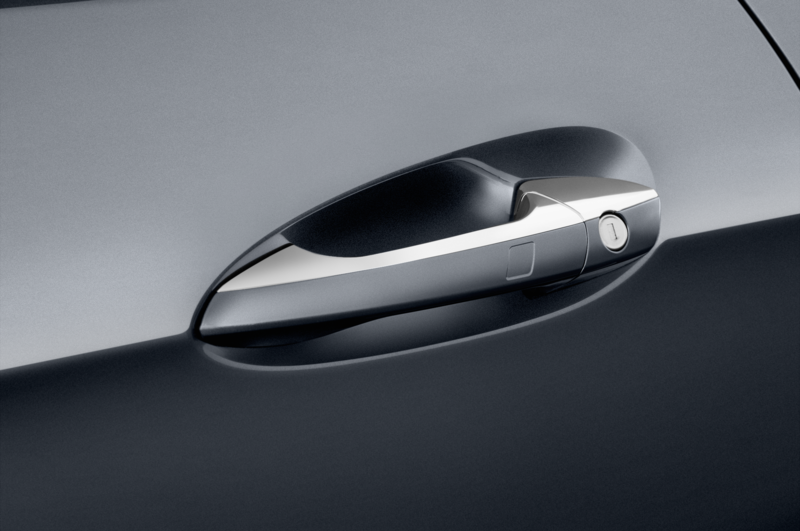 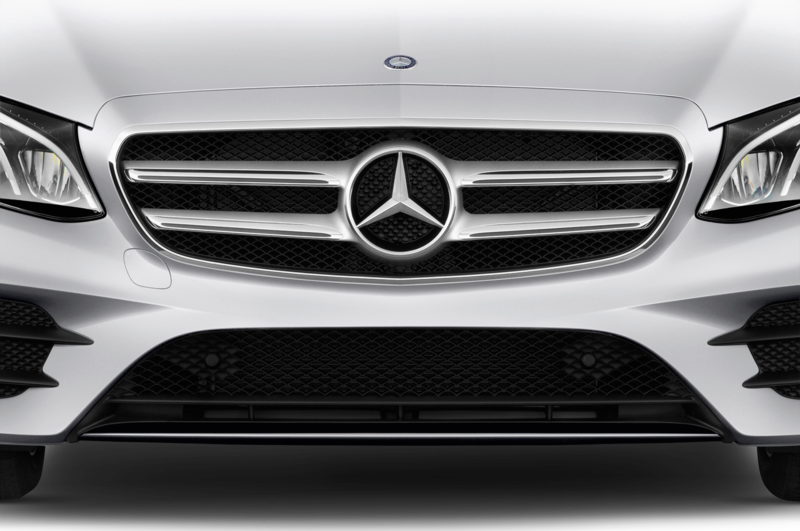 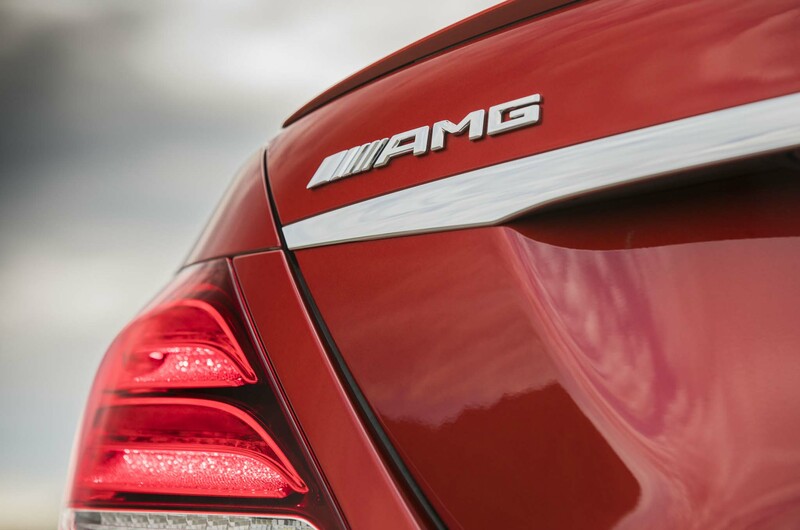 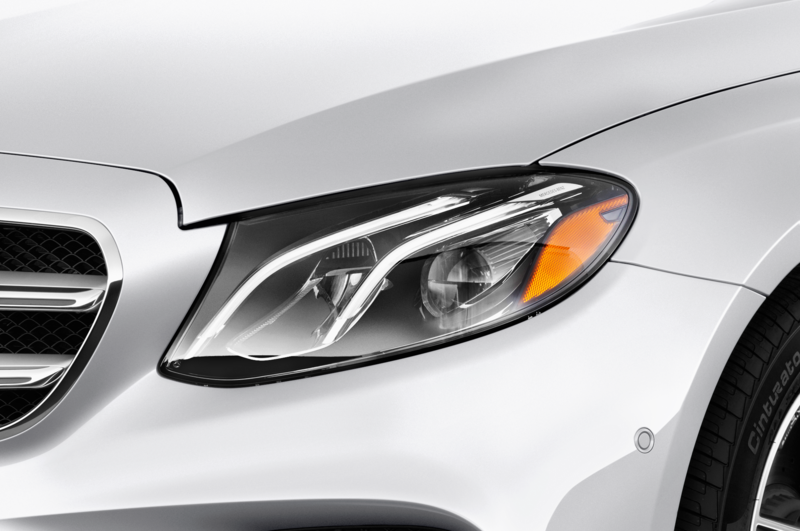 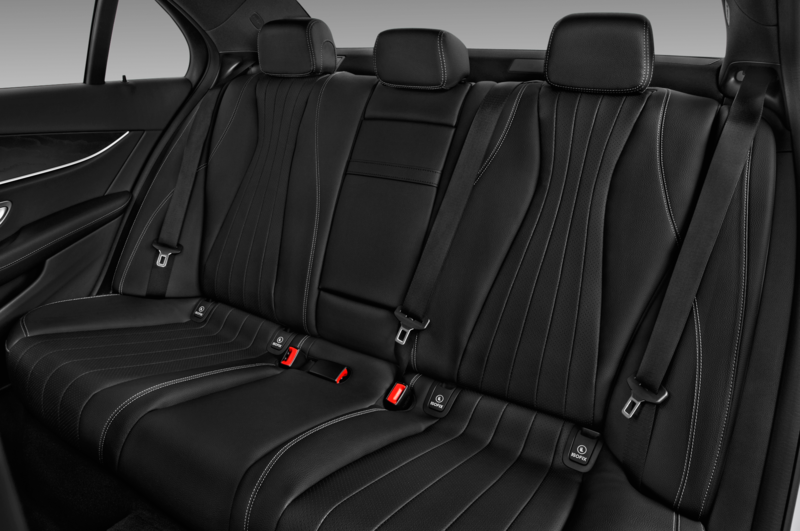 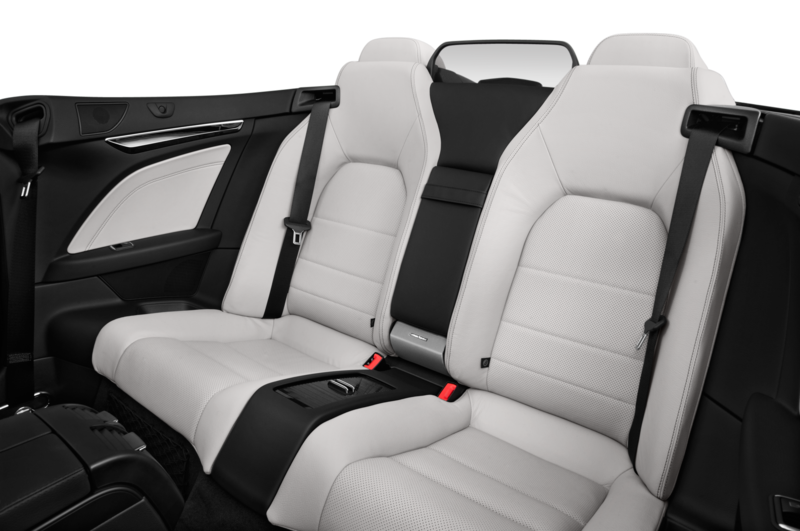 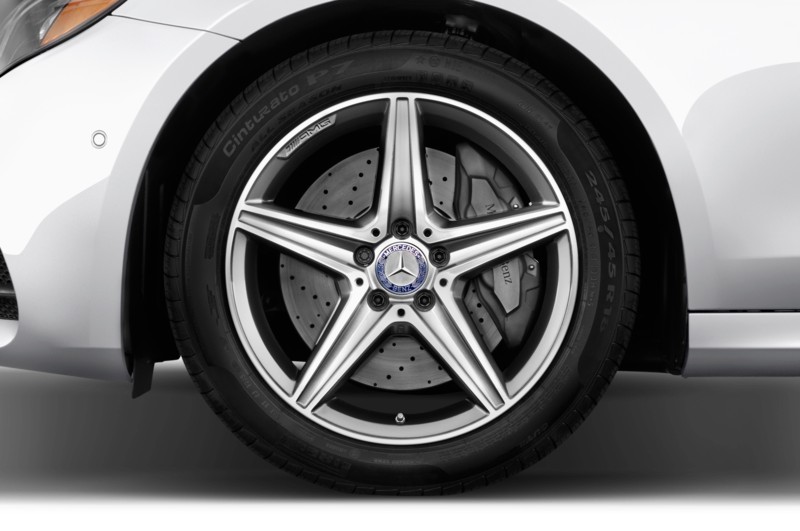 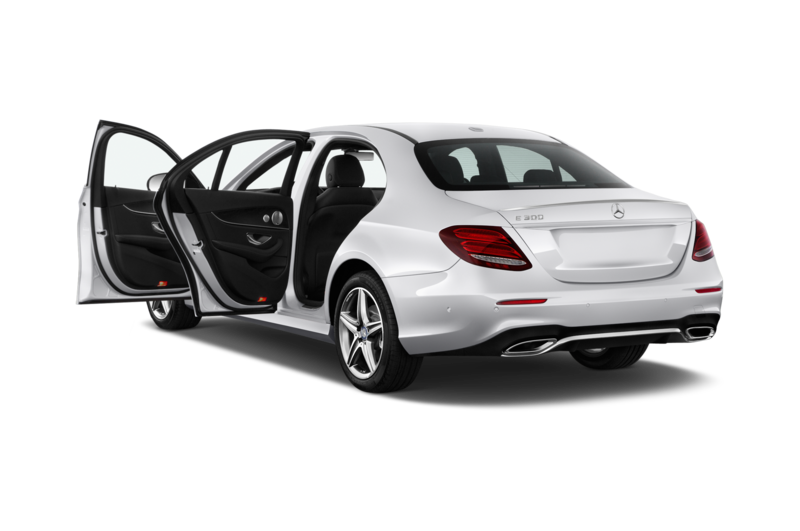 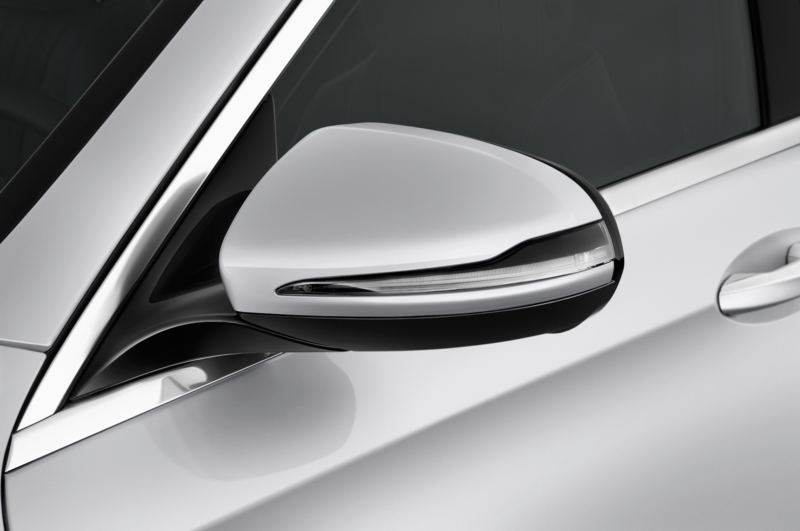 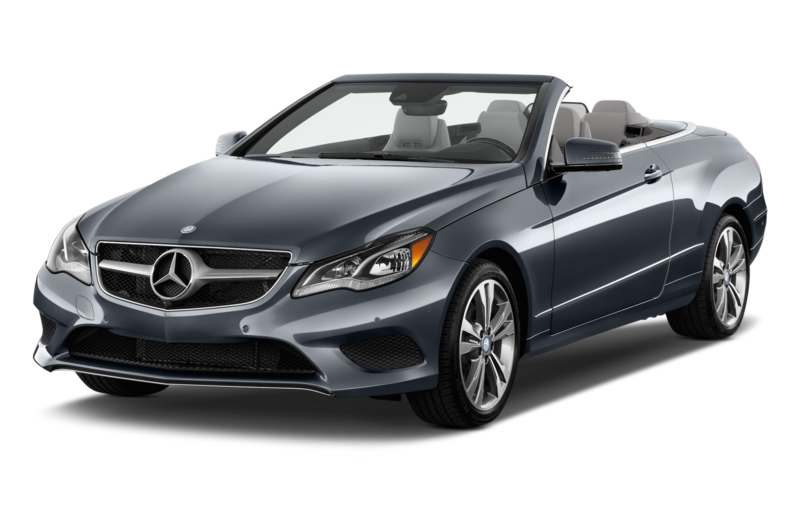 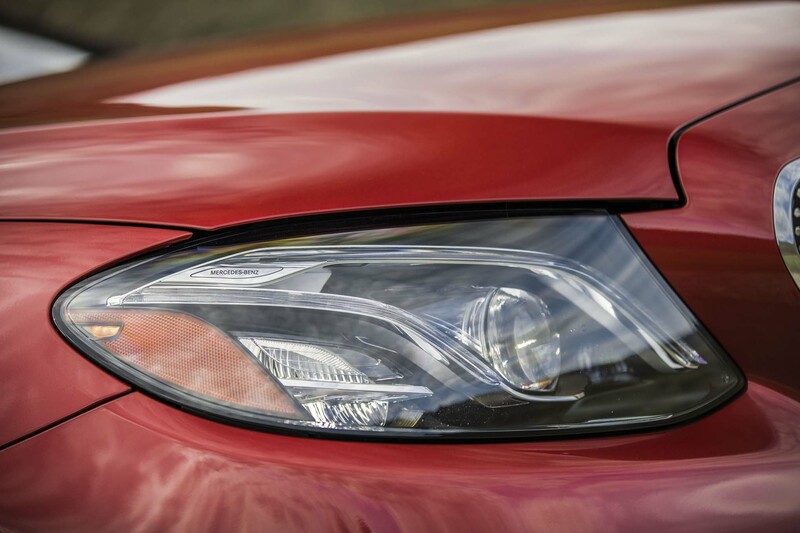 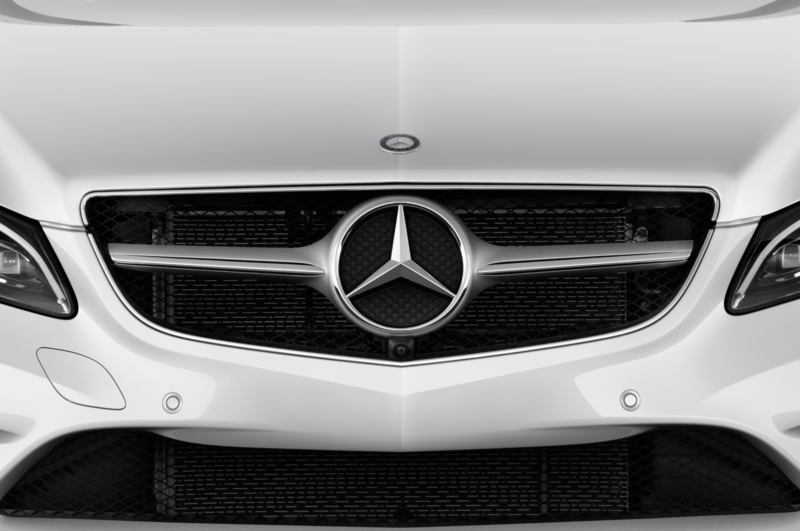 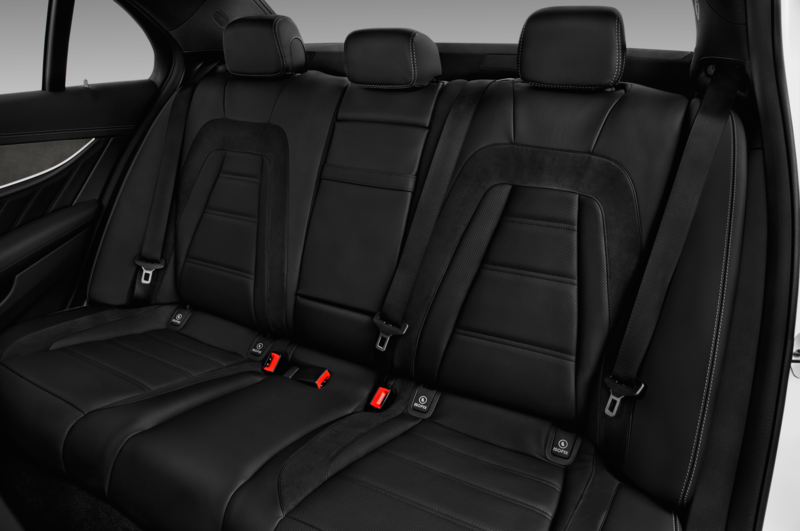 The Mercedes is a very refined and quiet automobile, with an unmistakable depth of engineering. 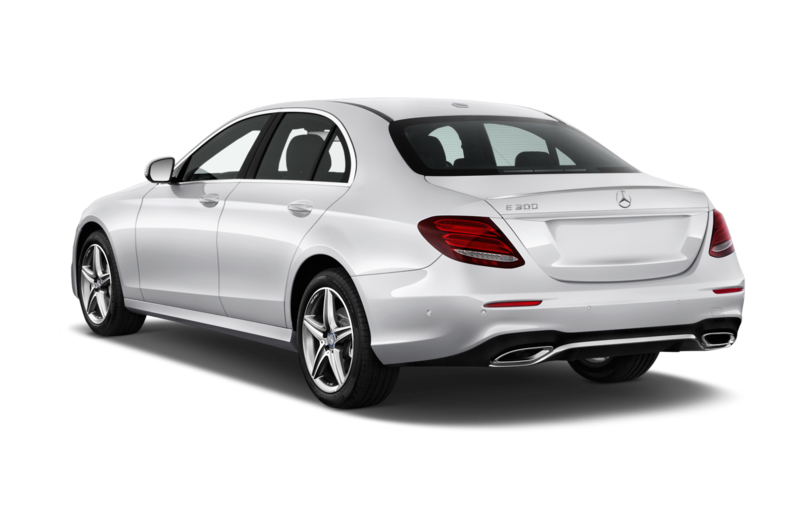 Some may complain about the lack of a V6 engine in the base E-Class but the off-idle grunt of the turbocharged engine fits the E300 nicely in the majority of driving conditions. 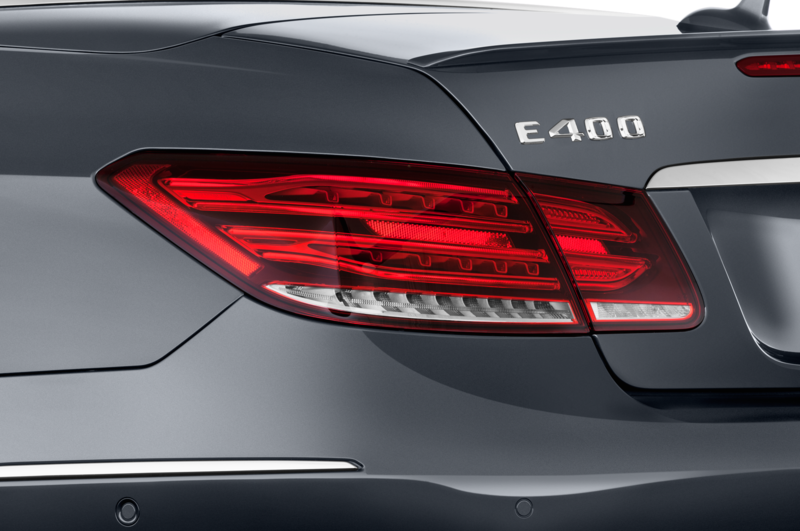 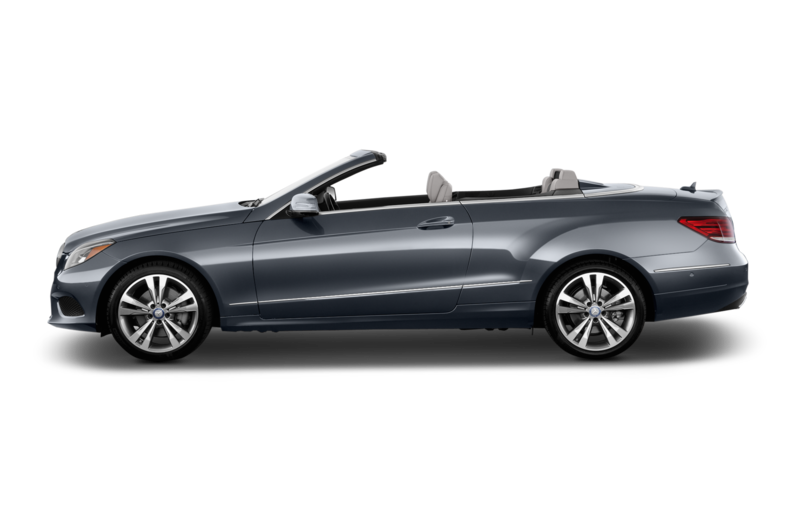 Both BMW and Audi have long offered a gasoline four-cylinder engine in this midsize luxury car segment, and it was only a matter of time before the pursuit of fuel economy standards forced the company carrying the three-pointed star to follow suit in the U.S. market. 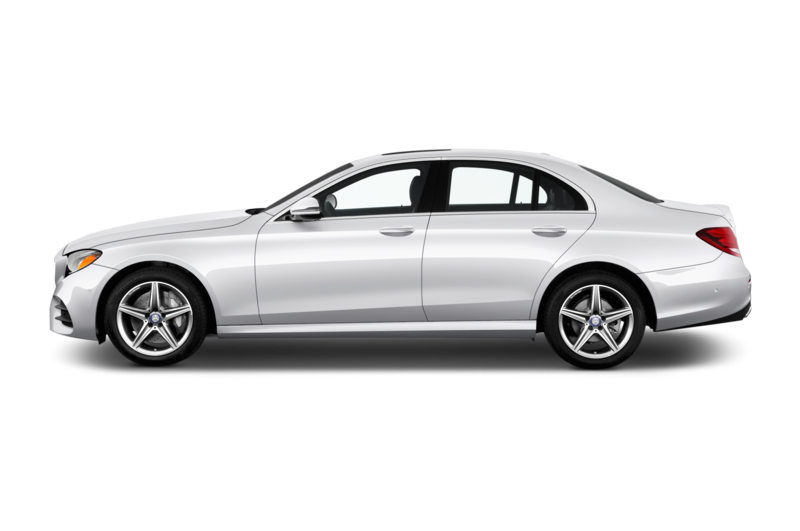 Remember, it’s the lemming-like Germans we’re talking about. 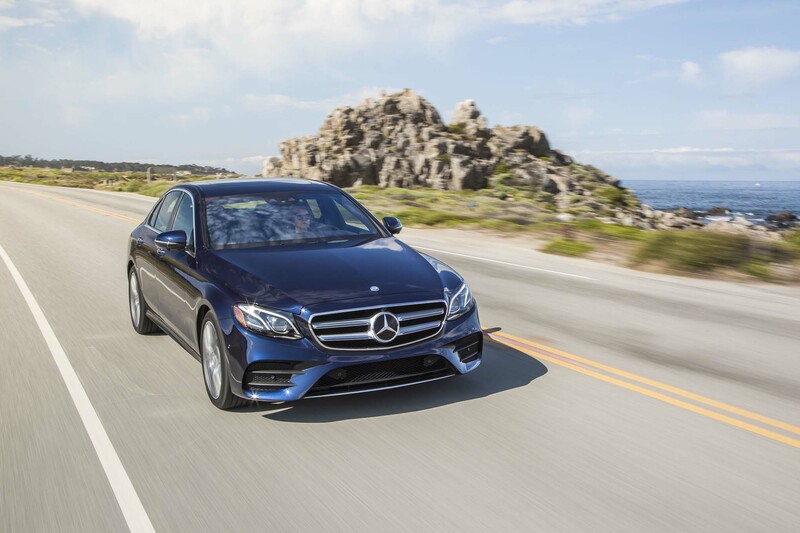 The key is that the new E300 is still 100% a Mercedes through and through and stays true to what makes the E-Class such an impressive automobile to live with day-to-day.